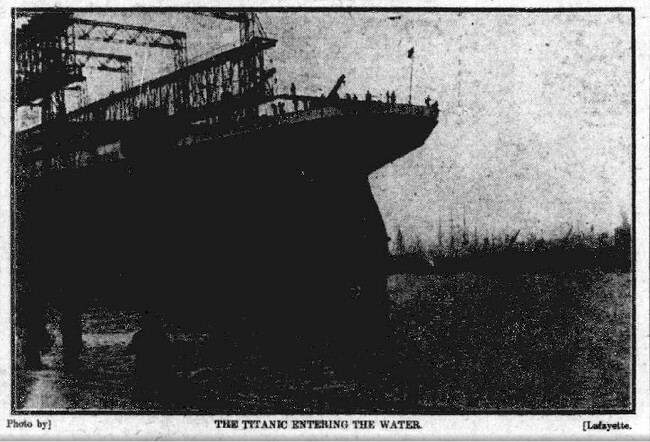 One of the major criticisms of James Cameron's 1997 Titanic is that the boat deck of the ship is too brightly lit. 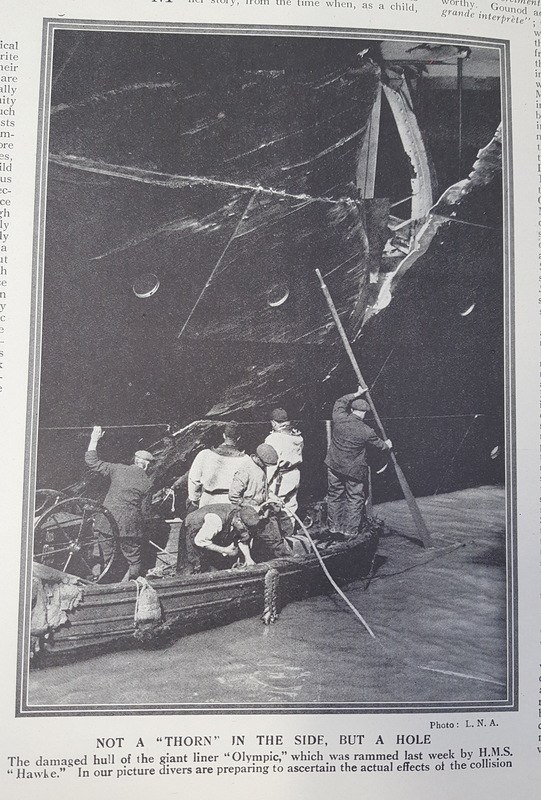 This was for purely cinematc reasons: the film wouldn't be much of a spectacle if the audience couldn't see what was happening (the same reason that 5th Officer Lowe was given a flashlight as he looked for survivors in the water). 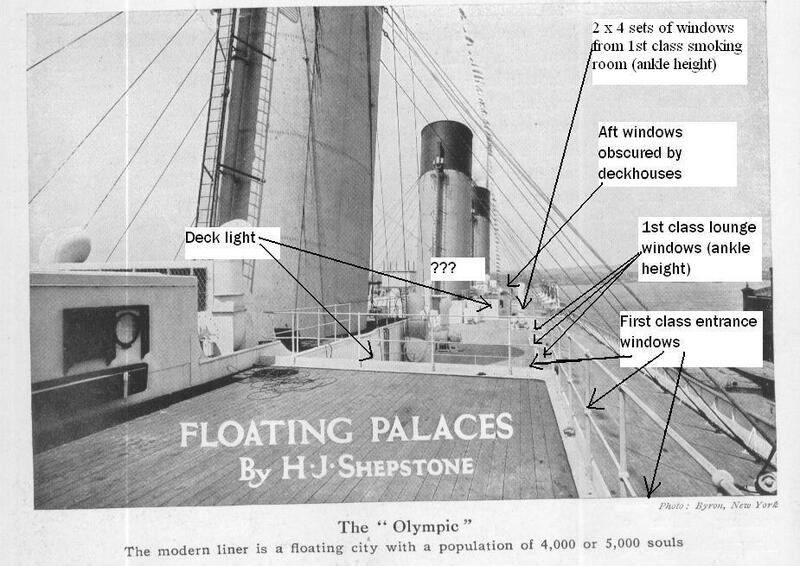 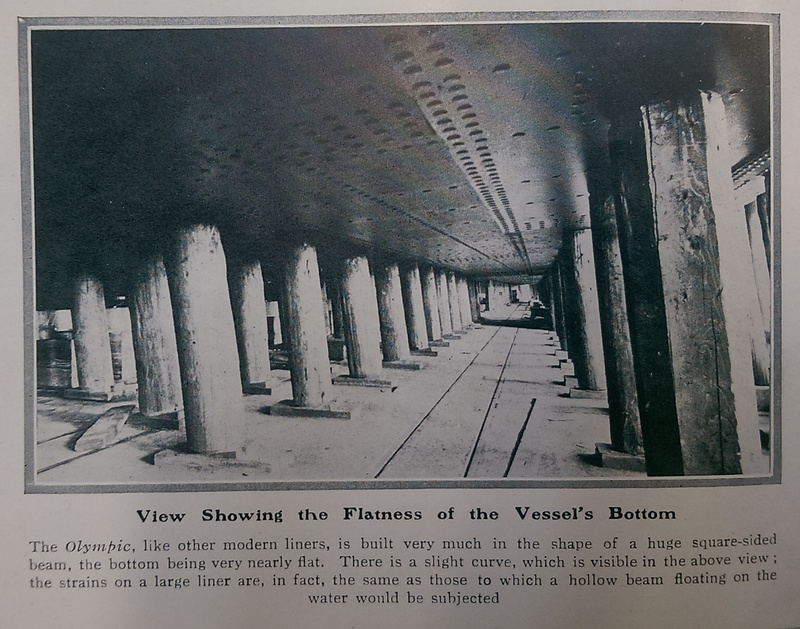 Looking at this annotated version of the Olympic's boat deck, one can see how, from the area of the second funnel looking aft, there are only a few point sources of light, and the ones further aft would be obscured by intervening deck houses. 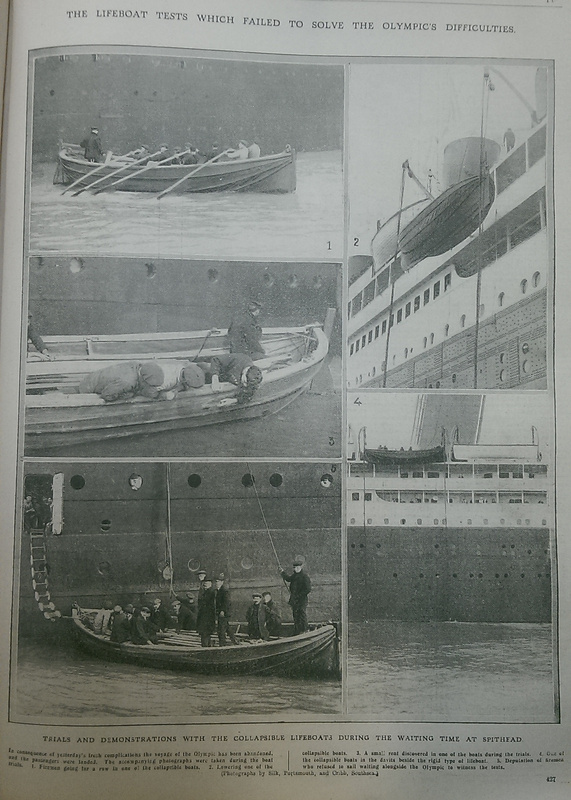 The aft lifeboats, some 200 feet away, would be nearly invisible in the gloom. 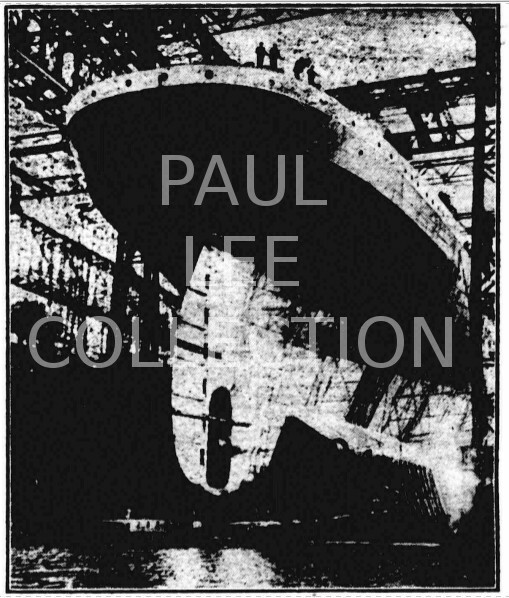 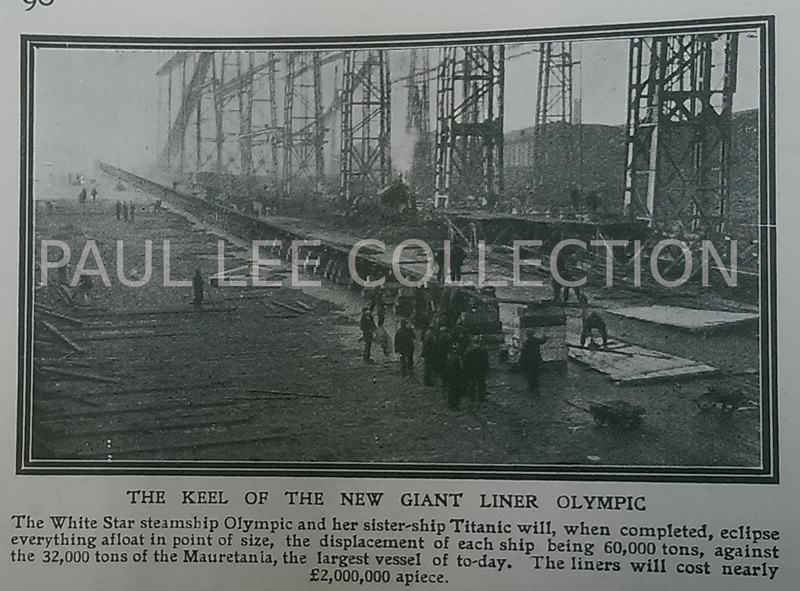 The Olympic's keel is laid. 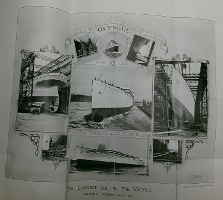 The Olympic's keel is laid; the foundation block has been marked with her yard number, 400. 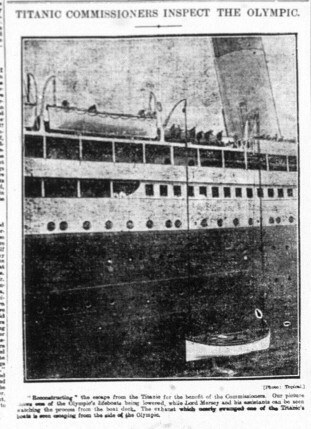 Also of interest is the fact that the reporter has been told the sister ship's name and had phonetically mistaken it for "Teutonic"! 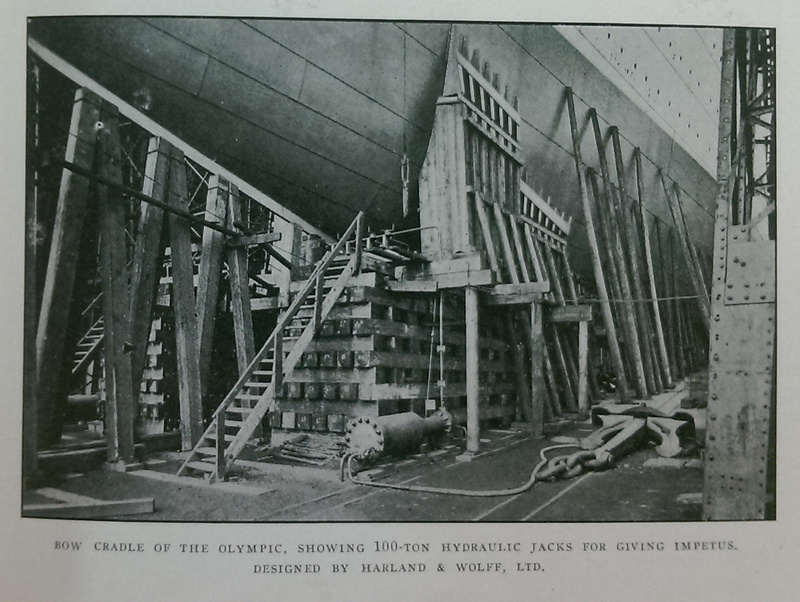 Work on the Olympic's keel and tank top progresses. 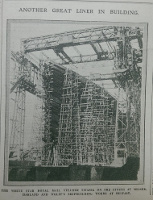 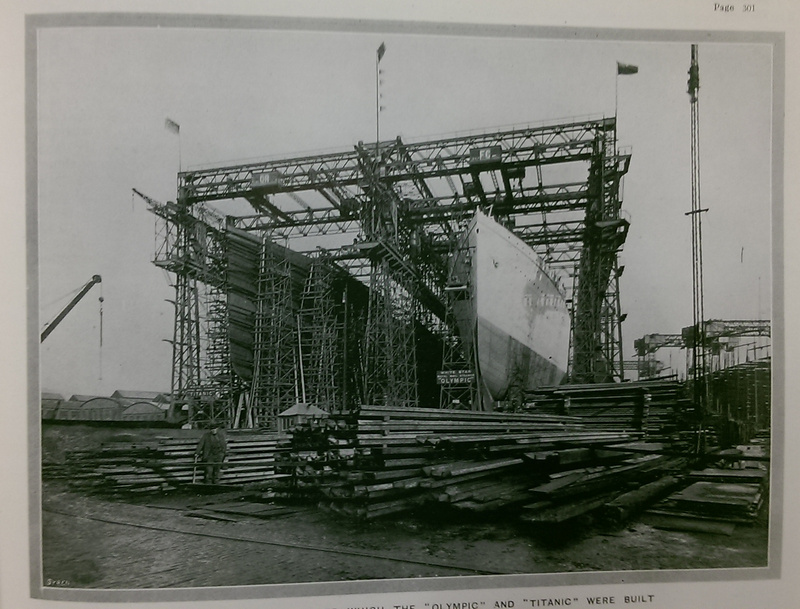 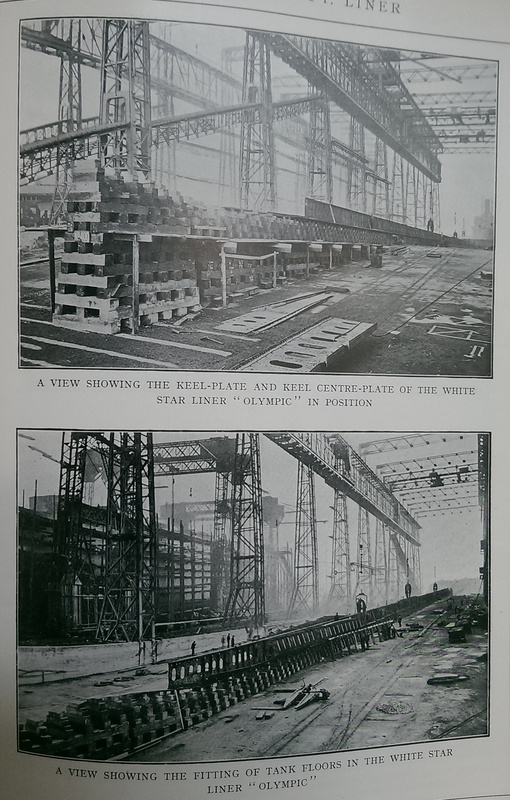 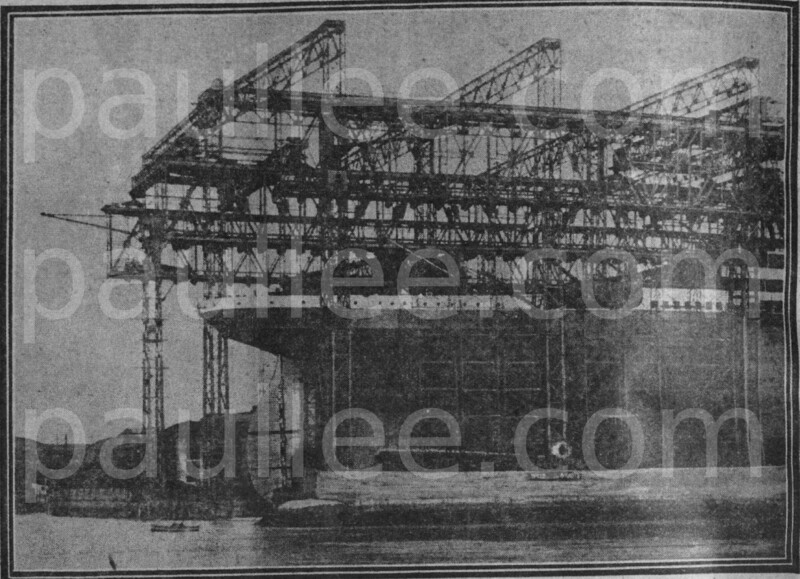 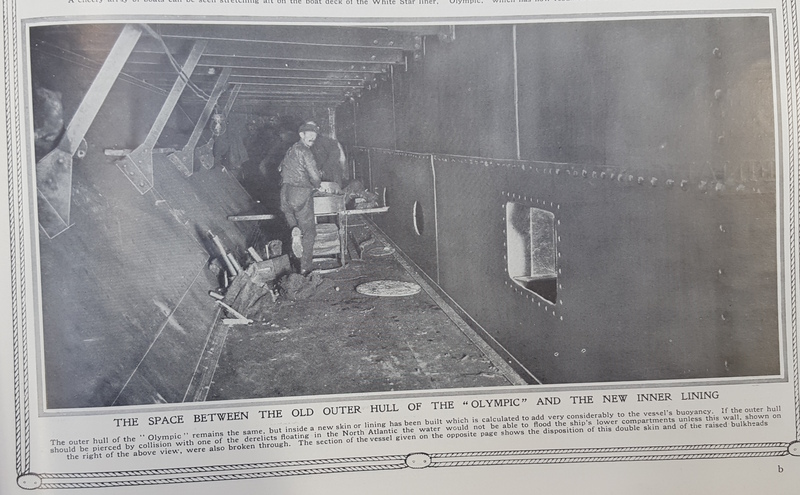 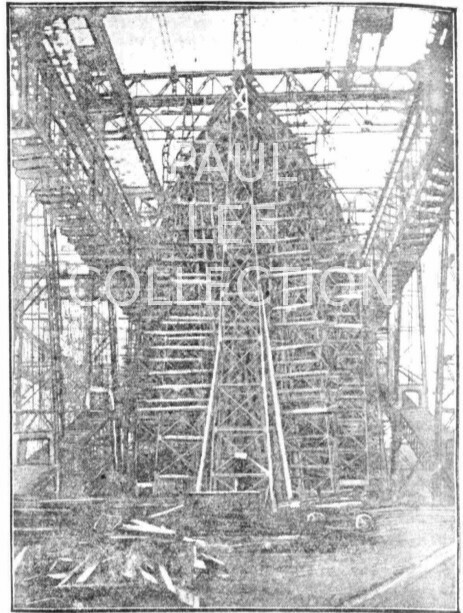 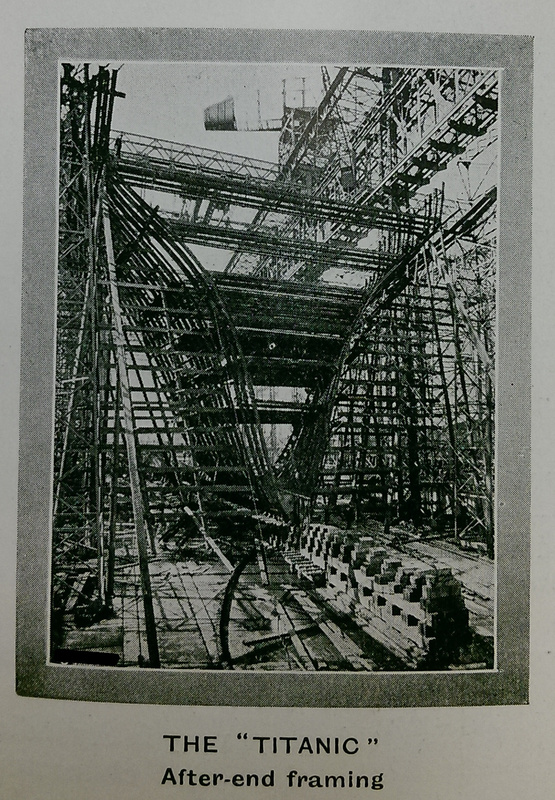 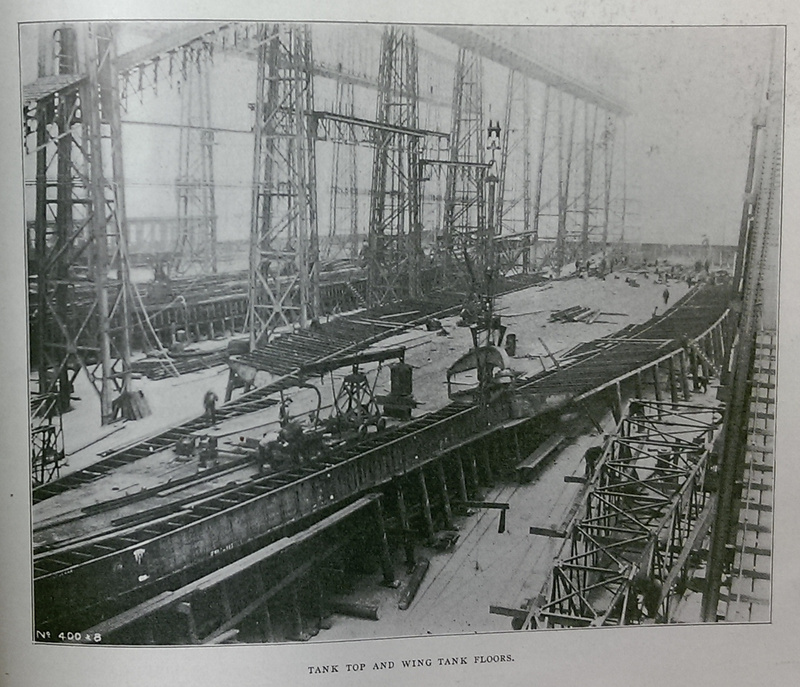 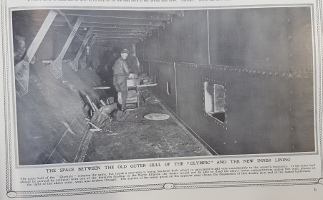 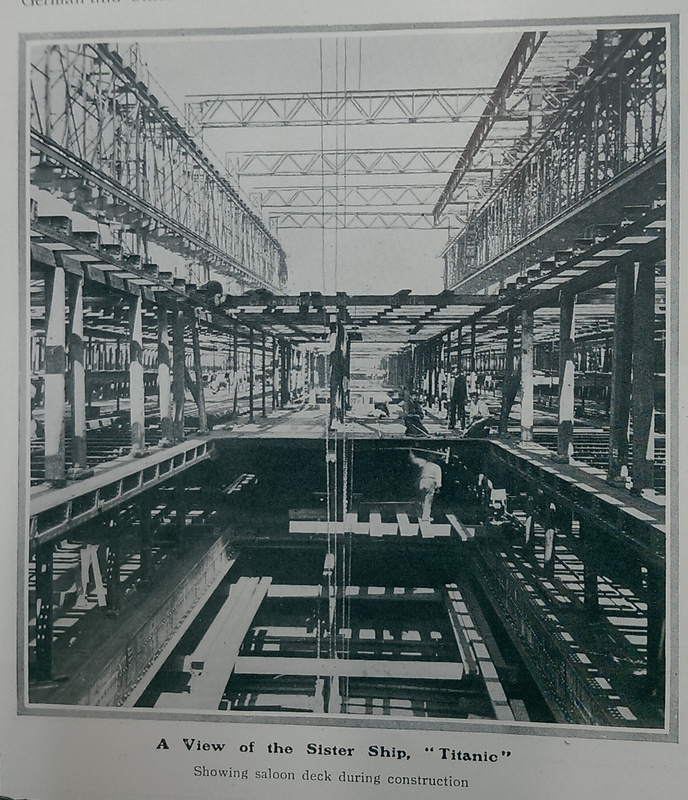 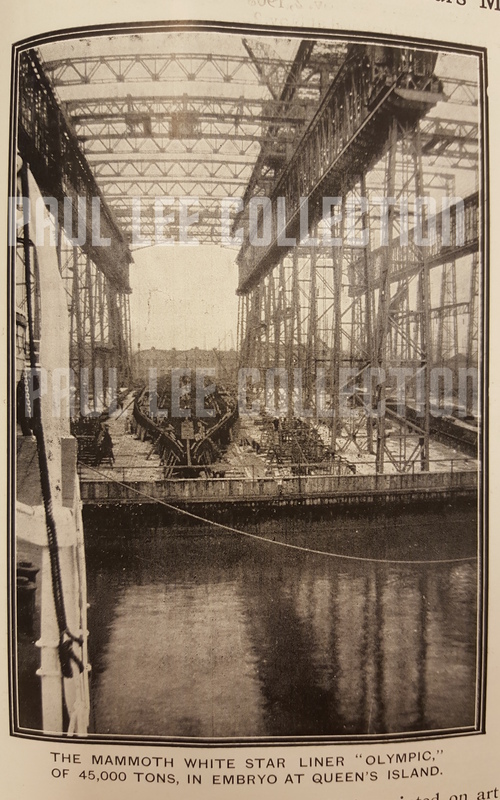 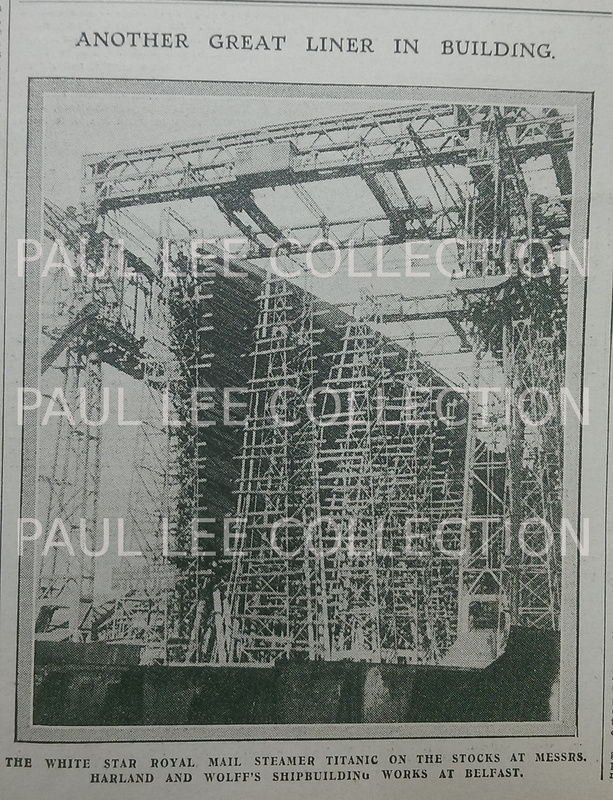 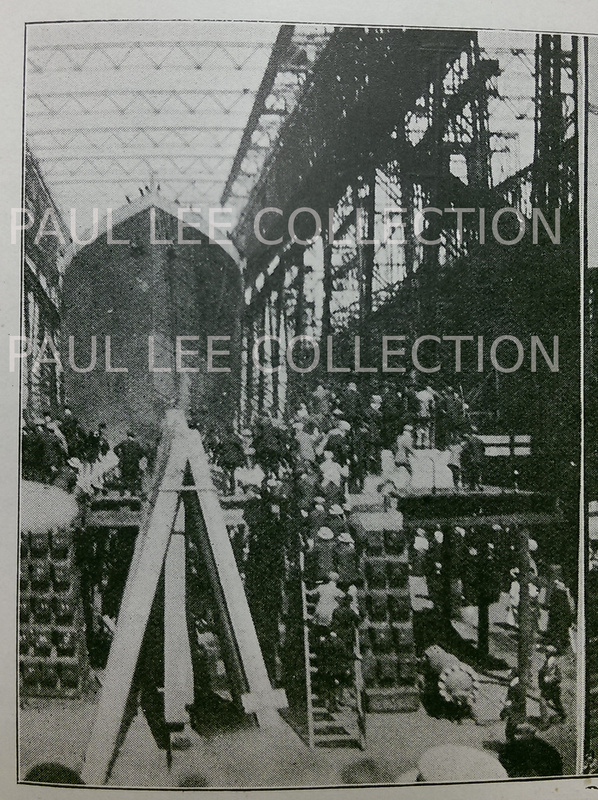 Despite what the caption says, this is actually the Olympic's aft end being framed. 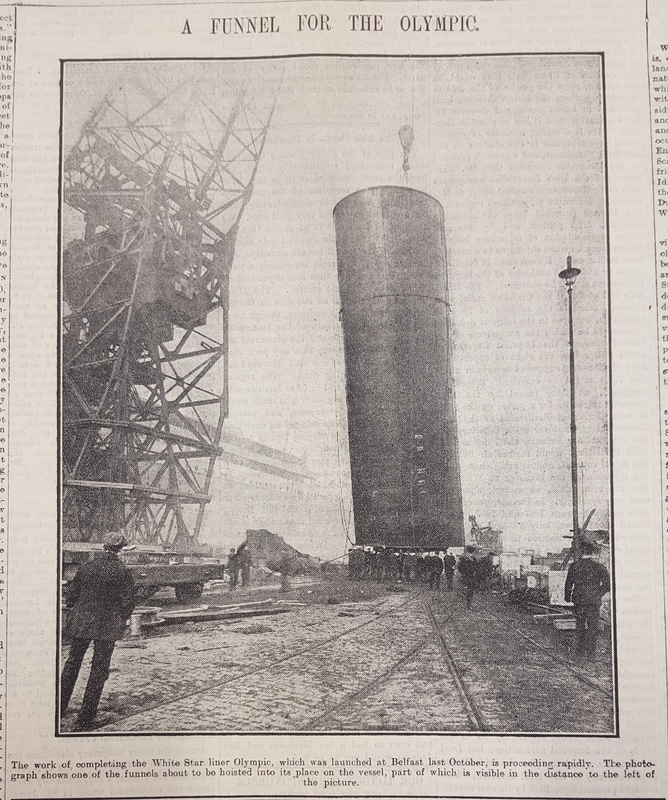 Work on the Olympic's tank top continues while the keel for the Titanic reaches a conclusion. 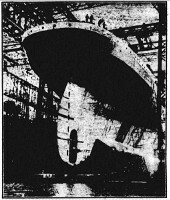 Shell plating of the two sisters. 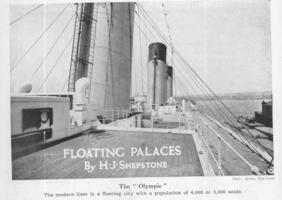 The height of the Olympic's forecastle is evident. 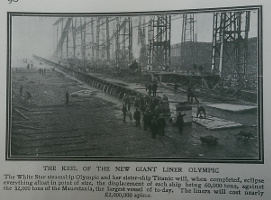 Construction of the Olympic progresses. 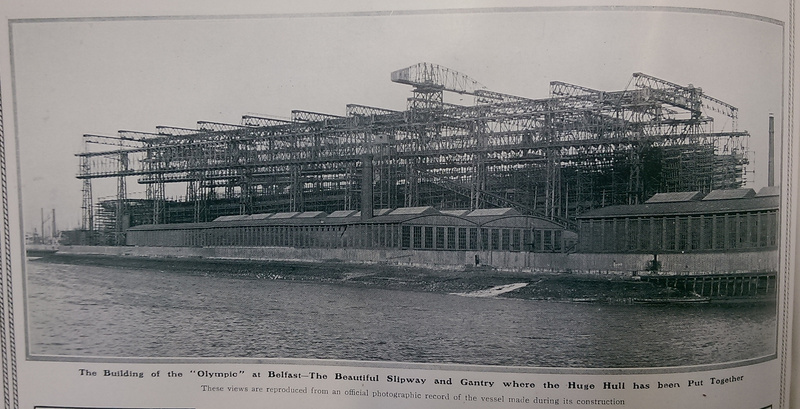 The Olympic is close to completion. 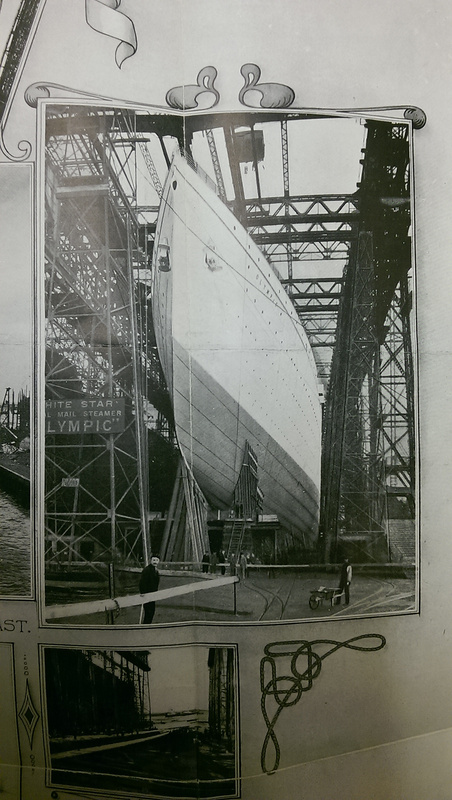 The Olympic is close to being launched, while work on the Titanic proceeds. 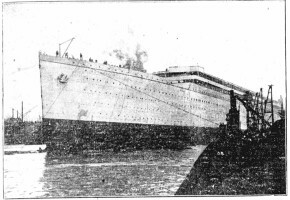 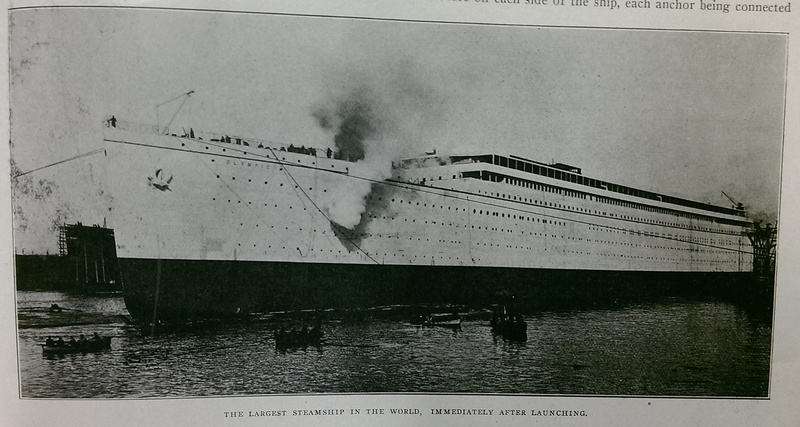 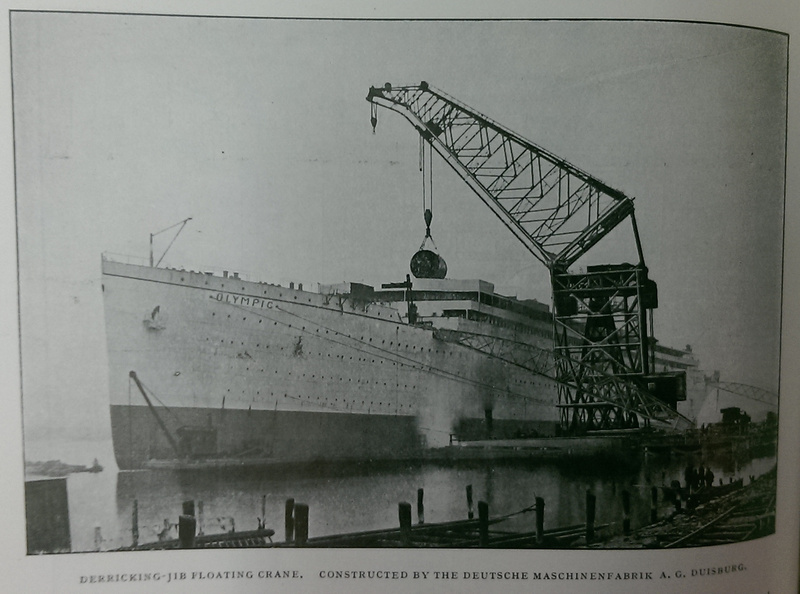 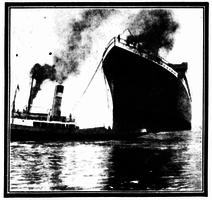 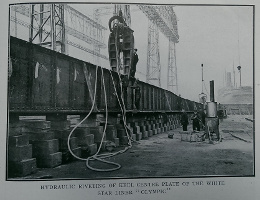 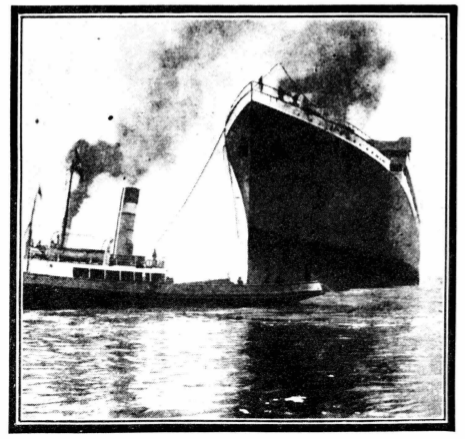 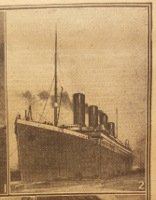 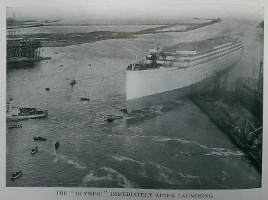 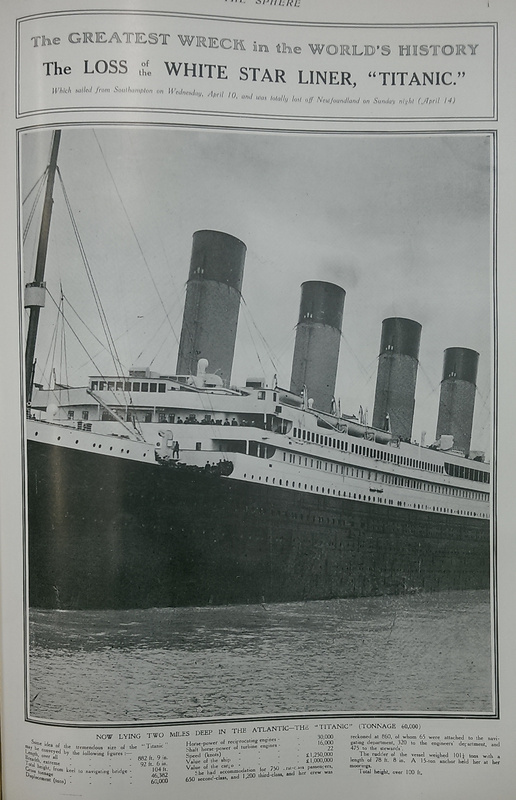 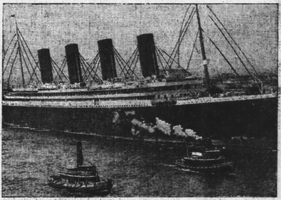 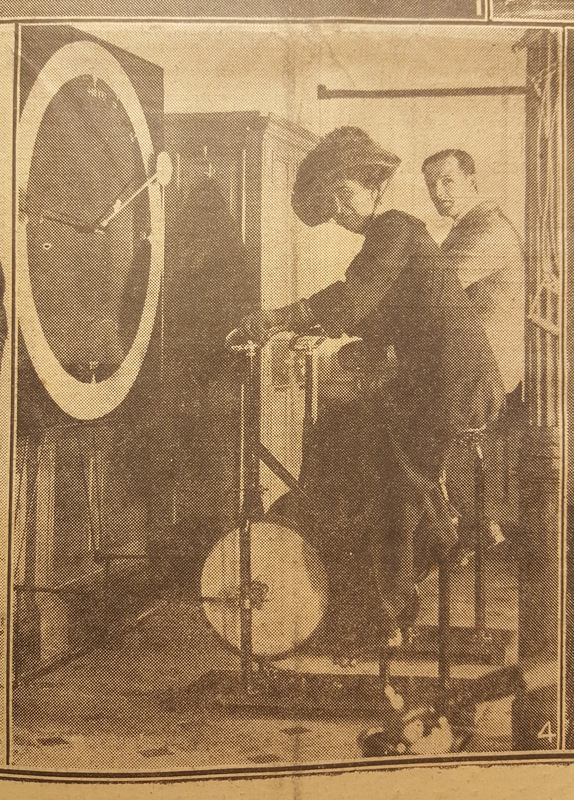 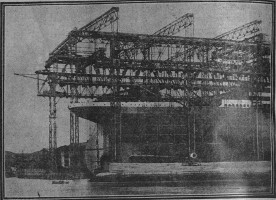 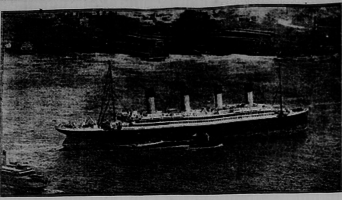 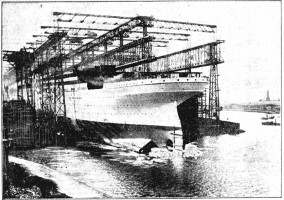 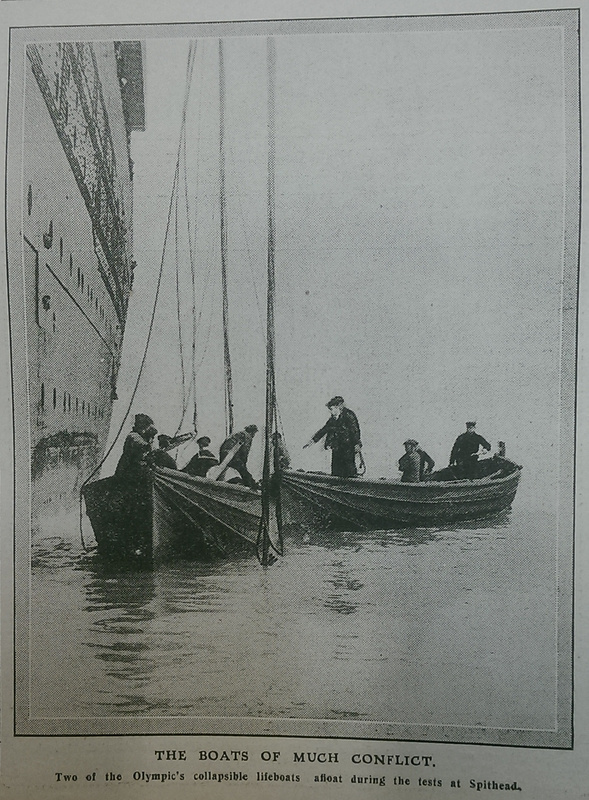 The Olympic being launched, from "The Graphic" of October 29th, 1910. 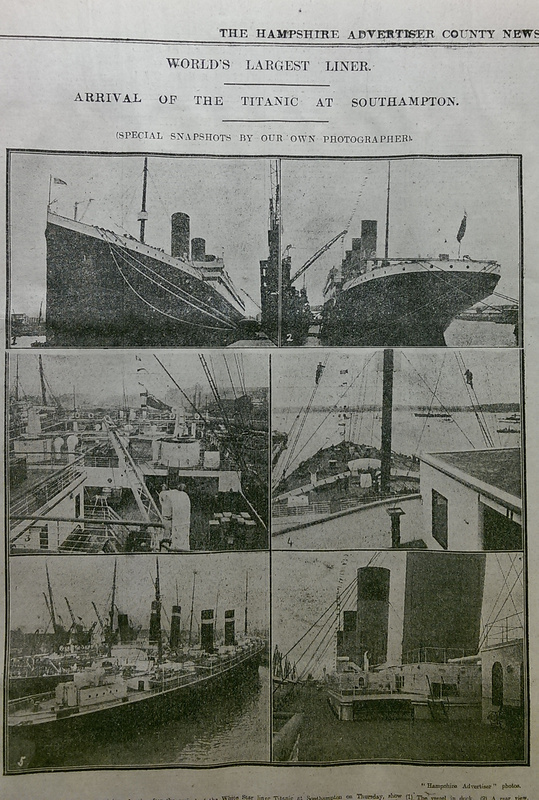 A selection of photos from newspaper coverage of the launch. 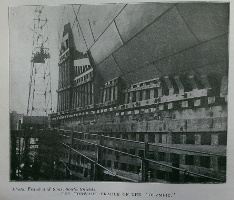 A similar view to the one above. 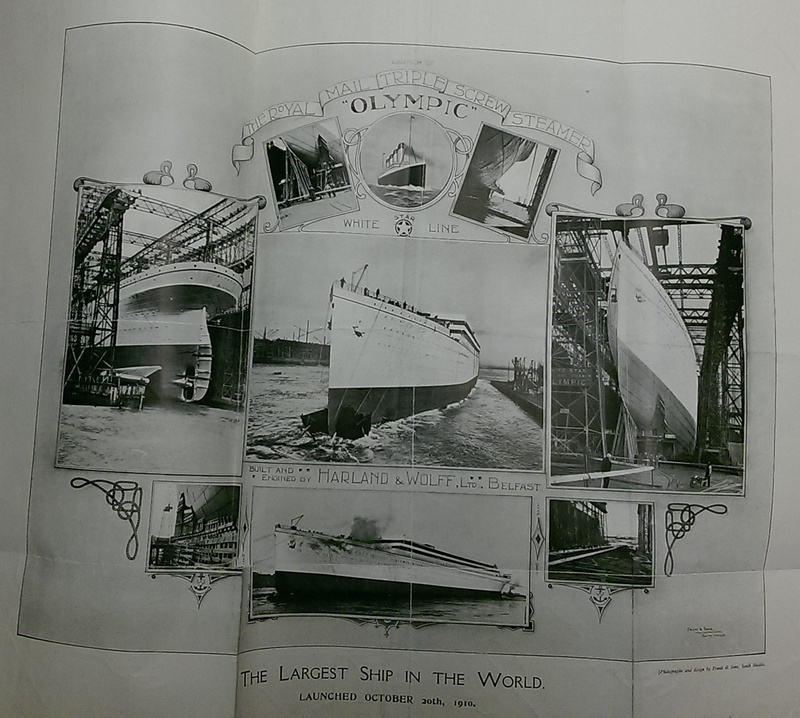 A montage of launch images from a gatefold in a journal. 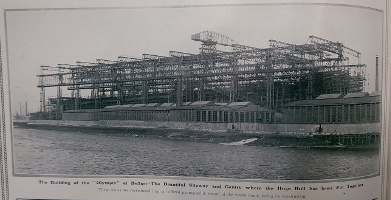 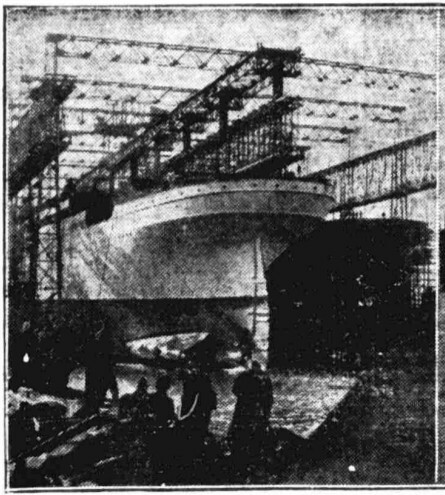 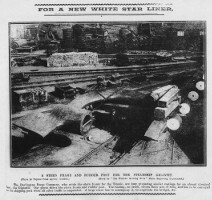 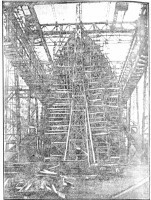 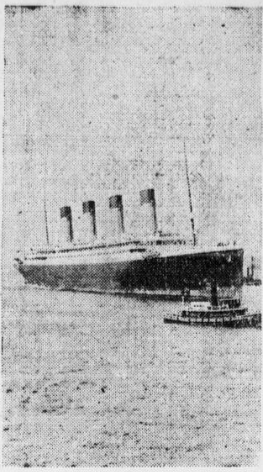 The Olympic soon after launch, from the Hereford Times of October 29th, 1910 (probably the same photo as the one below, but in better quality). 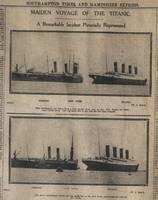 The Bismarck Daily Tribune of November 5th 1910; a higher quality version of the bottom left picture is to the right. 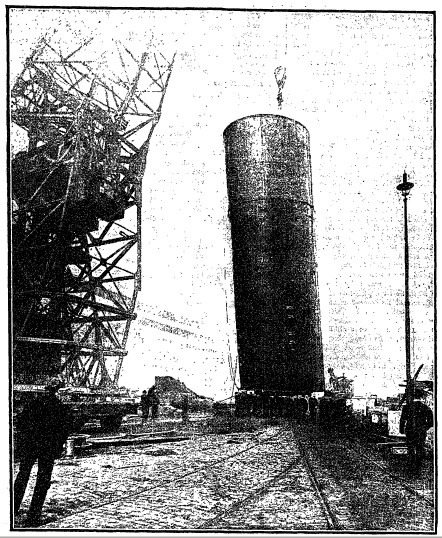 One of the Olympic's boilers is placed in position using the floating crane. The name of the ship has been crudely daubed on. 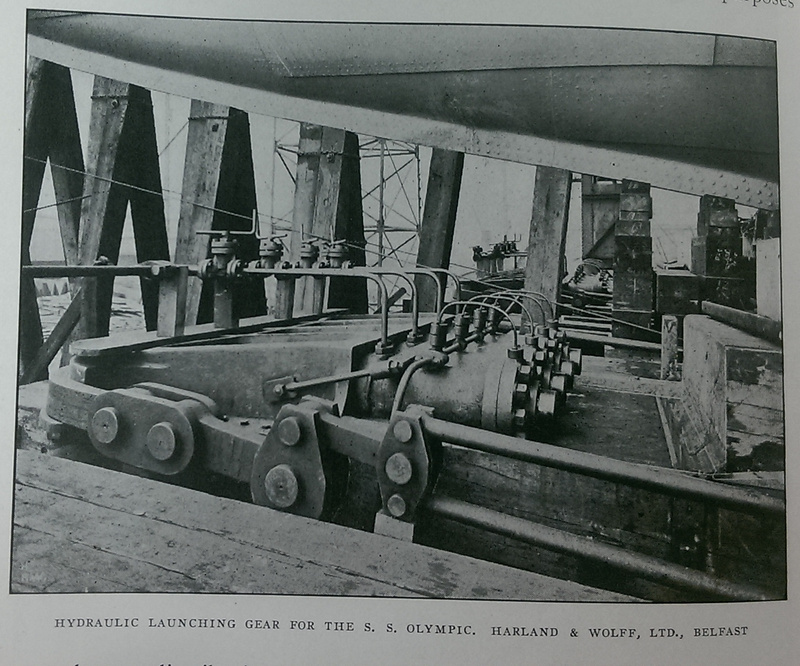 Two of the Olympic's funnels have been hoisted into position. 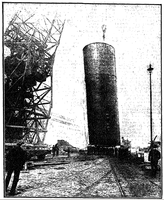 One of the Olympic's funnels being raised into position. 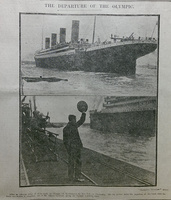 The Manchester Guardian of February 27th, 1911; a better quality version is to the right. The last of the Olympic's funnels is raised into position. 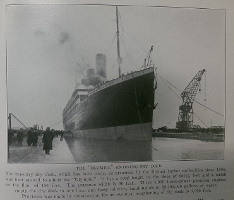 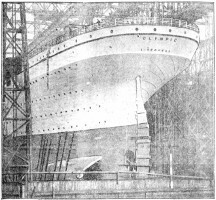 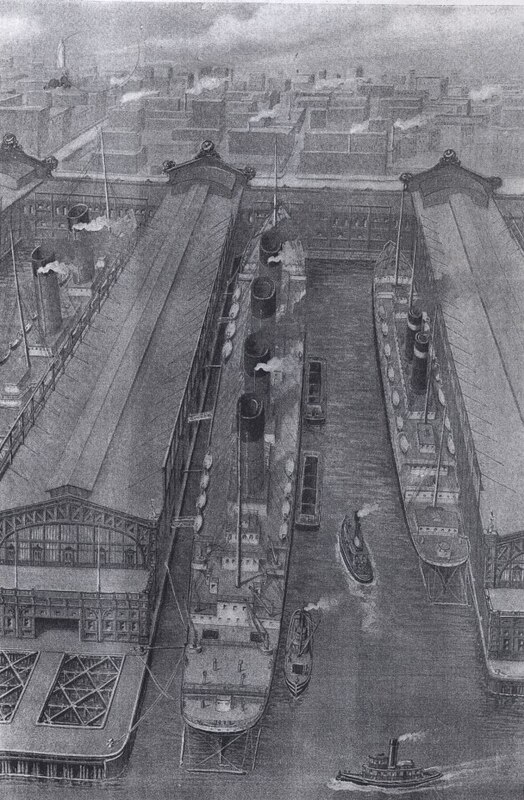 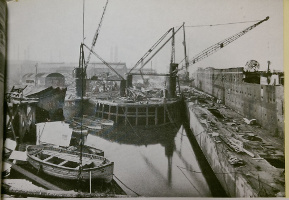 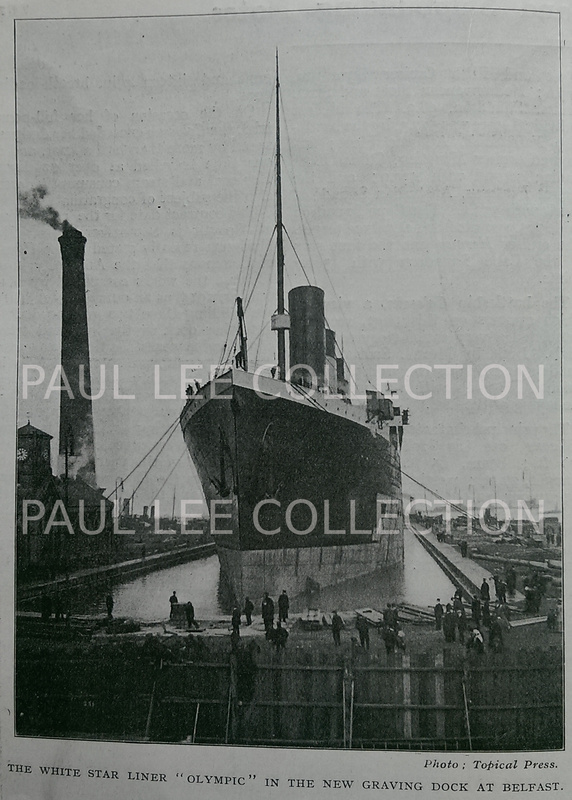 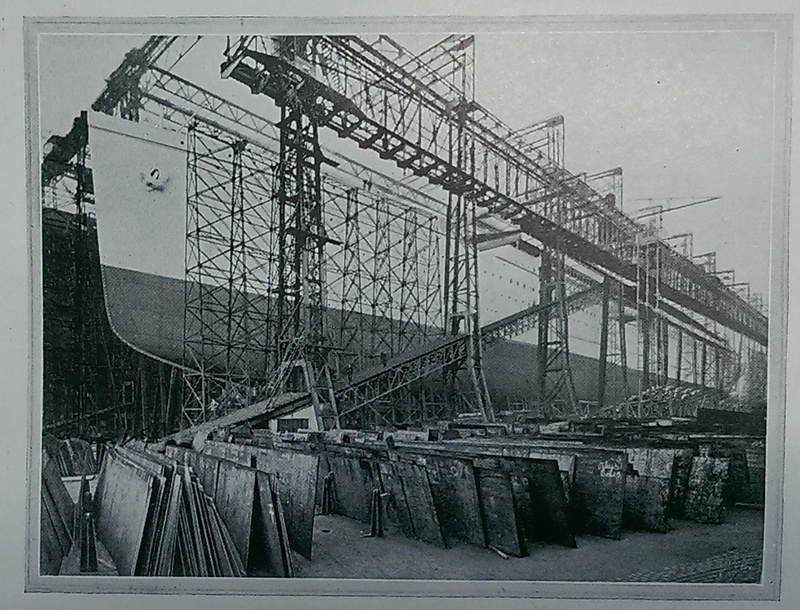 The Olympic becomes the first ship to enter the new Graving Dock on April 1st, 1911; note that the hull and funnels are only partially painted. 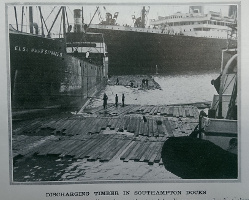 The photo to the right shows more of the wooden shoreing on the forecourt. 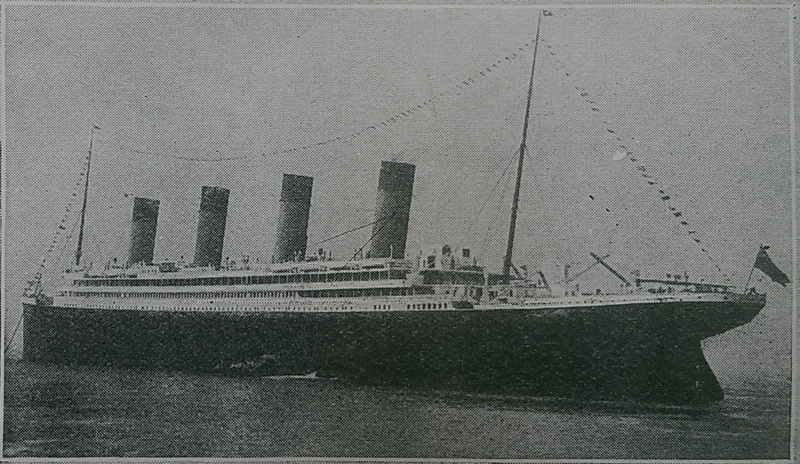 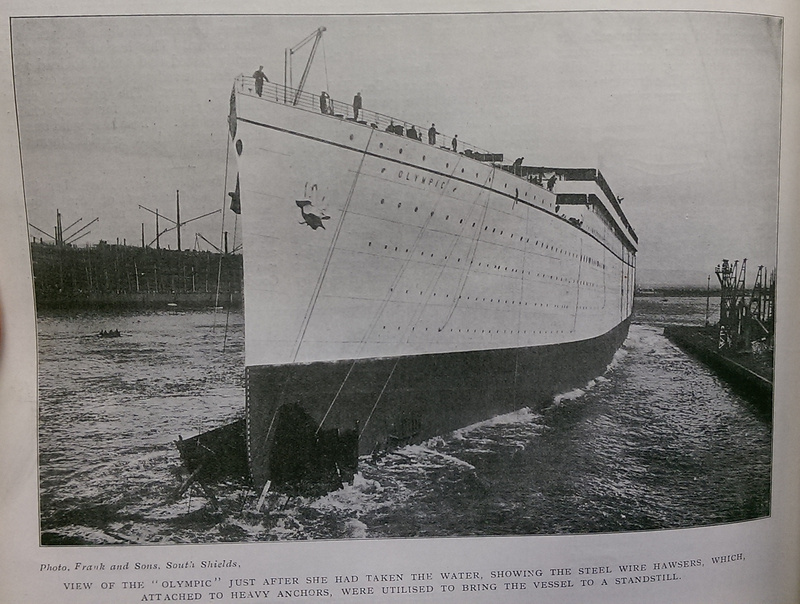 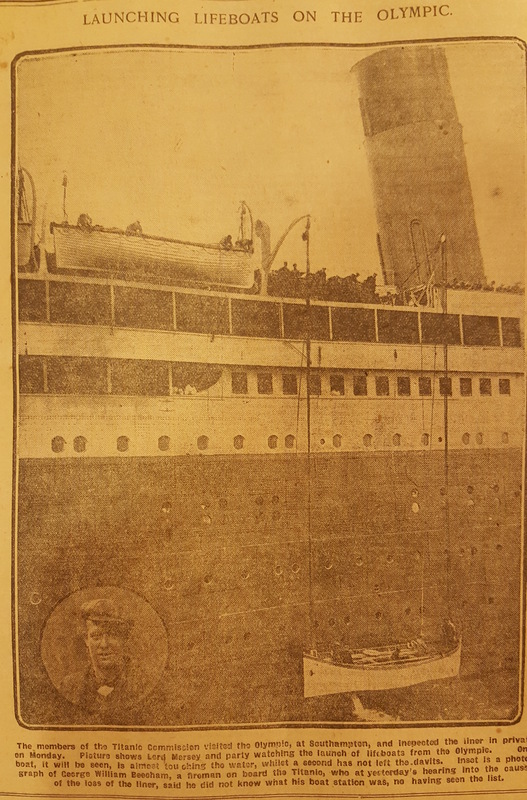 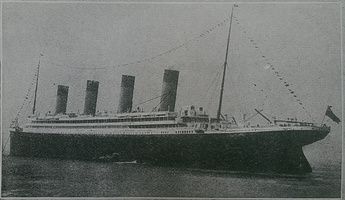 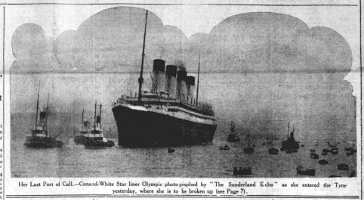 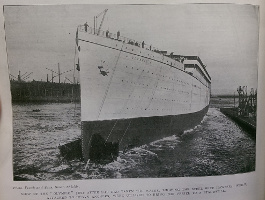 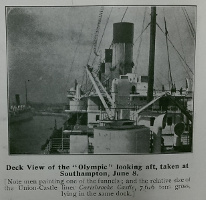 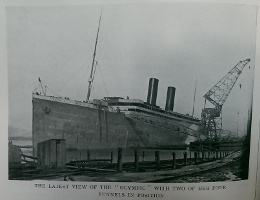 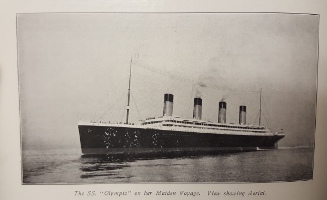 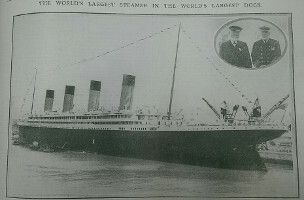 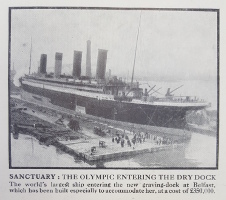 The Olympic shortly before her maiden voyage; the caption is incorrect as the view is looking forward. 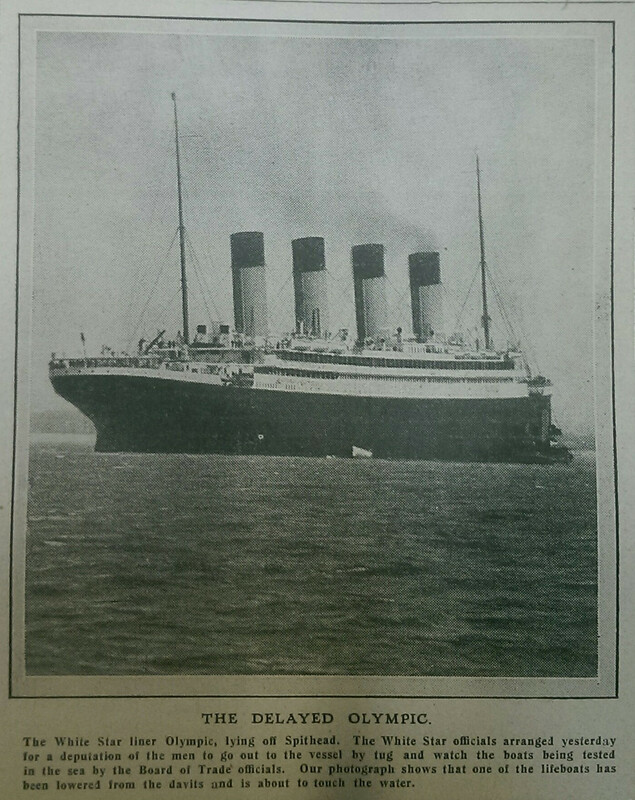 The Olympic just before her maiden voyage. 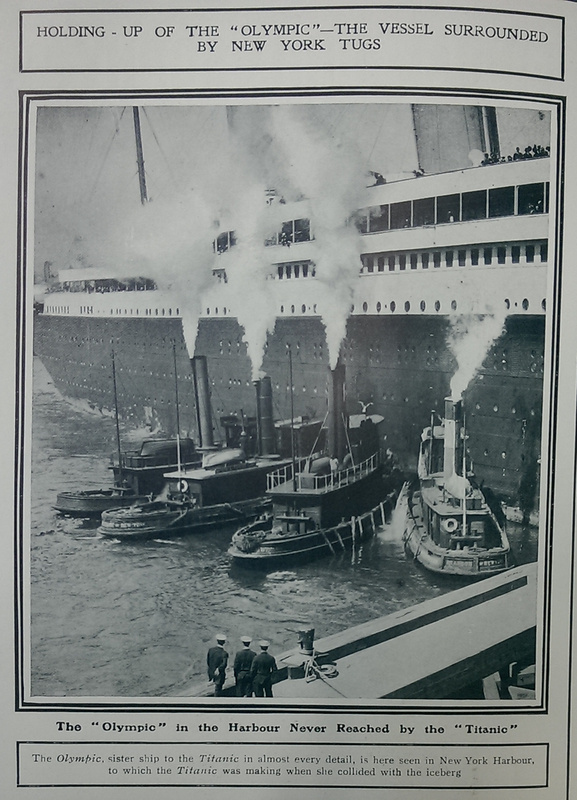 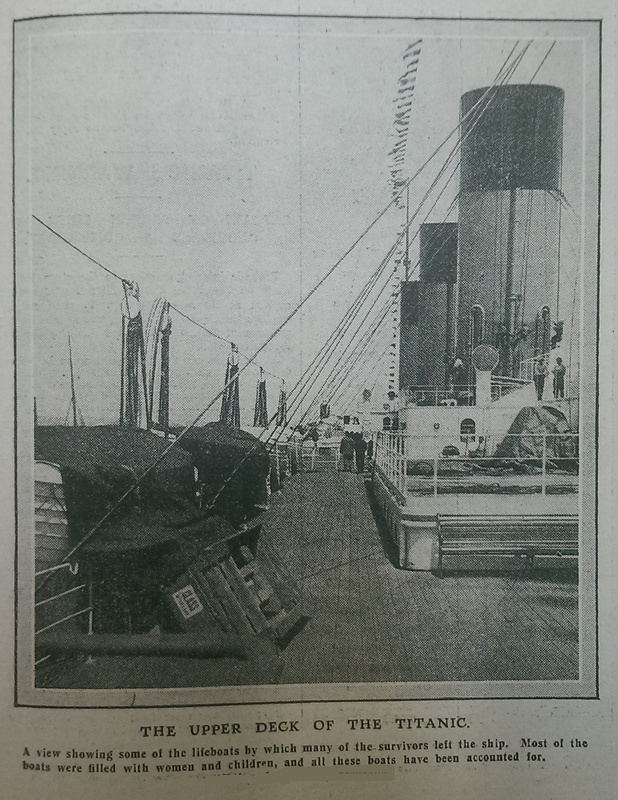 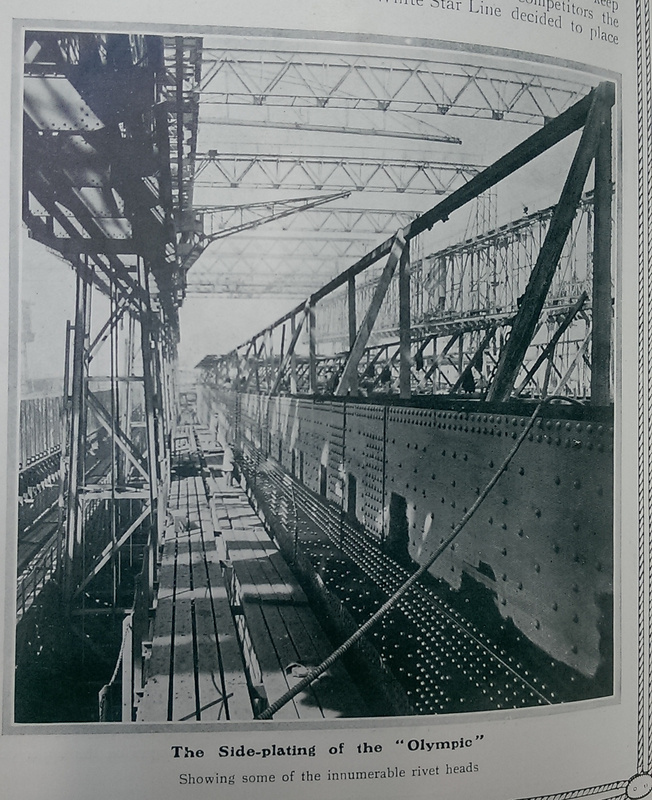 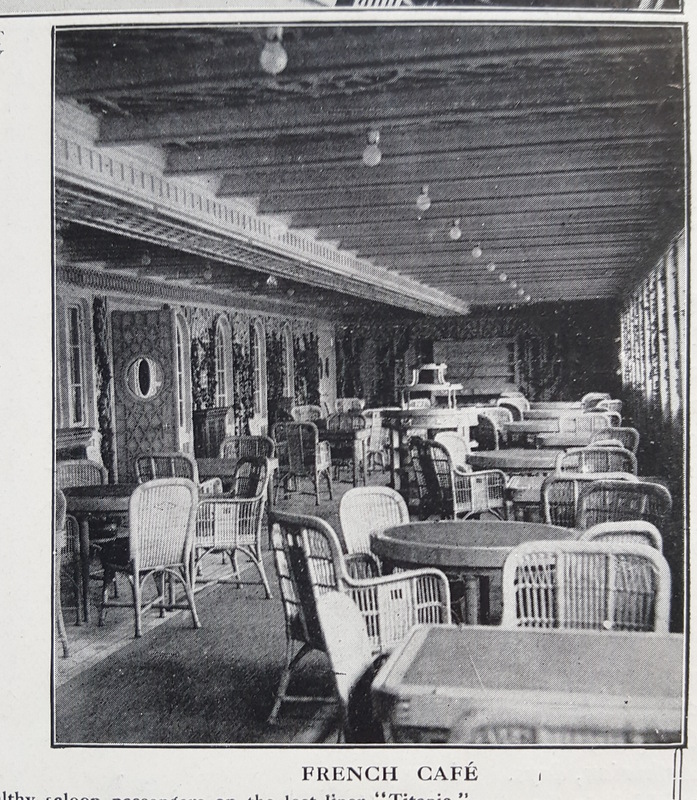 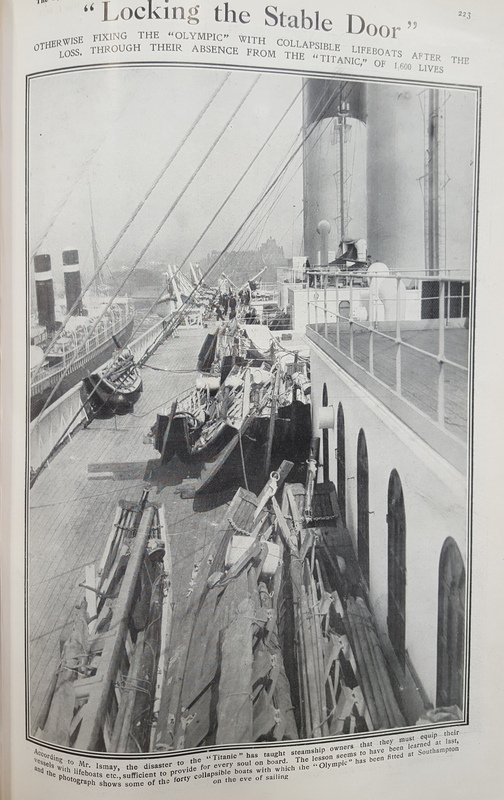 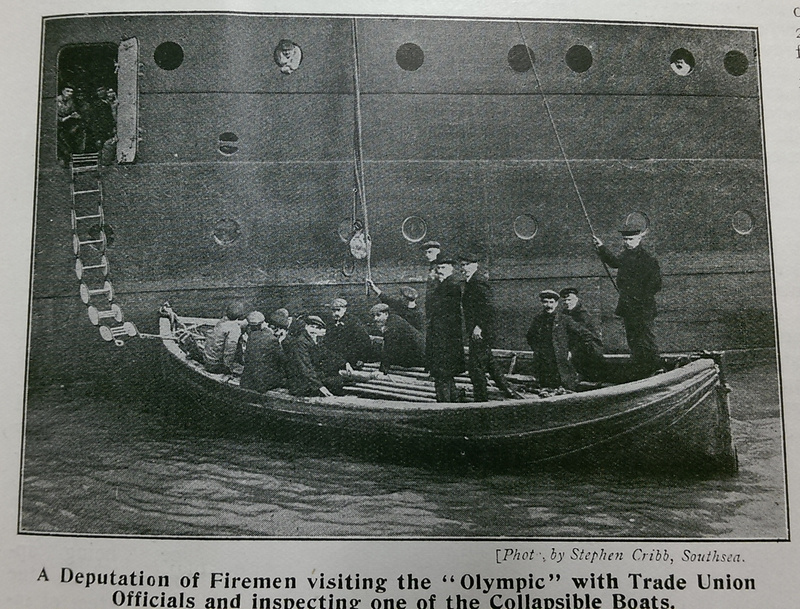 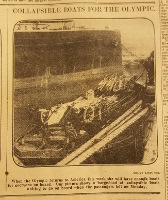 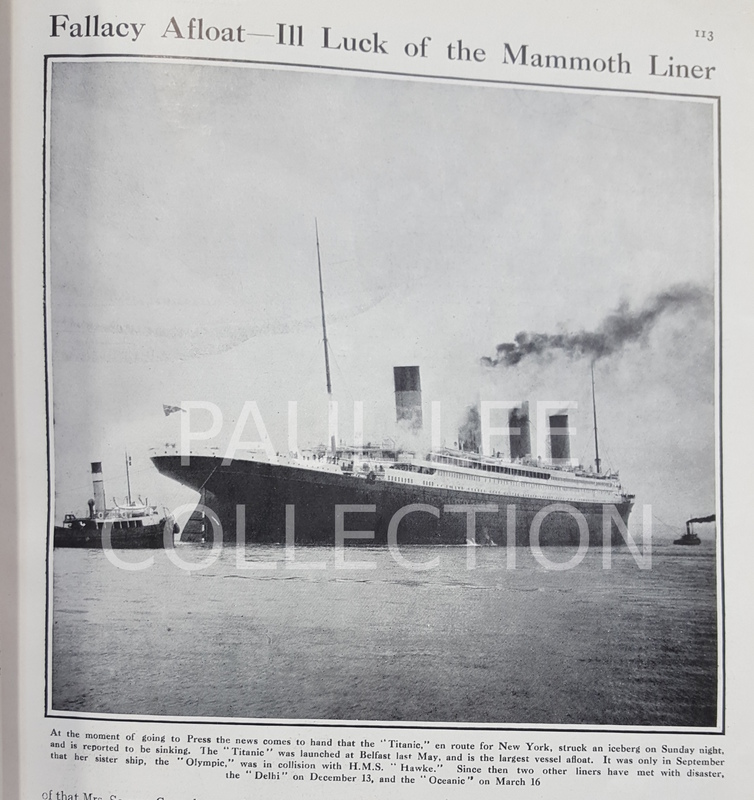 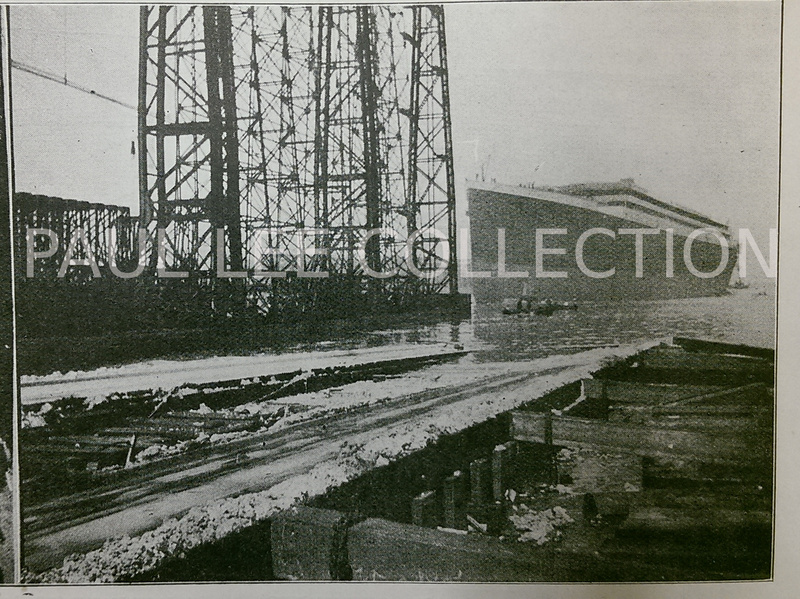 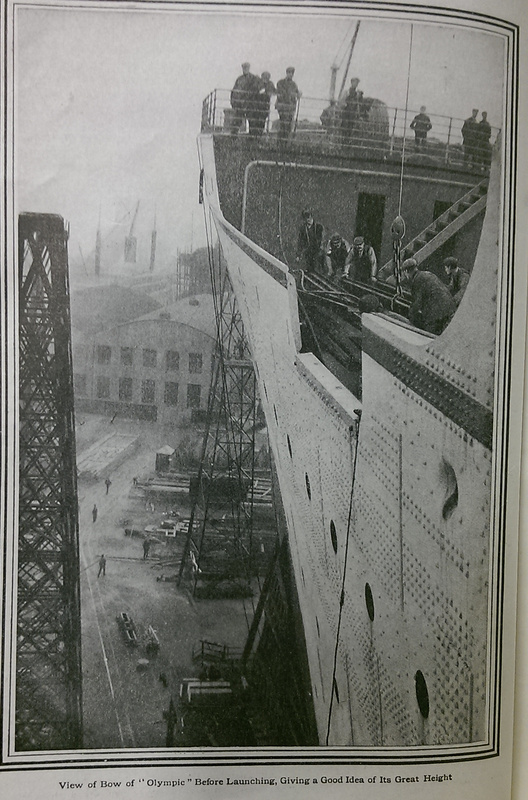 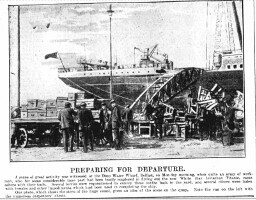 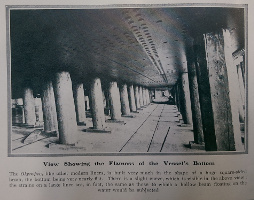 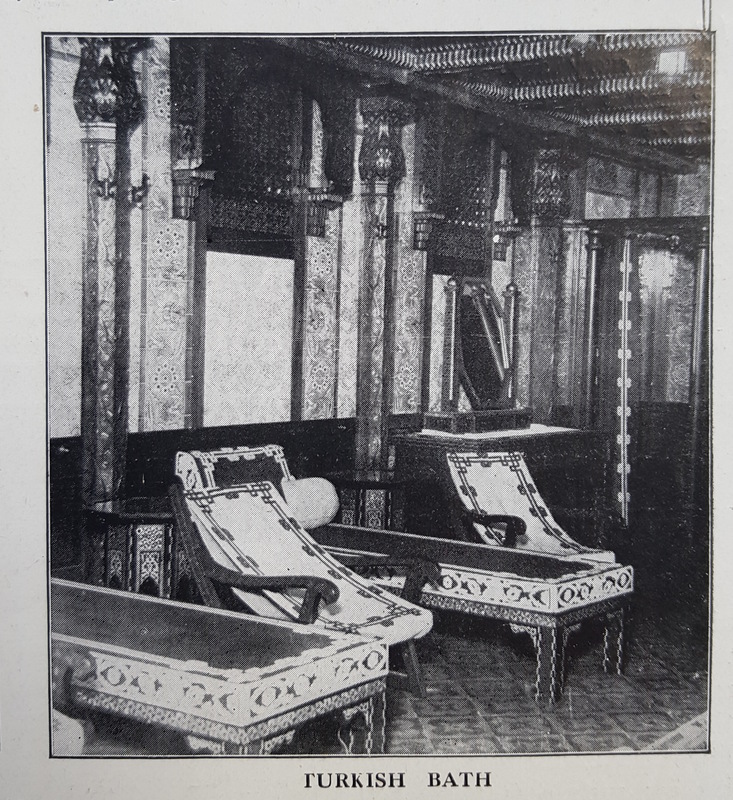 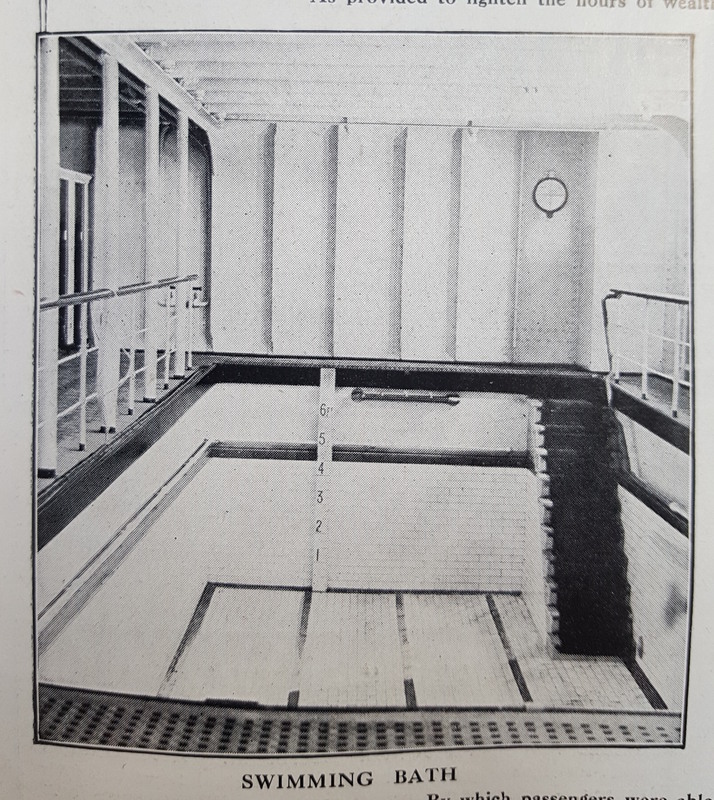 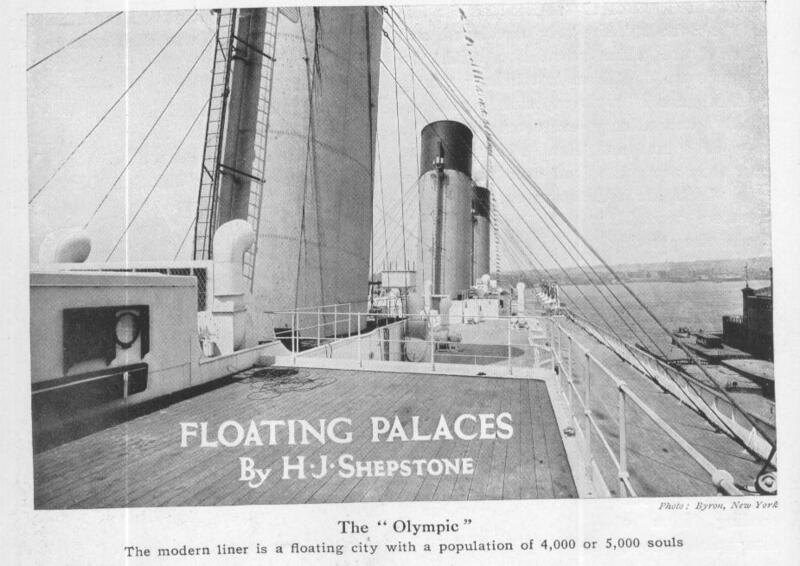 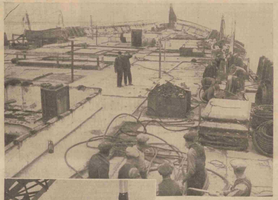 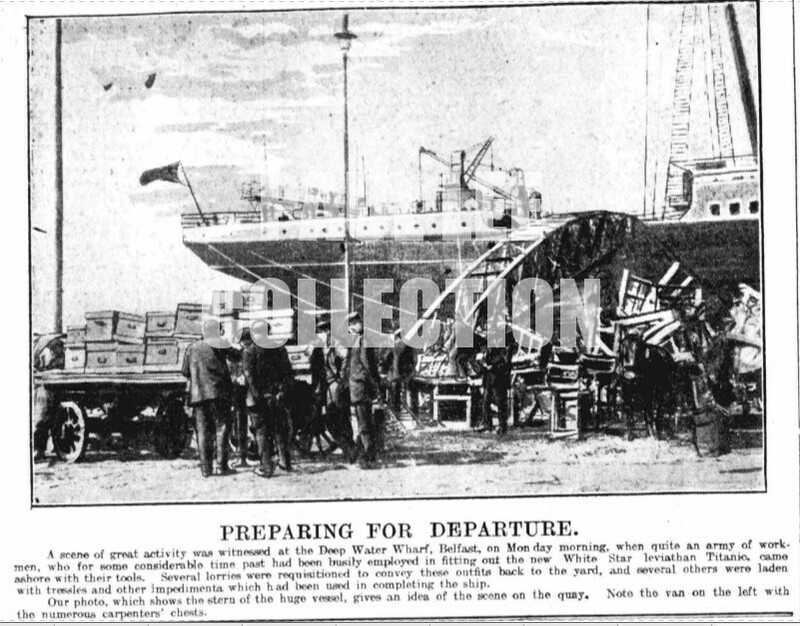 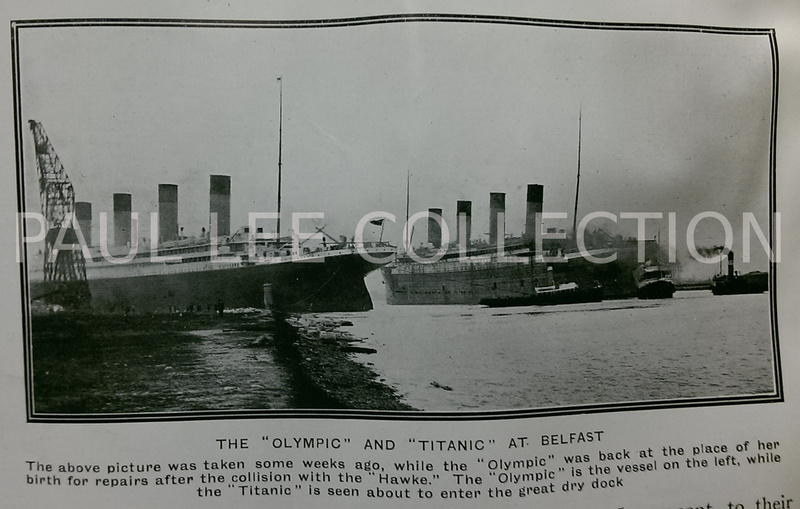 Despite what the caption says, this is actually the boat deck of the Olympic just prior to the maiden voyage. 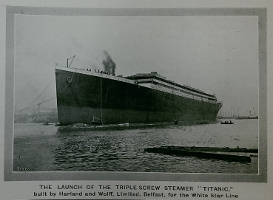 There are a few clues, such as the water pipes on the funnels not going as high as on the Titanic, and the white gunwales on the lifeboats (the Titanic's were brown). 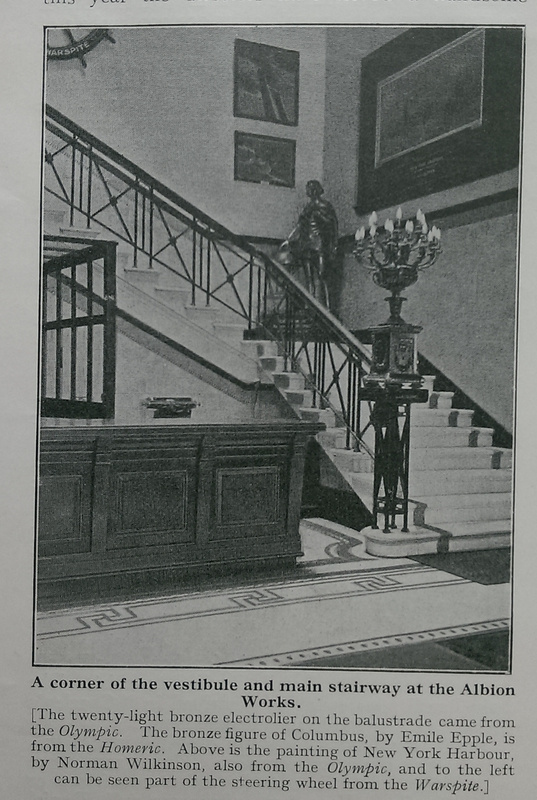 Inset is a photo of Captain Smith and Lord Pirrie. 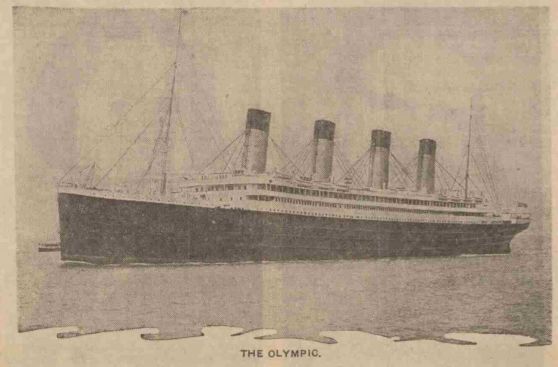 The Olympic leaves on its maiden voyage. 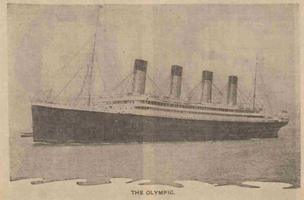 The Olympic on its maiden voyage. 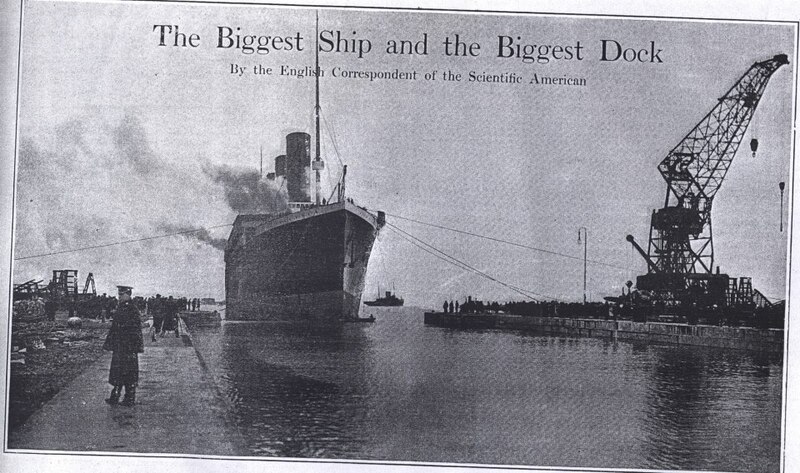 From the Scientific American of June 24th, 1911. 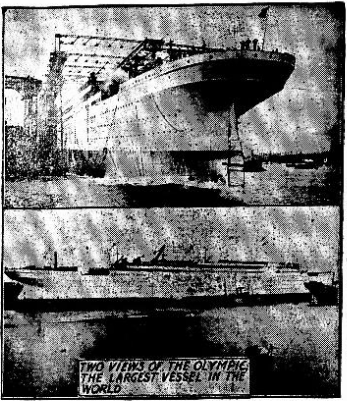 A sketch showing the Olympic docked in New York. 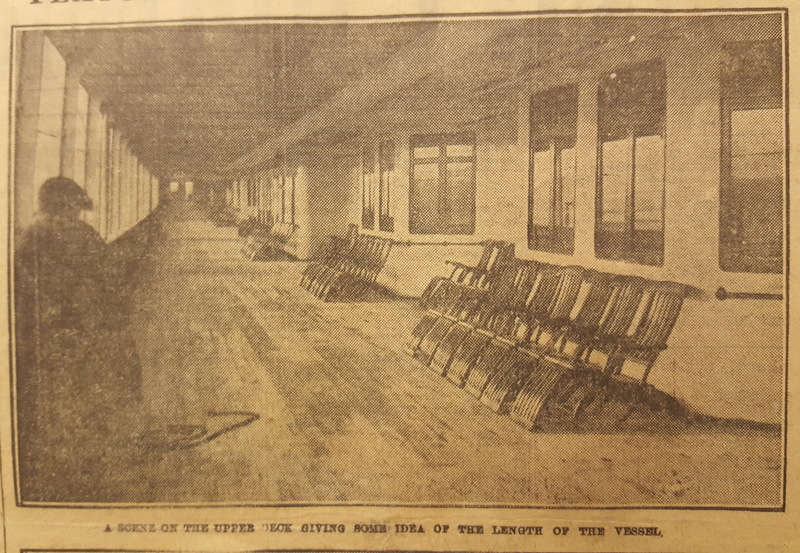 This same sketch was on page 5 of "The New York Tribune" (25/6/11), where it discusses that the Secretary of the War Department gave permission for the lengthening of the pier by 100 feet under certain provisions, and only for 18 months. 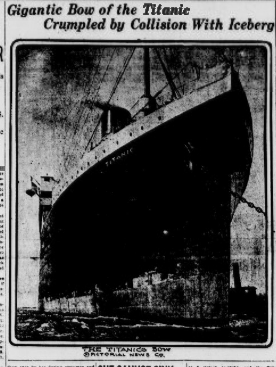 This newspaper mentions that the ship in the same basin is the "Finland," 580 feet in length, whilst in an adjoining berth is the 704 foot long "Oceanic." 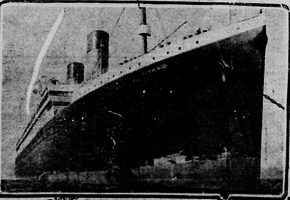 From the Rock Island Argus of June 27th, 1911. 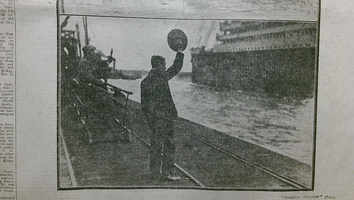 A rare picture of Captain Smith looking out from the starboard bridge wing. From the Honesdale Citizen of September 22nd, 1911. 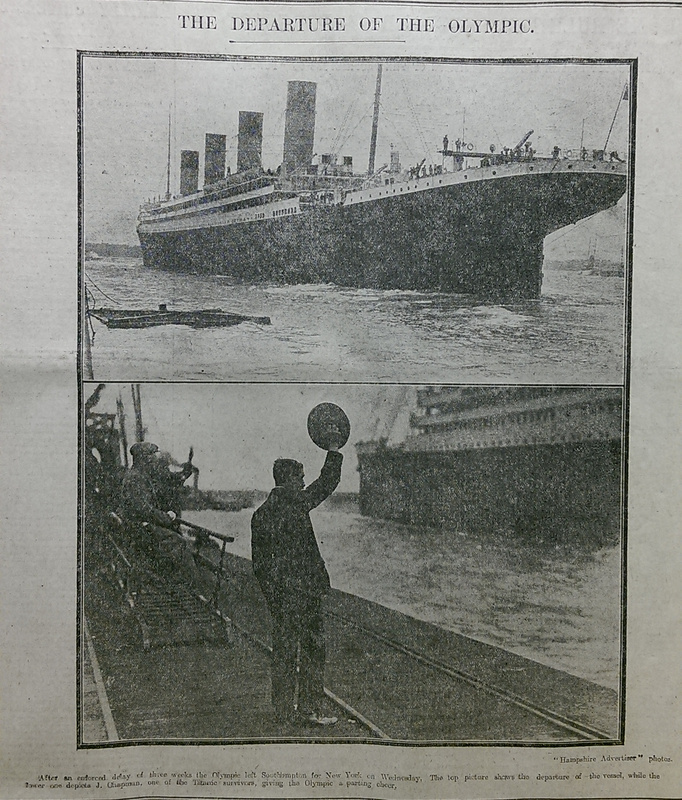 From the Evening Telegraph and Post of September 22nd, 1911. 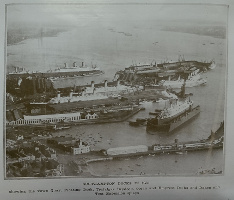 Although this seems to be the same as the photograph above, it was taken at a slightly different time and vantage point. 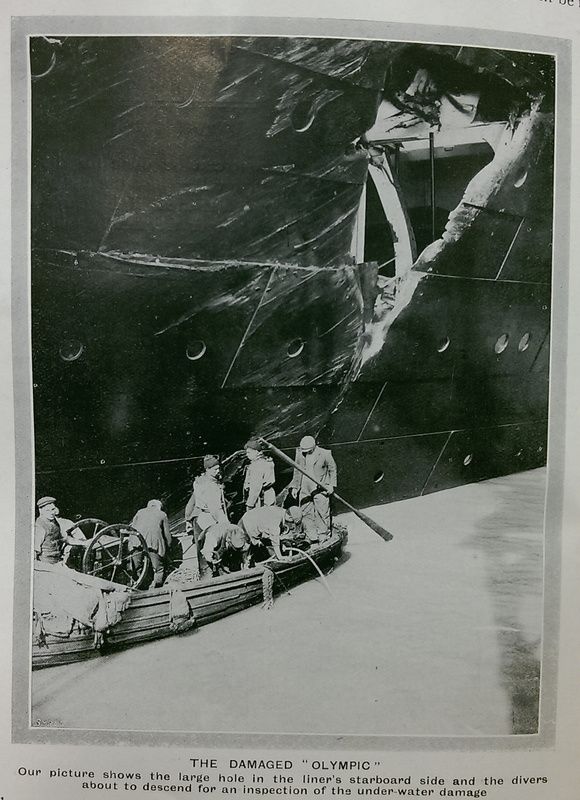 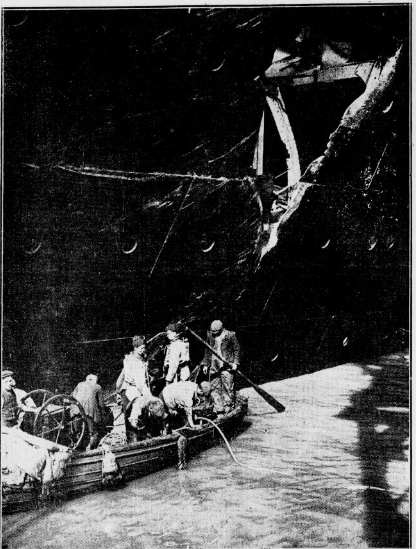 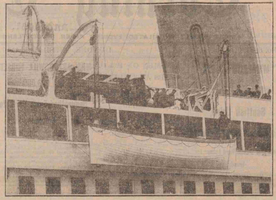 The New York Tribune of September 29th, 1911, showing the full extent of the damage caused by the HMS Hawke. 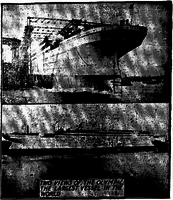 A better quality version is to the upper right. 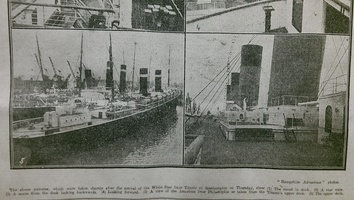 Another, slightly different view is to the far right. 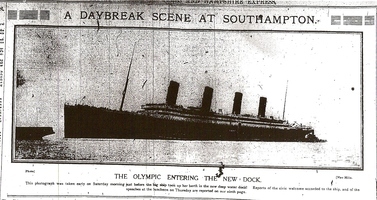 The Olympic is berthed following the Hawke incident. 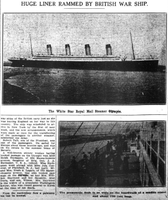 The New York Evening World of April 15th, 1912. The Olympic has her sister's name crudely stenciled on her bows. 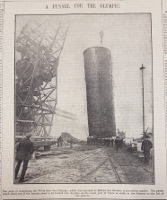 The Day Book of Illinois, April 16th, 1912. Again, soon after the Titanic disaster, the Olympic stands in for her sister, illustrating the bridge area. 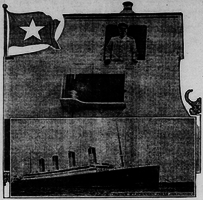 The Bisbee Daily Review of April 21st, 1912. 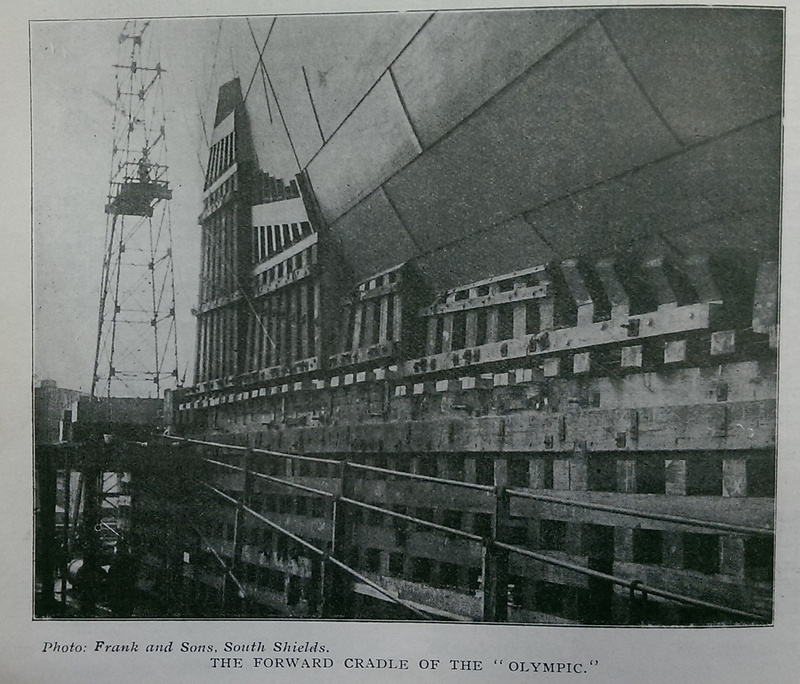 The Olympic once again has her bow defaced. 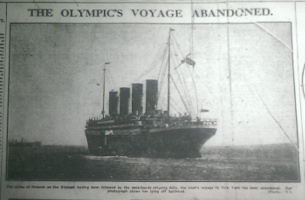 The Olympic arrives back in Plymouth, her flag at half mast and a fund started by the passengers having raised £1400. 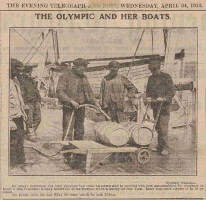 Filling some of the Olympic's lifeboat's water barrels (breakers) - from the Dundee Evening Telegraph of April 24th, 1912. 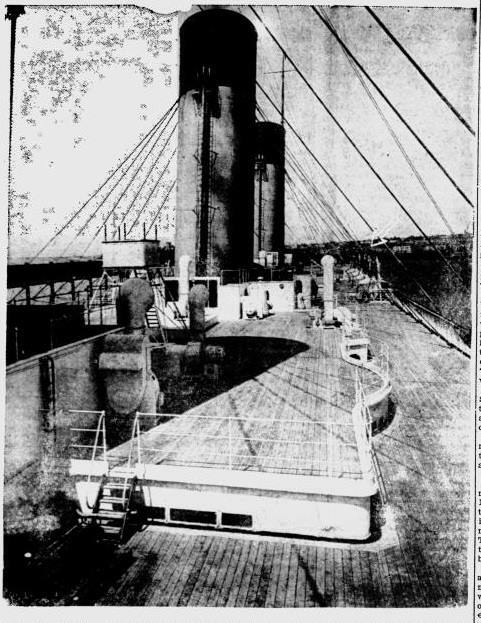 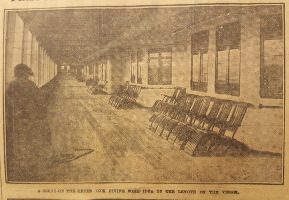 The Olympic's portside boat deck from the Evening Independent of April 25th, 1912. 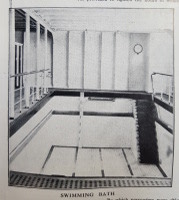 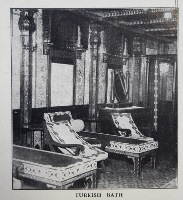 The Odell photos of the same area on the Titanic show that she had a ventilator in this area (in front of the raised roof over the 1st class reading and writing room). 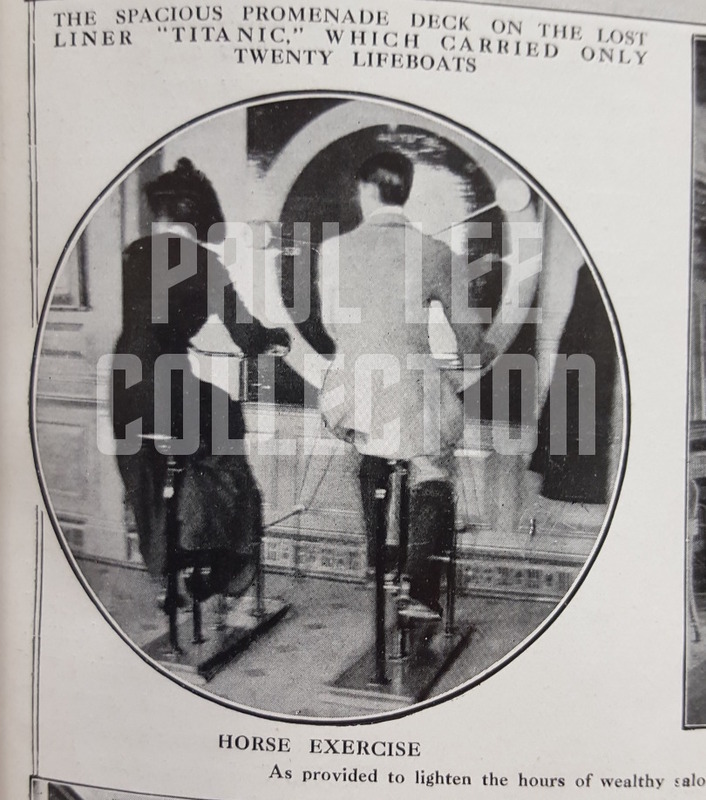 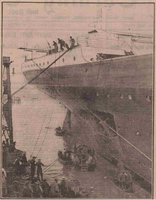 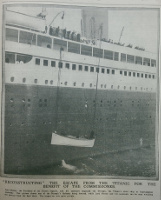 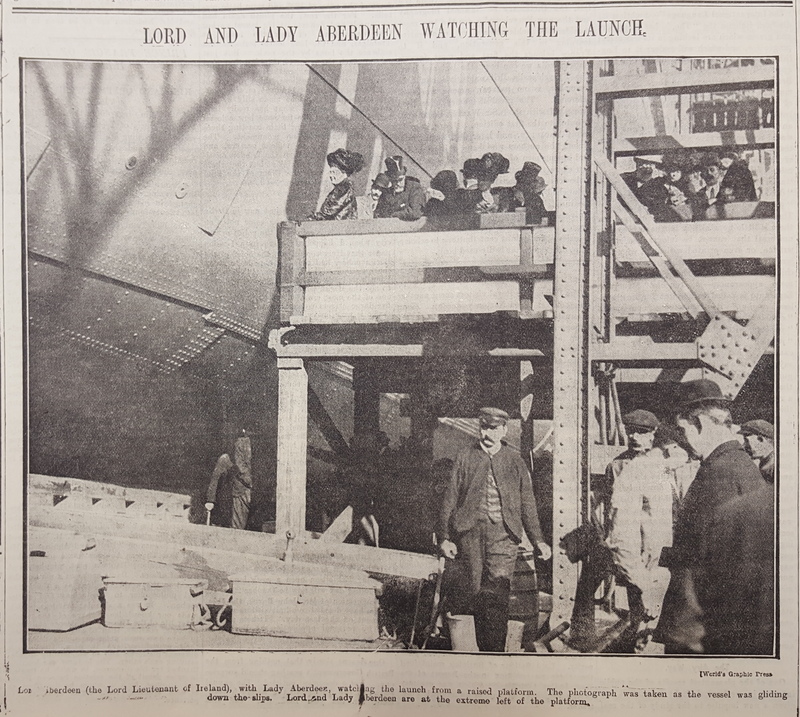 In a view similar to the famous picture taken of the Titanic's lifeboat 8 at Cherbourg and showing the Countess of Rothes, one of the Olympic's lifeboats is tested and lowered to the water. 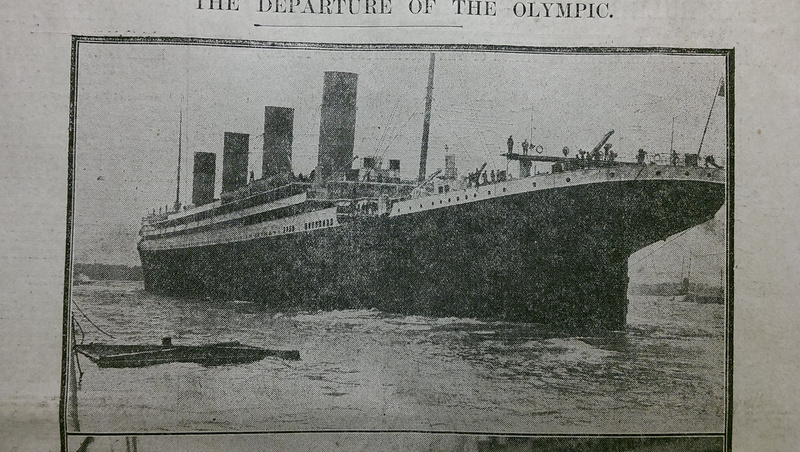 The Olympic's voyage is cancelled after the mutiny; from the Daily News of April 27th, 1912. The Olympic returns to her berth after her voyage is cancelled following the strike. 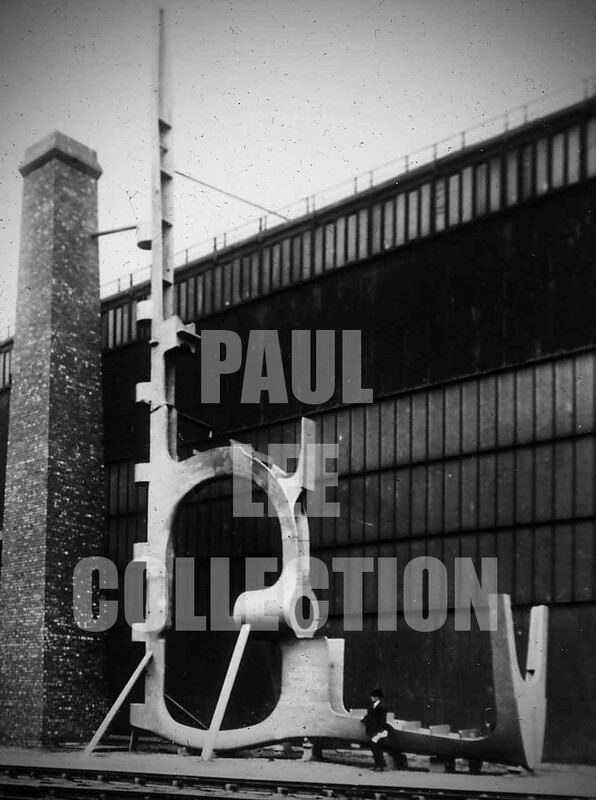 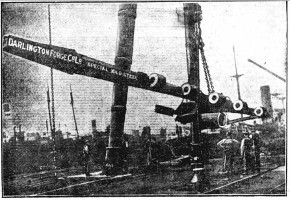 the testing of the Olympic's collapsibles, which failed to satisfy the crew. 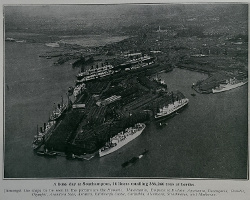 Picture (5) had also been published in "The Daily Sketch" and was taken by Stephen Cribb of Southsea (see below). 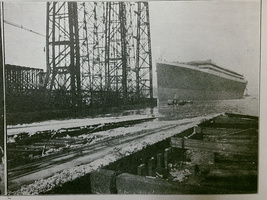 A close up of the Olympic's hull during the lowering is at right. 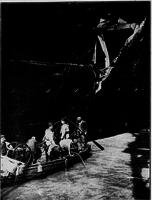 A slightly later view of the scene above. 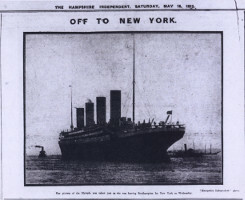 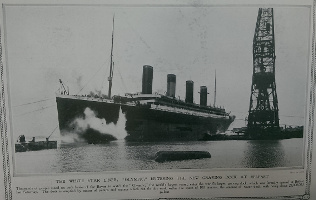 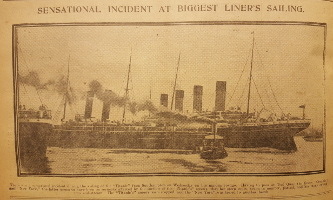 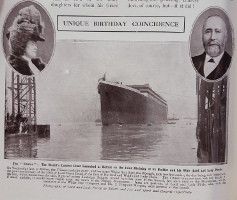 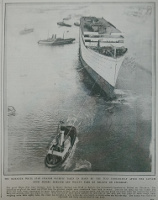 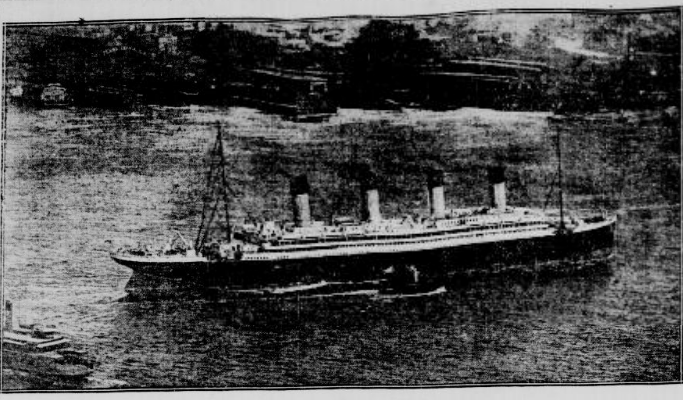 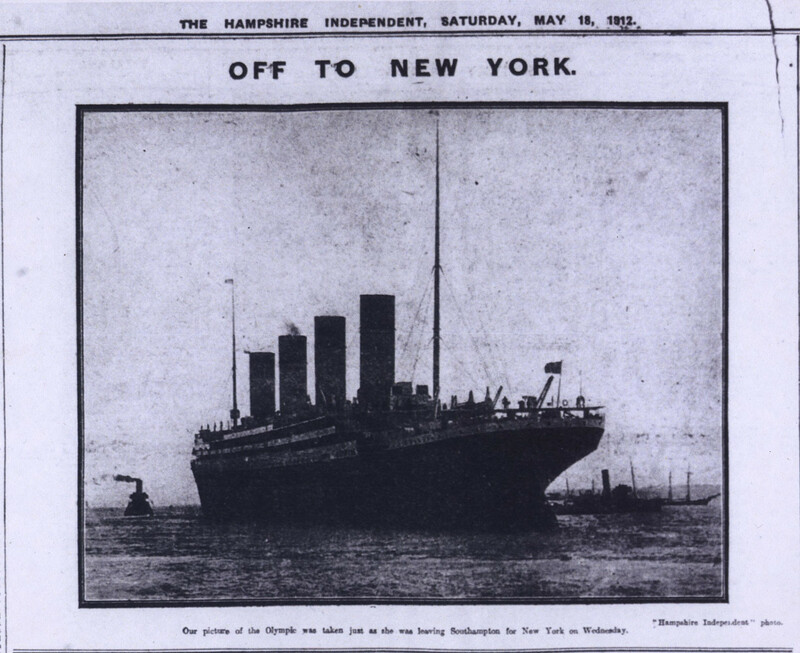 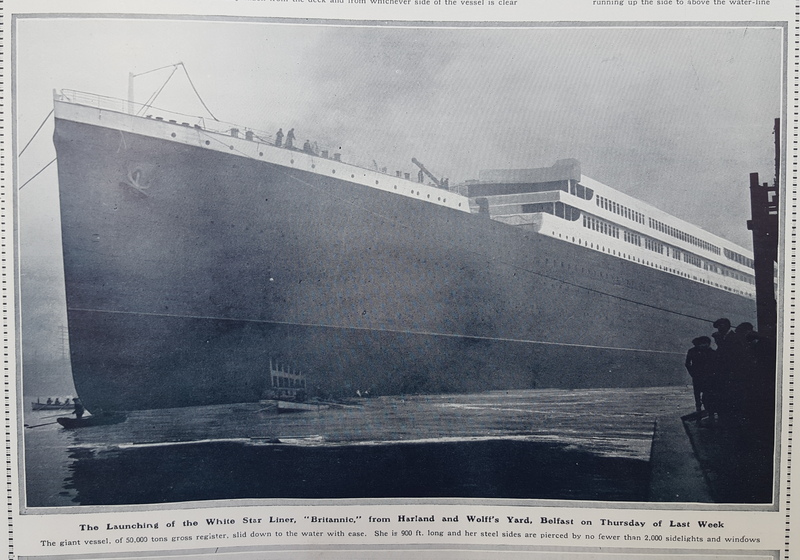 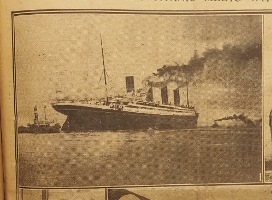 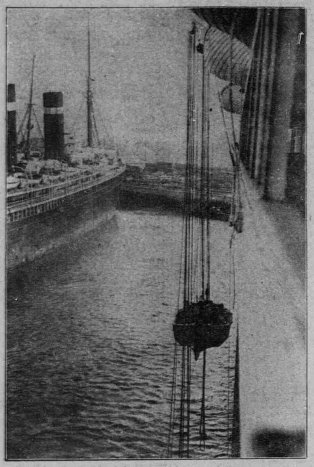 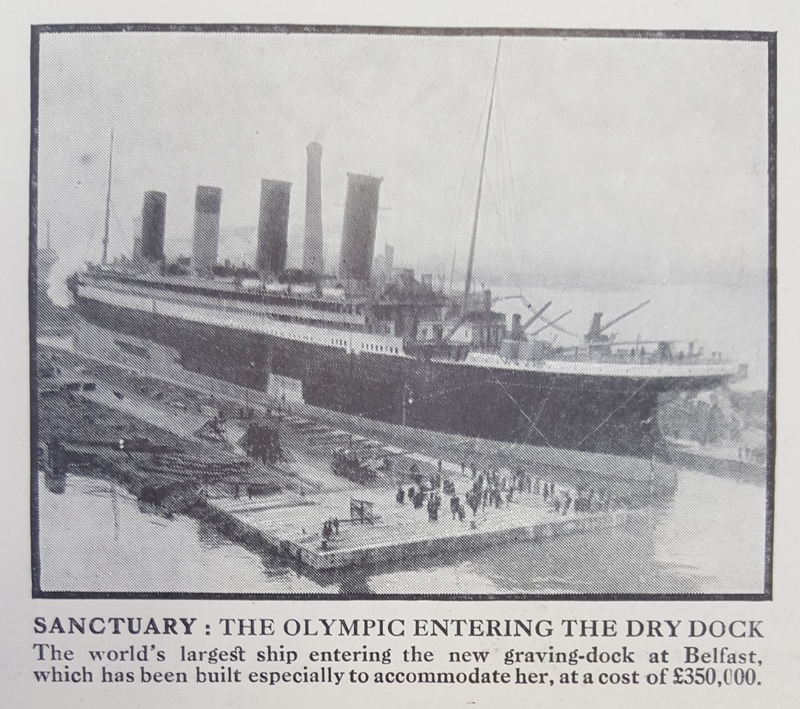 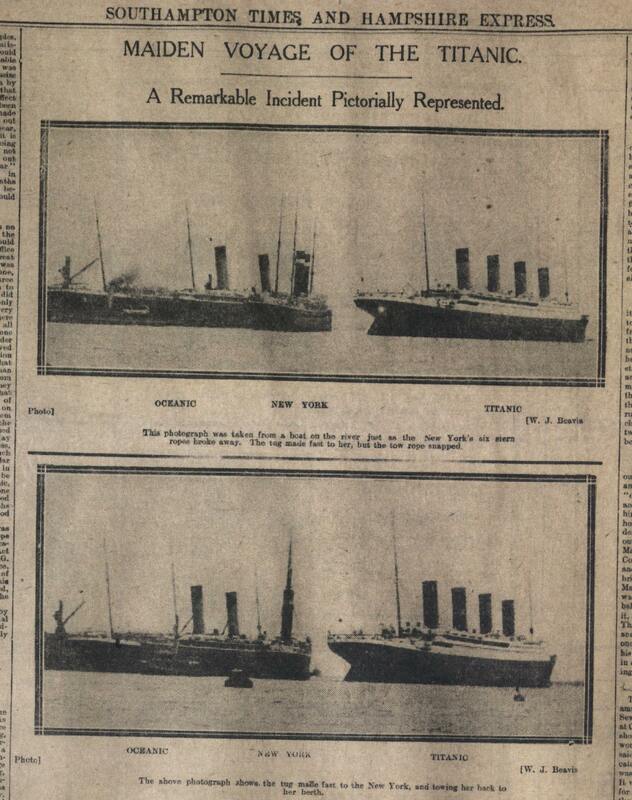 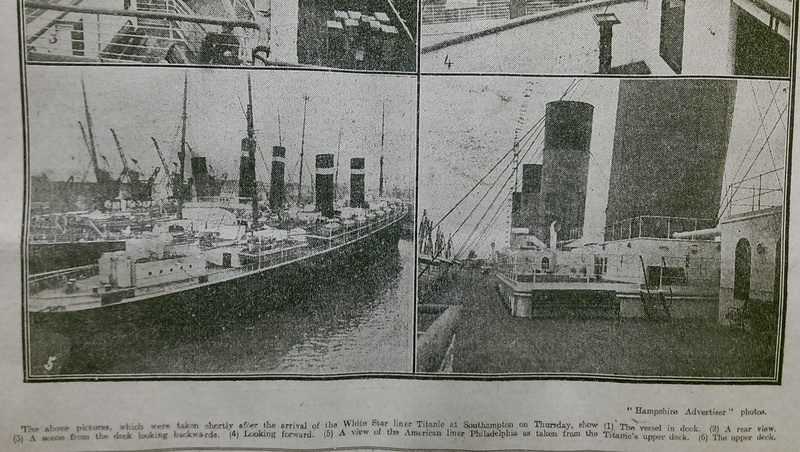 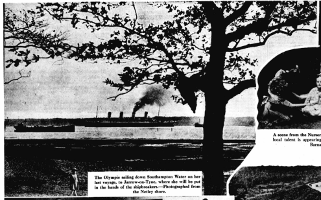 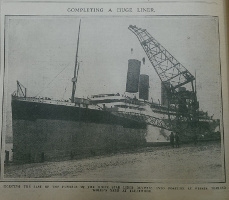 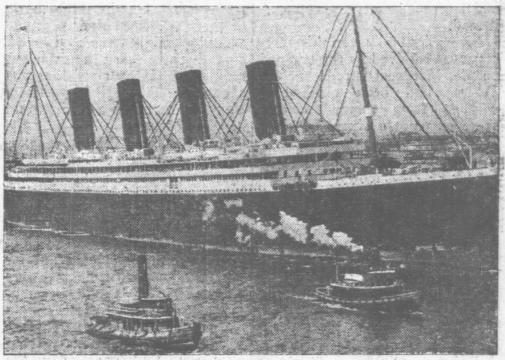 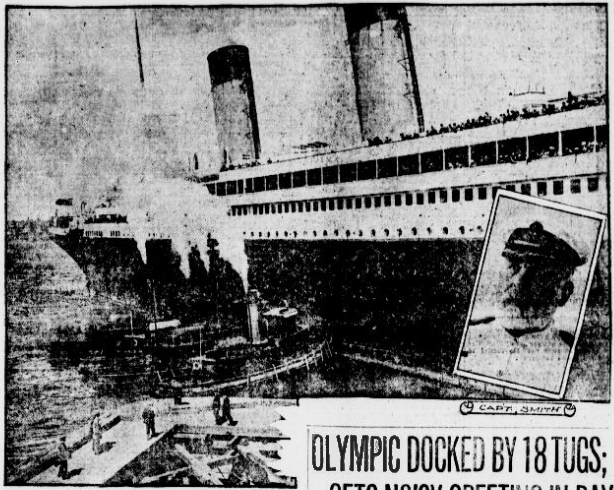 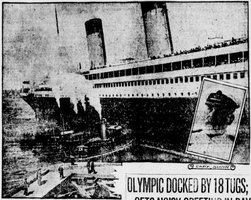 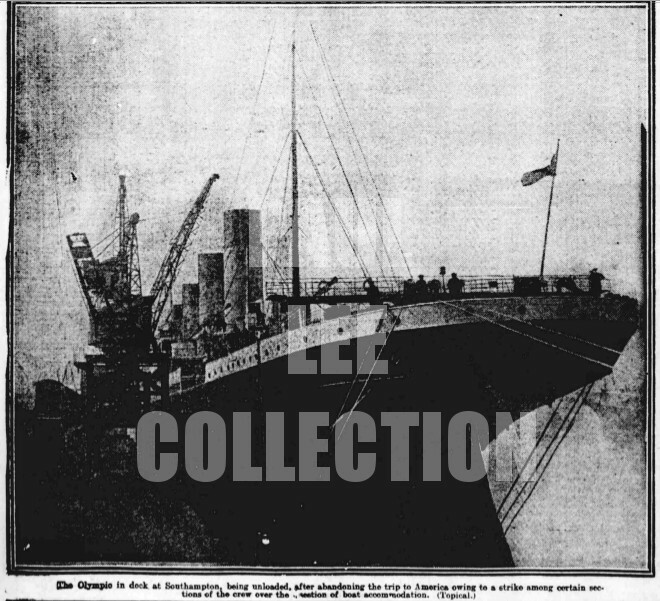 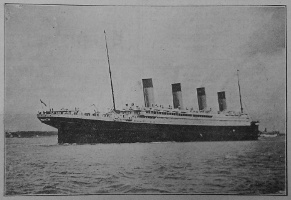 The Olympic proceeds on its first voyage to New York following the Titanic disaster and the mutiny; from the Hampshire Independent of May 18th, 1912. 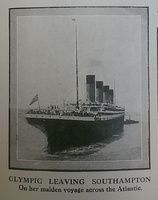 The Hampshire Advertiser County Newspaper of May 18th, 1912. 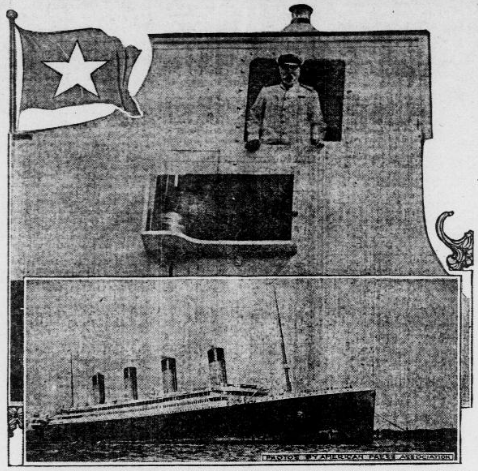 Titanic Survivor Joseph Charles Chapman (2nd class boots steward) waves off the Olympic at the start of her first complete post-disaster voyage. 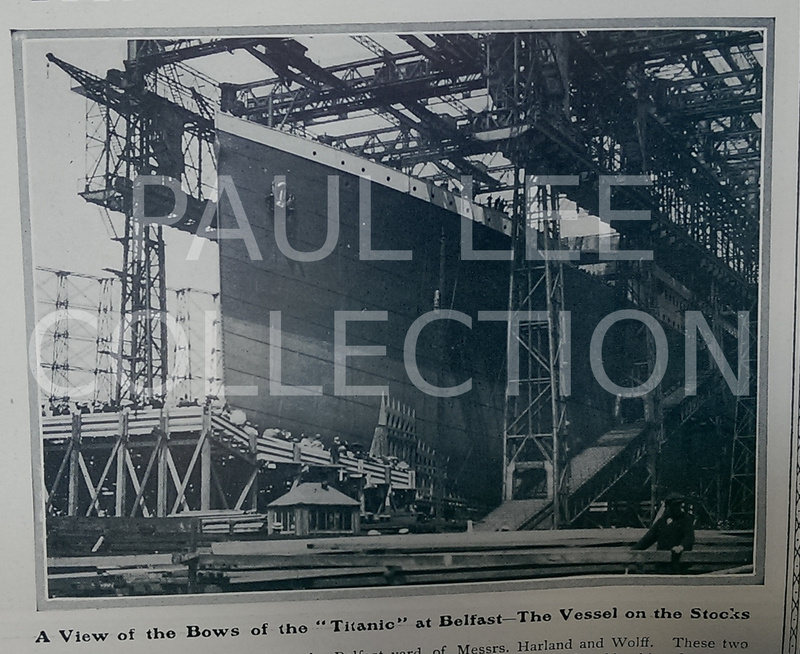 To ensure the best quality, I have taken close-ups of each photo, so necessarily there is some overlap. 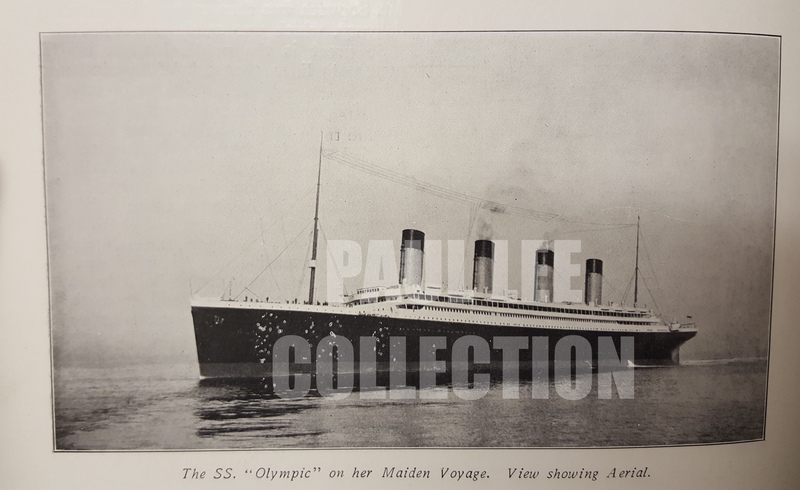 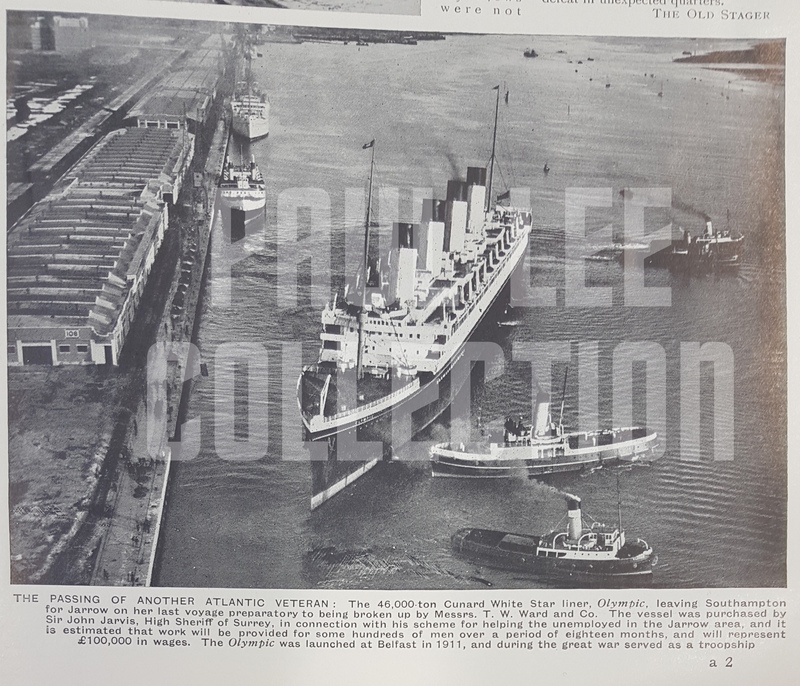 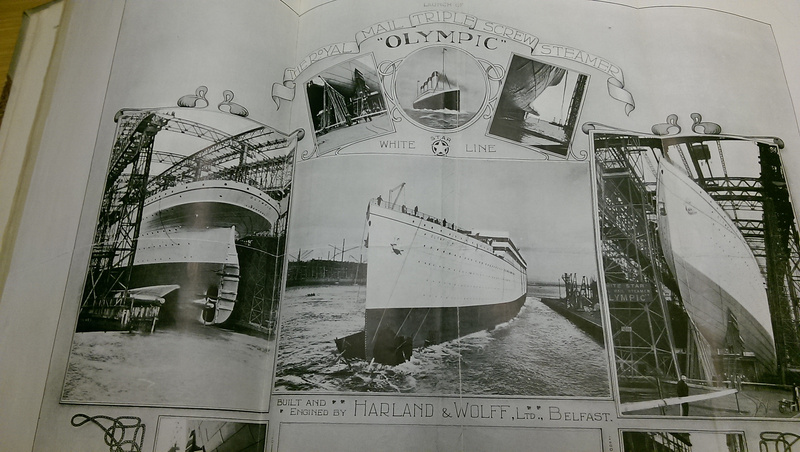 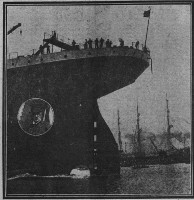 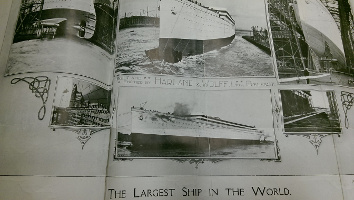 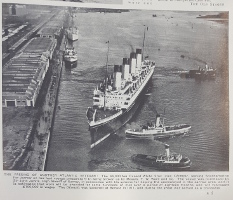 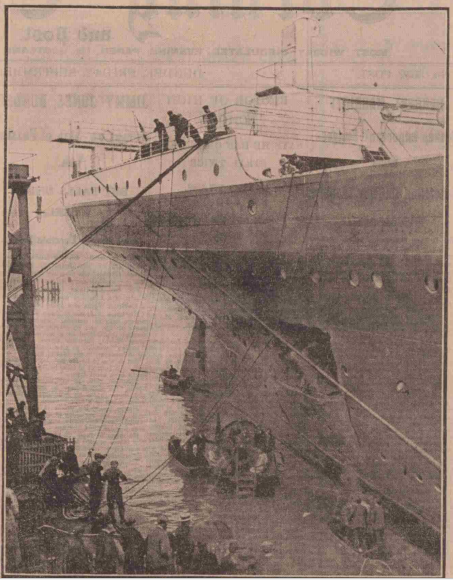 The press heralds new ocean liners Imperator and Vaterland on the scene, and welcomes back the Olympic which has just entered service after a 6 month refit and rebuild at Harland and Wolff. 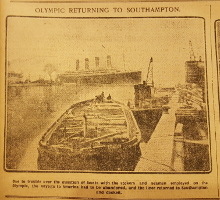 The Syren And Shipping of January 30th, 1929, showing the Olympic, Majestic and Homeric at the Ocean Dock in Southampton. 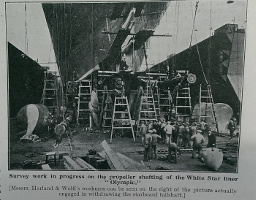 Work on the Olympic's stern, including the removal of the starboard propeller tail shaft. 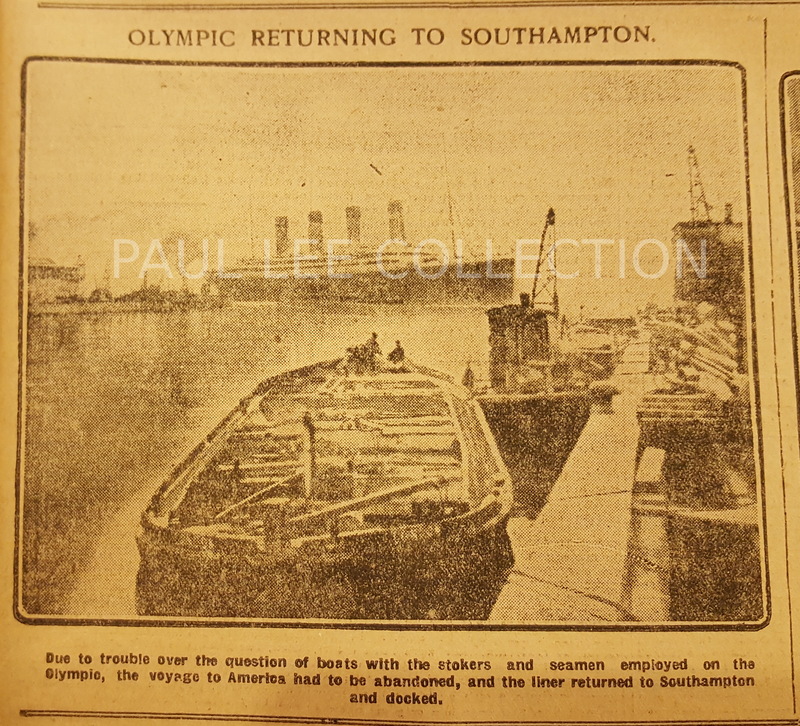 The Syren And Shipping of January 7th, 1931, showing the Olympic at the Ocean Dock in Southampton. 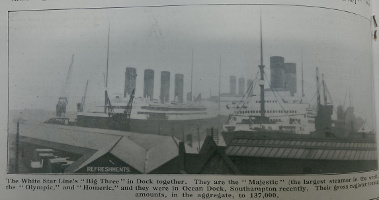 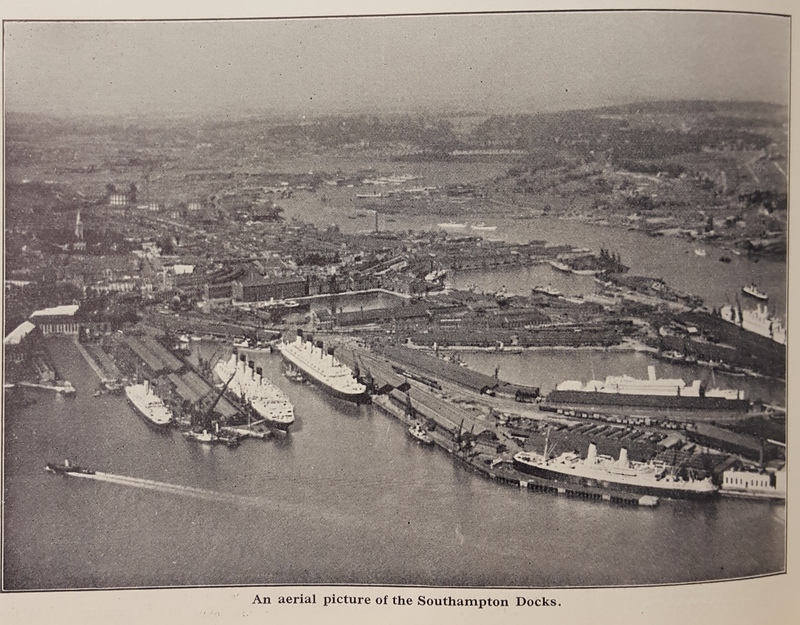 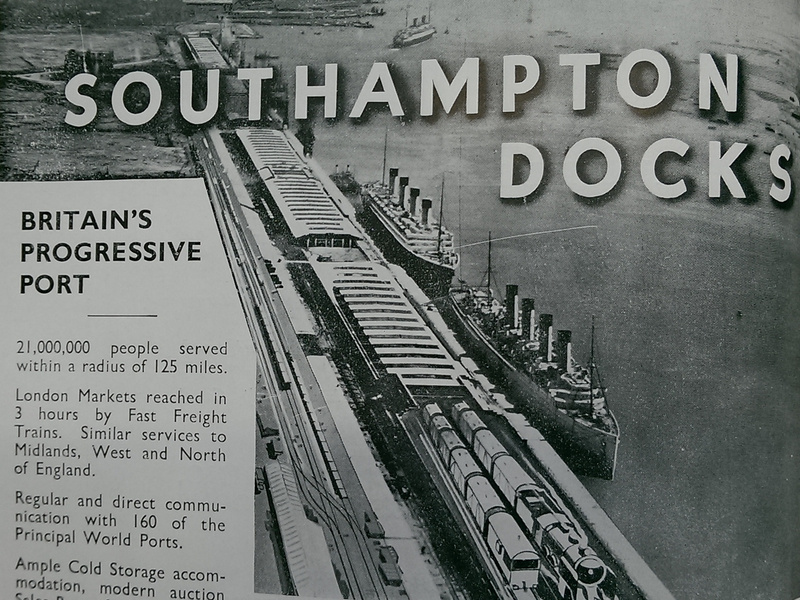 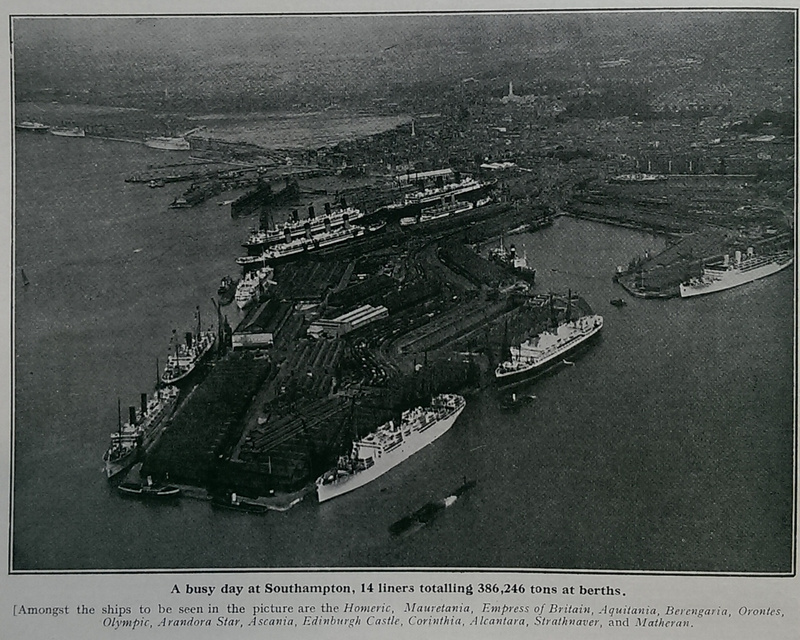 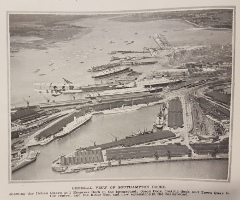 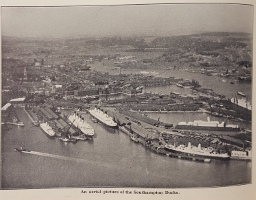 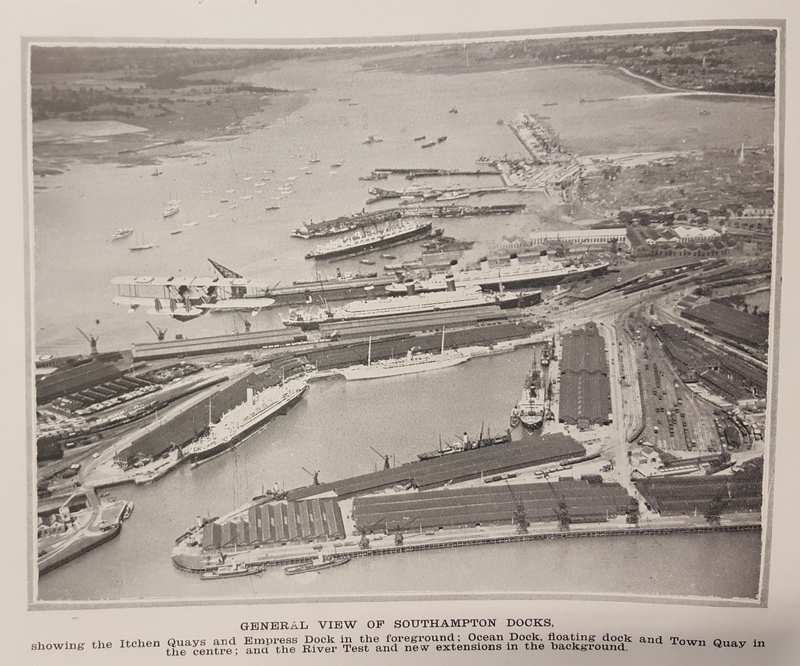 The Shipping World of November 18th 1931, showing the Olympic and others at the Ocean Dock in Southampton. 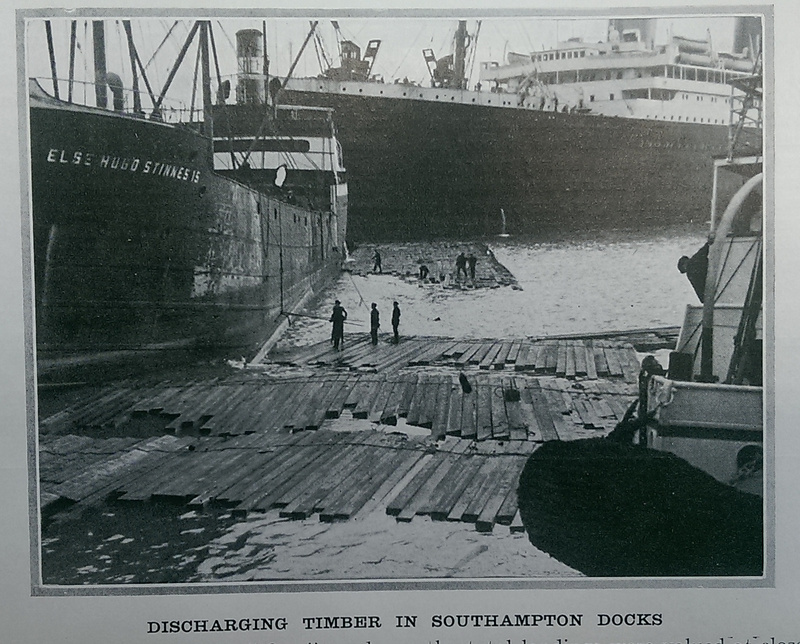 Timber is discharged at Southampton while the Olympic lurks in the background. 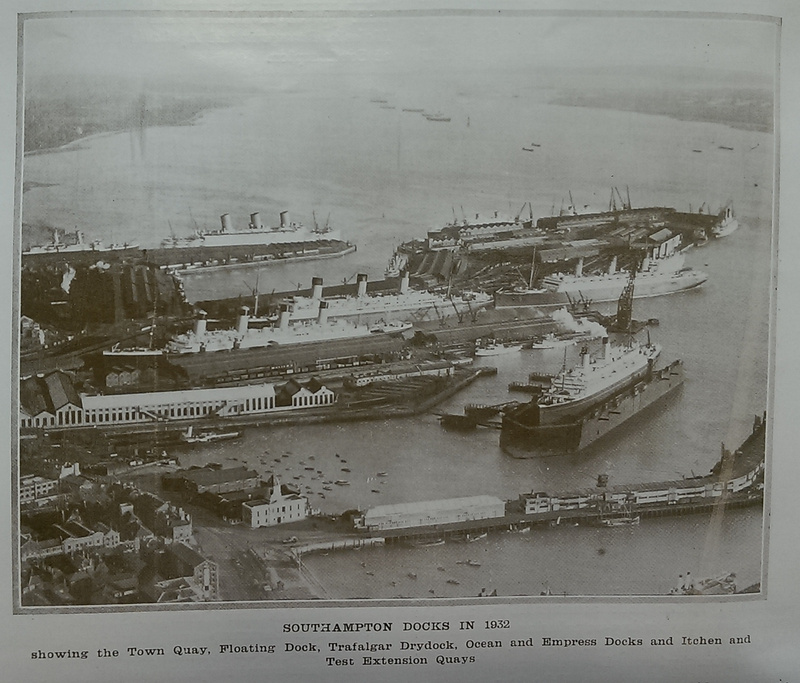 The Syren And Shipping Supplement of October 12th, 1938, showing the Olympic and other ships in Southampton in 1932. 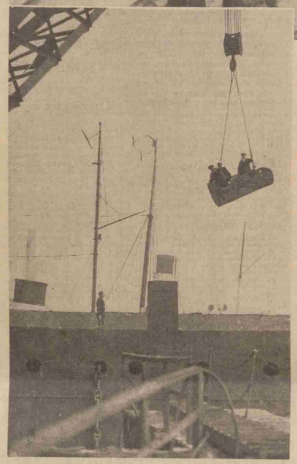 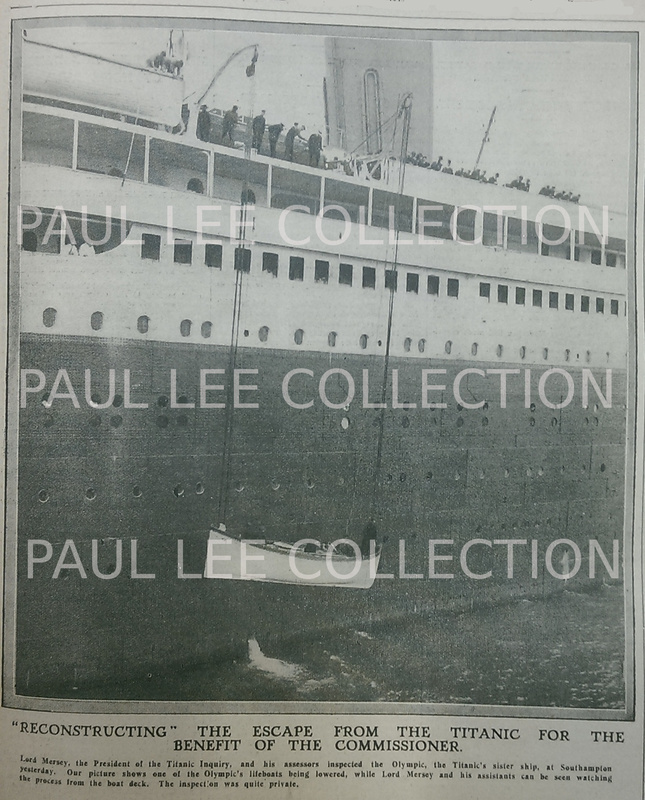 The Dundee Courier And Advertiser of May 16th, 1934, in an article about the Olympic's collsion with the Nantucket lightship. The Syren And Shipping, of August 28th 1935; a picture at the completion of one of her final voyages. 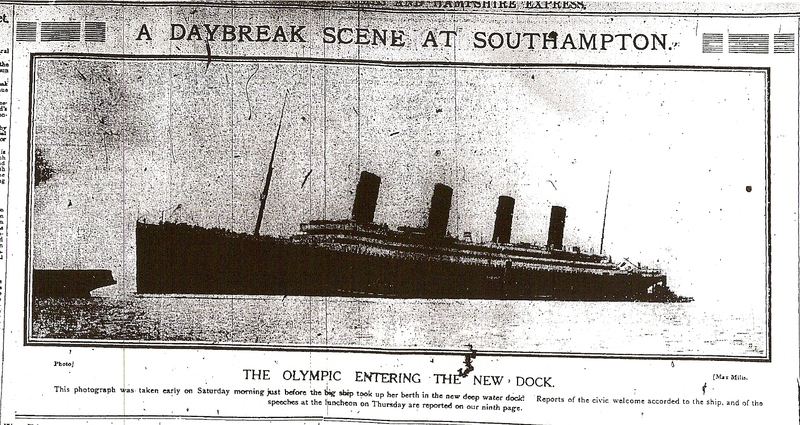 The Olympic starts her final voyage to the breakers. Sadly, there were very few onlookers compared to the send off of the Mauretania four months previously. The Sunderland Daily Echo And Shipping Gazette of 14th October 1935: the Olympic arrives in Jarrow, surrounded by small vessels. 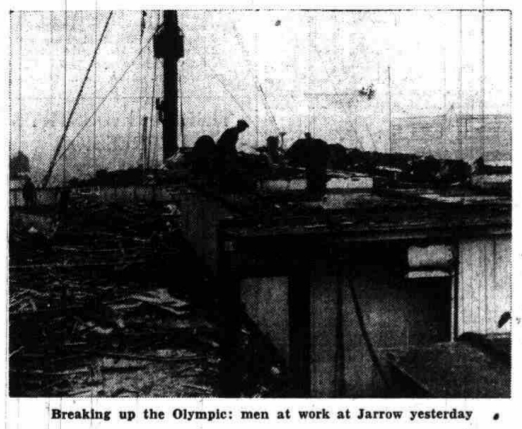 The Olympic is berthed in Jarrow, ready for scrapping. 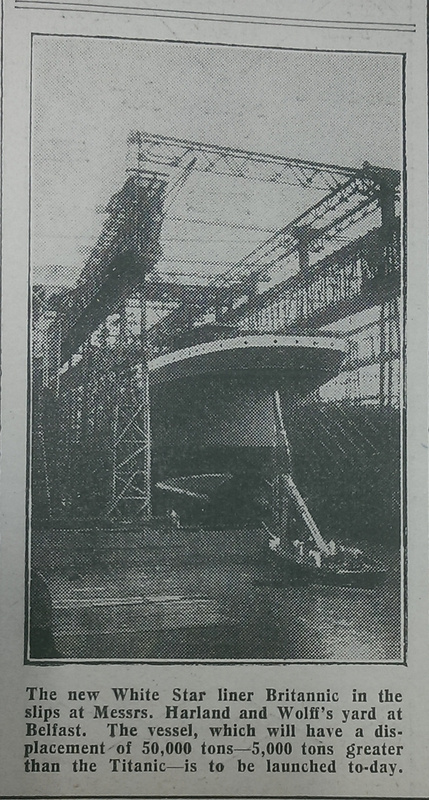 The Sunderland Daily Echo And Shipping Gazette, 15th October 1935. 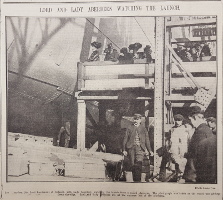 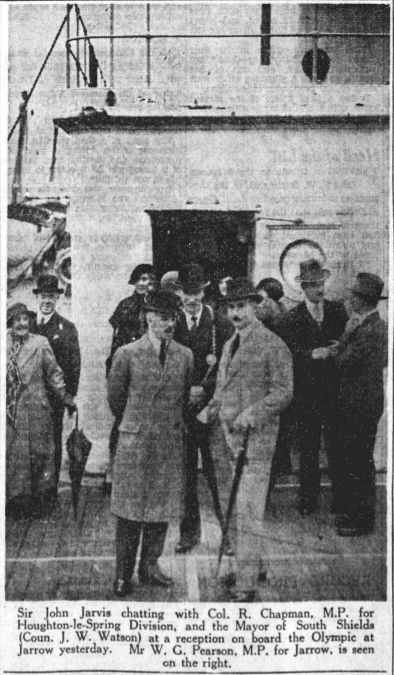 Sir John Jarvis attends a reception on his ship soon after she arrives in Jarrow. 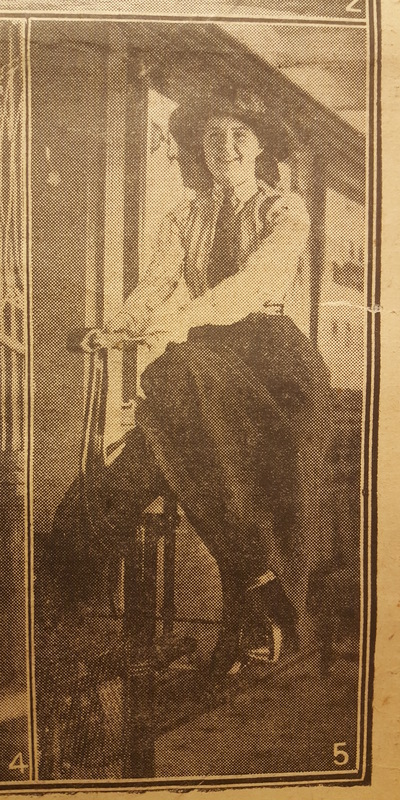 The Sunday Post of November 10th, 1935. 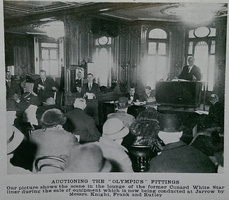 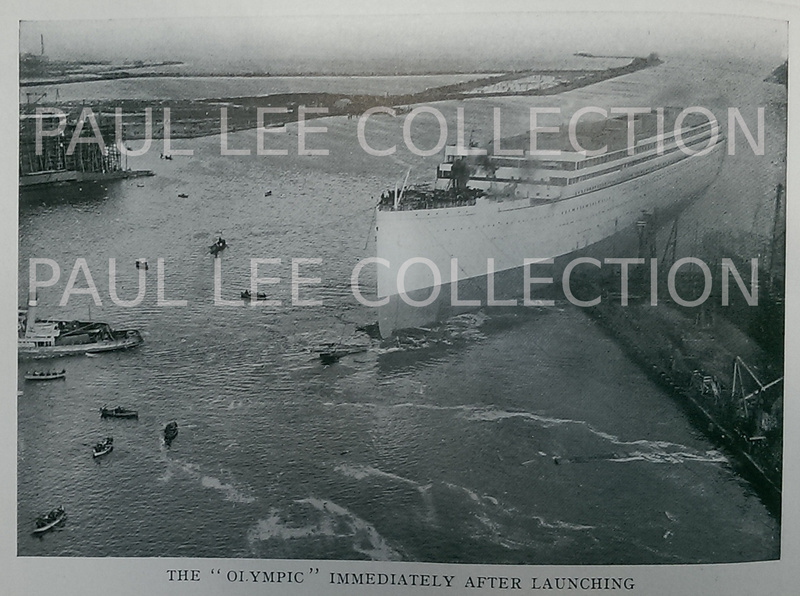 The Syren And Shipping, of November 13th 1935; the Olympic's fixtures are auctioned off in her lounge. 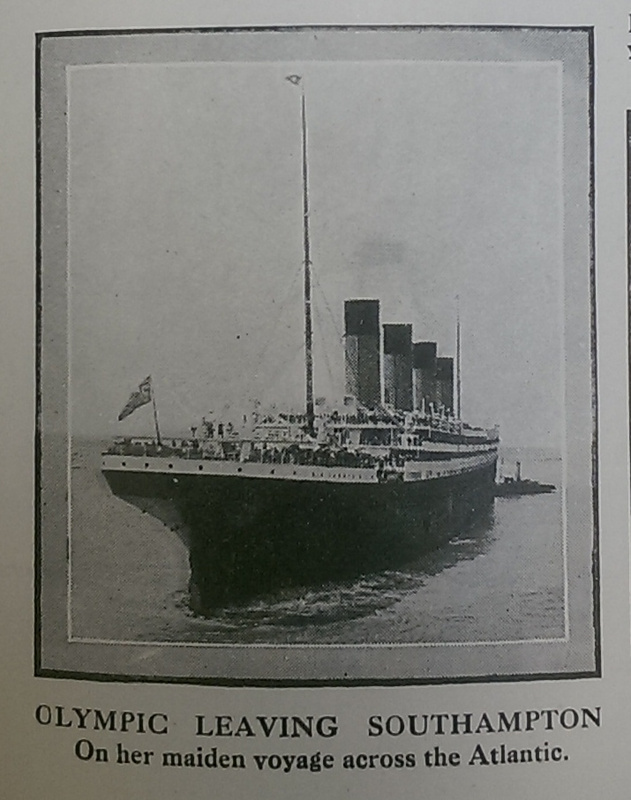 The Syren And Shipping, of March 4th 1936; an advert for Southampton Docks, showing the Olympic and Mauretania. 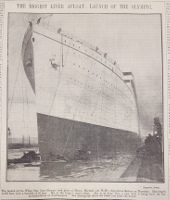 The Dundee Courier and Advertiser of September 22nd, 1937. 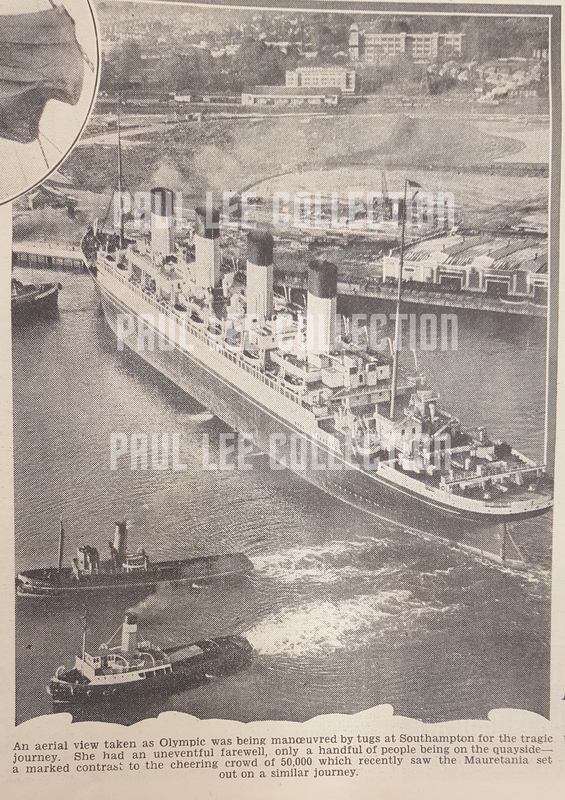 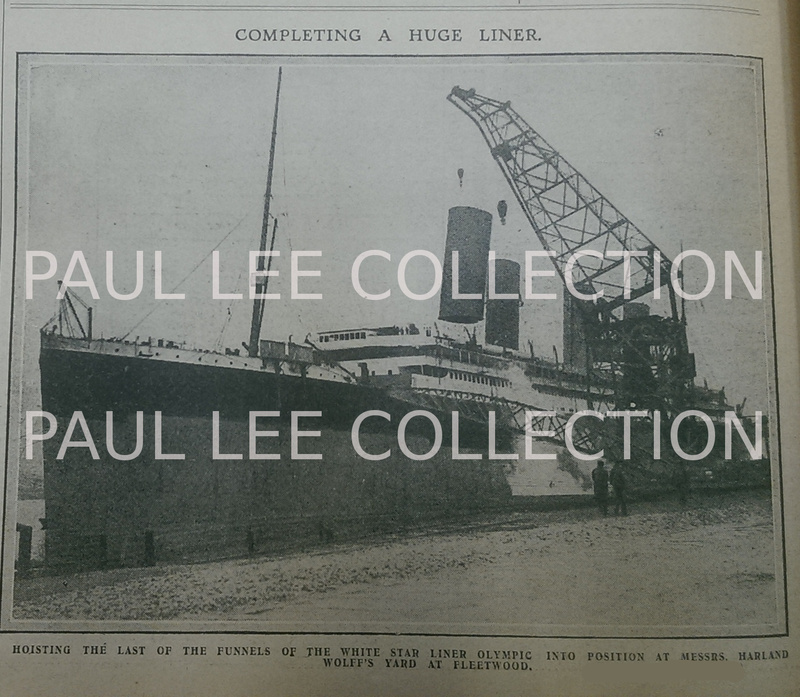 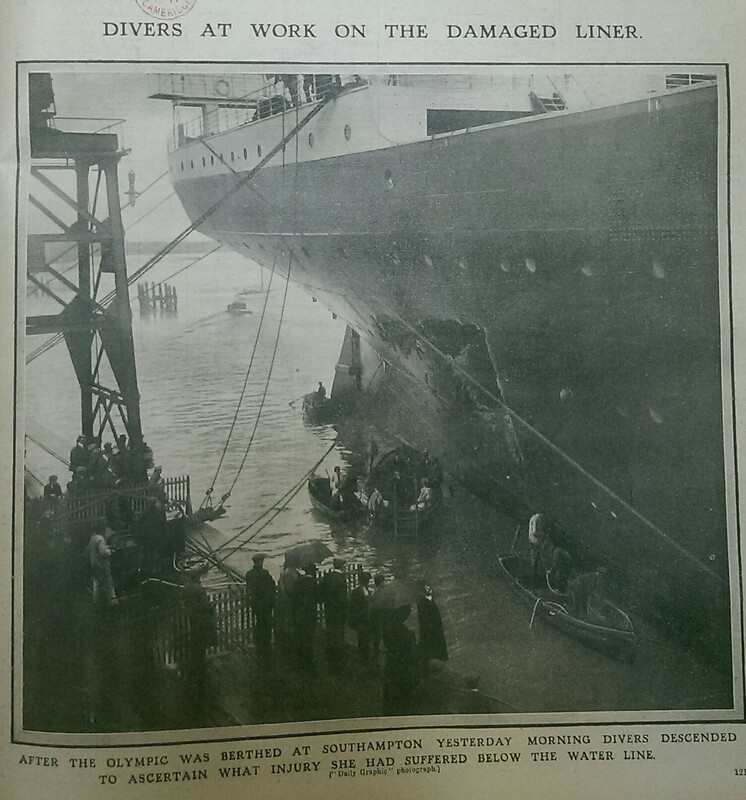 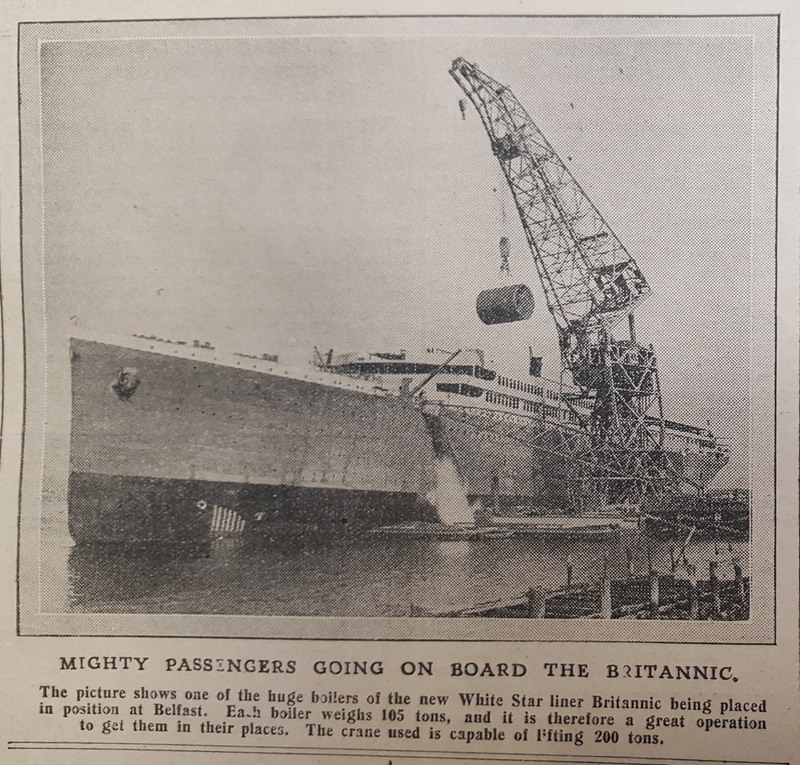 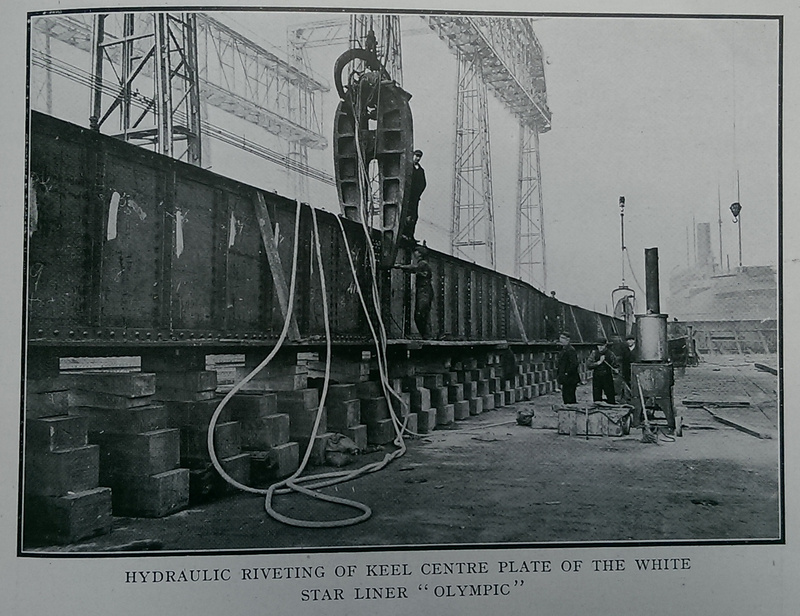 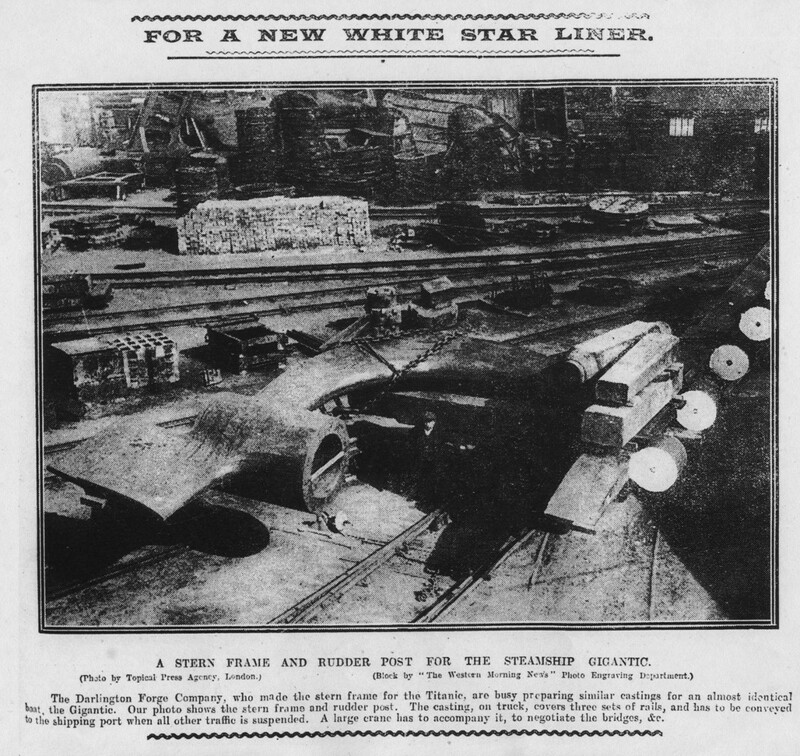 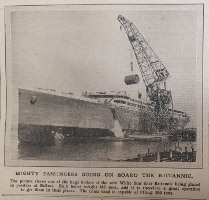 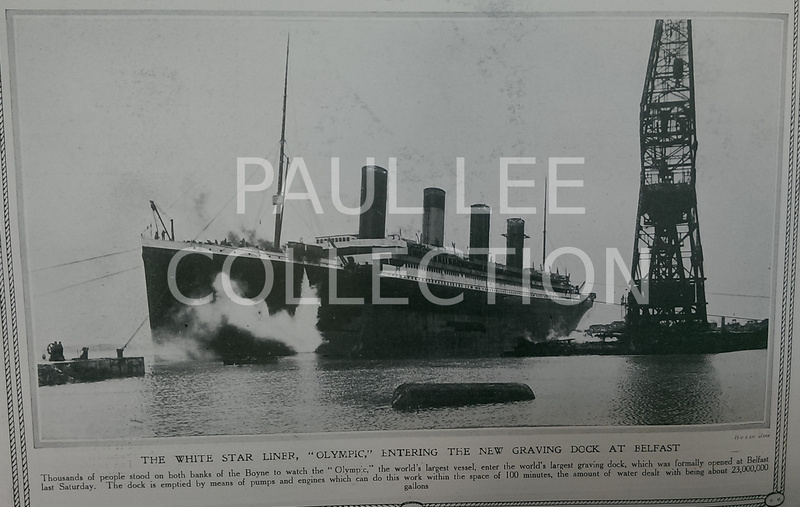 The write-up says: "THIS WAS THE OLYMPIC - the hull of the former White Star liner Olympic arrived at Inverkeithing yesterday from Jarrow. 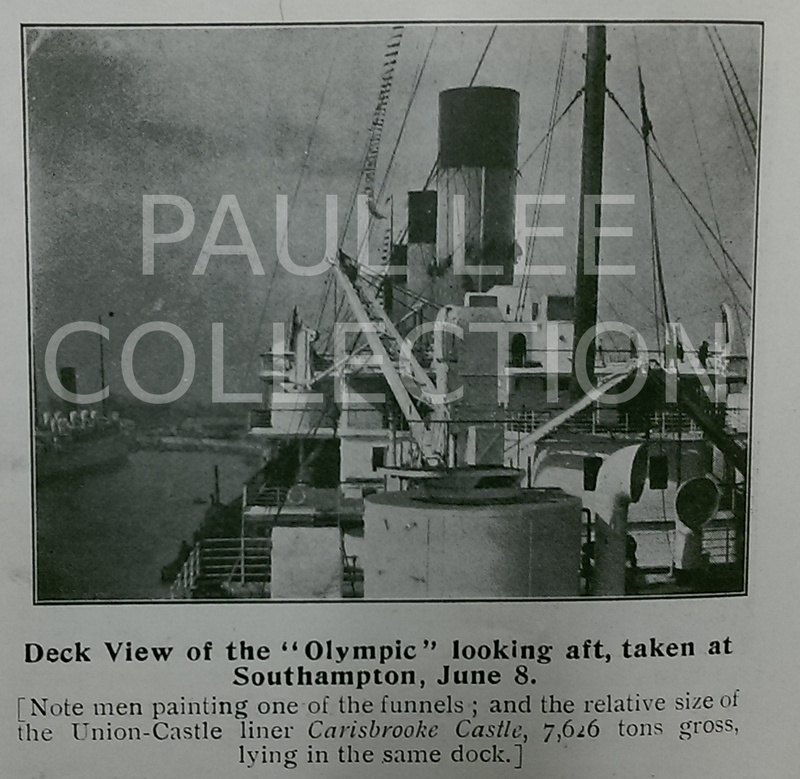 The Olympic was minus decks and funnels, as the picture above shows. 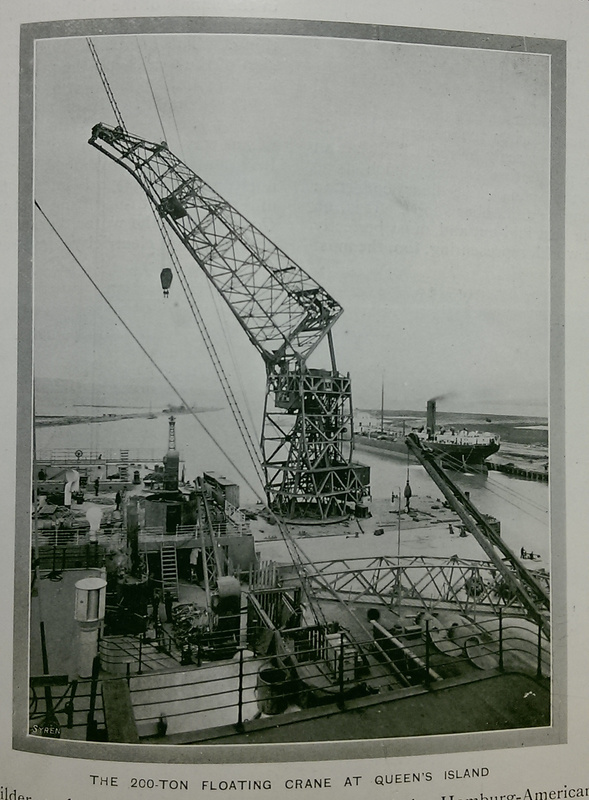 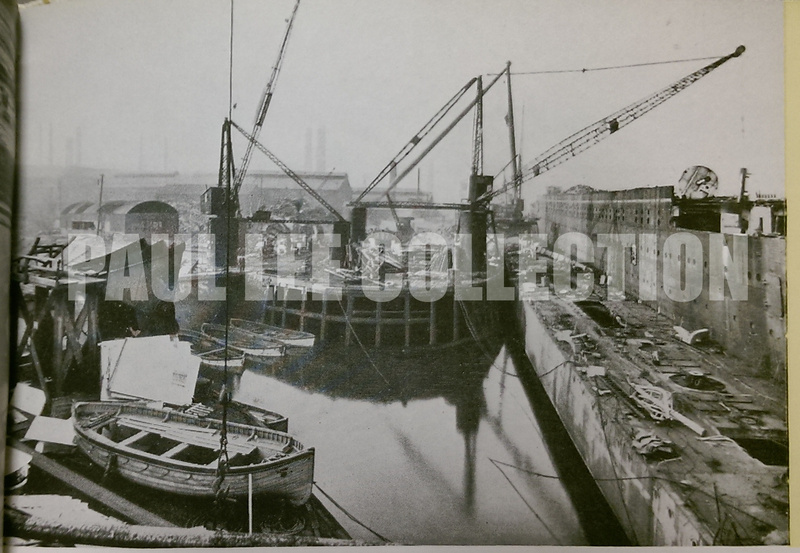 When the captains of the two tugs which towed her north wanted to get ashore the crane had to be employed to swing them from the tugs over the hull of the giant liner [as seen in the picture below]." 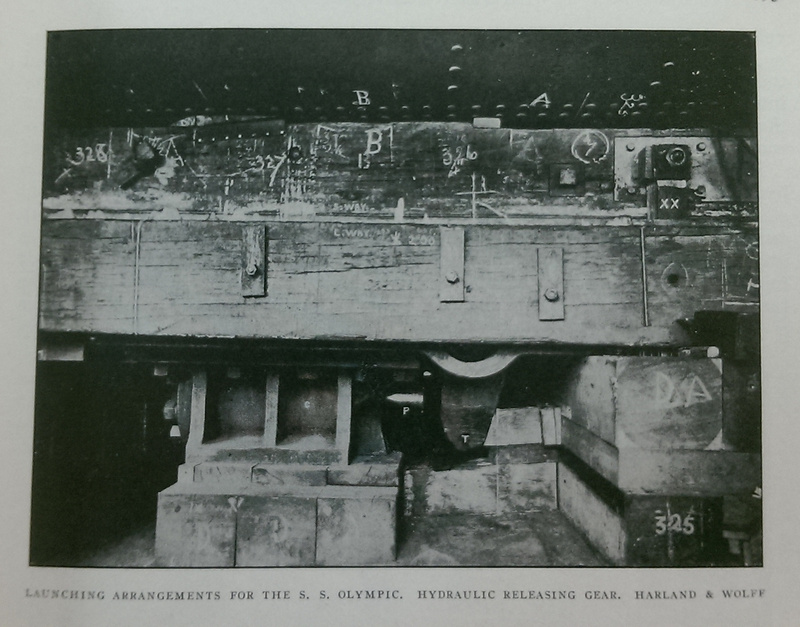 The shorn remnants of the Olympic at Inverkeithing. 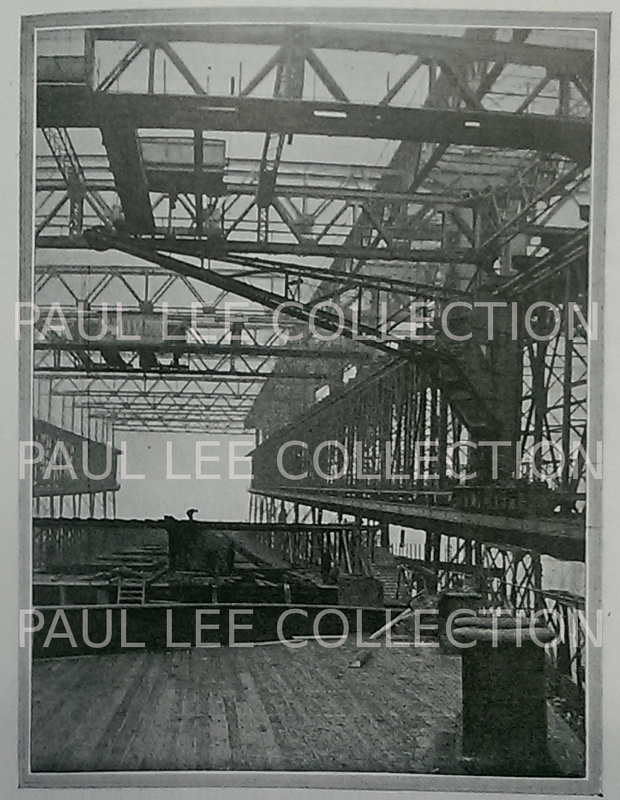 Bill Sauder informs me that this is probably taken on E deck looking forward and near the 3rd class pantry door on the port side, abreast of the No.2 boiler casing. 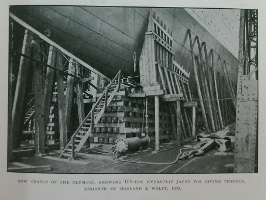 E deck has been partially removed, exposing F deck below. 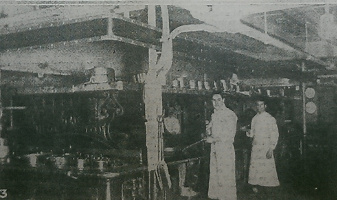 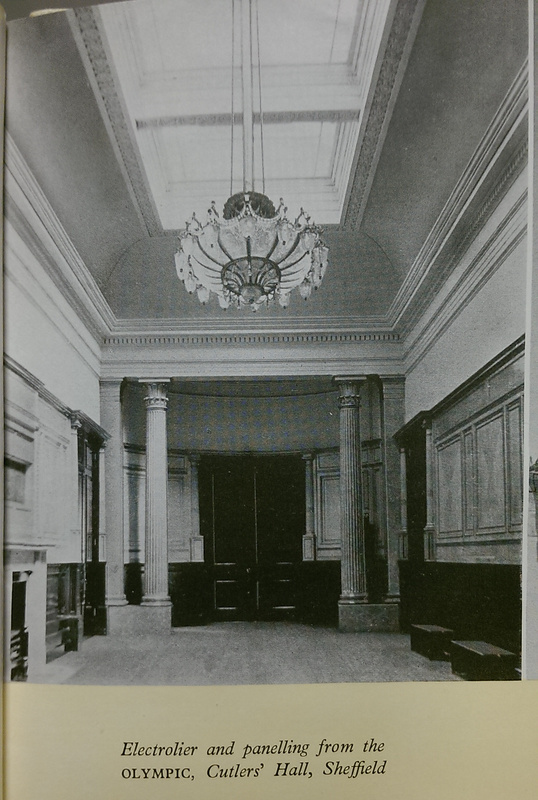 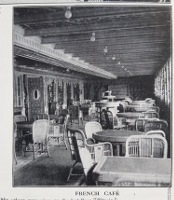 The large open space to the right is the 3rd class dining room, and the circular objects are the No.3 boiler casing fans. The Olympic's D deck electrolier graces the staircase at Thos. 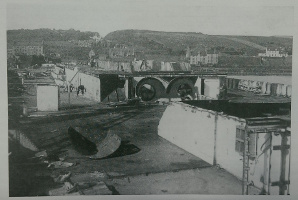 Ward's Albion works. 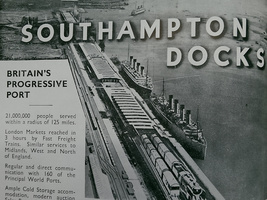 The painting of "The Approach To the New World" eventually wound up in the Southampton Maritime Museum. 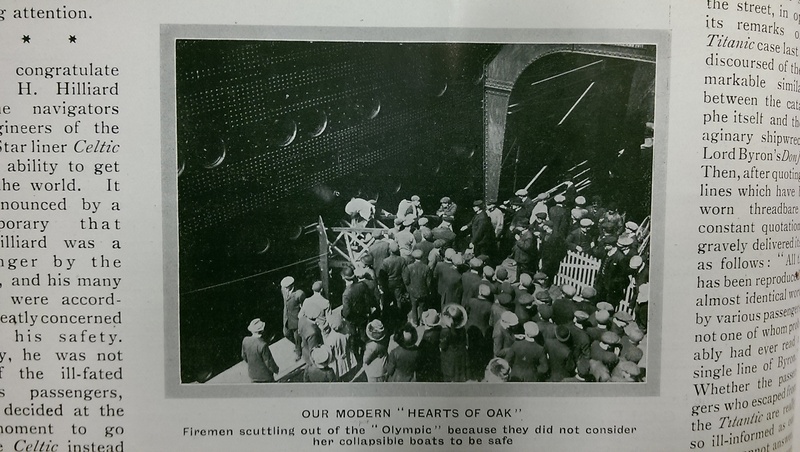 I do not know what happened to the chandelier, nor what happened to the large model of the Olympic at that building. 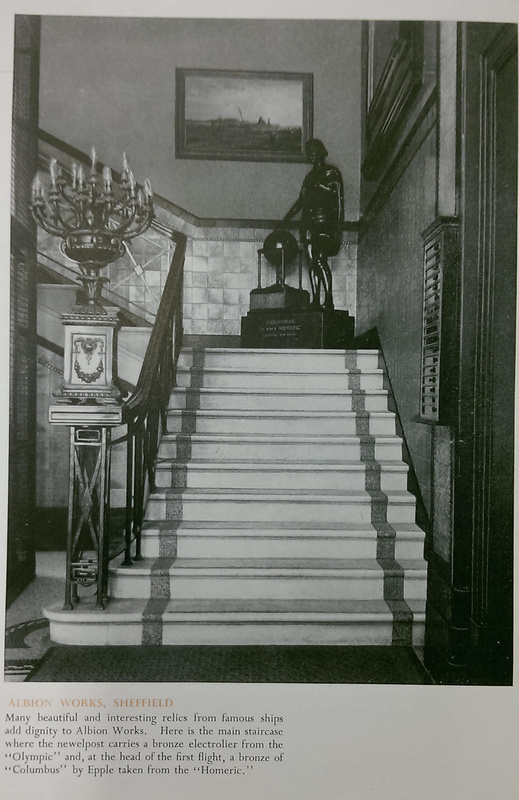 The statue of Columbus from the "Homeric" is currently on display at the Guildhall in Southampton. 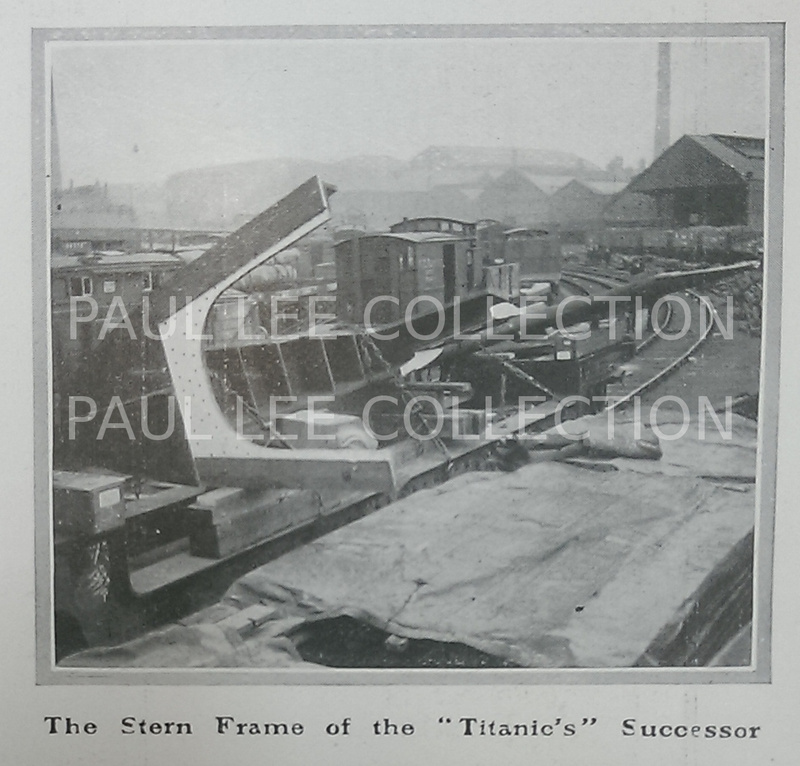 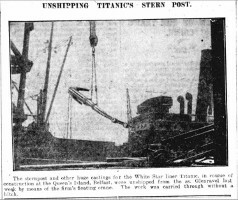 The Titanic's stern frame is unloaded at Belfast. 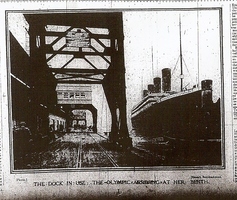 The two ships under the gantry. 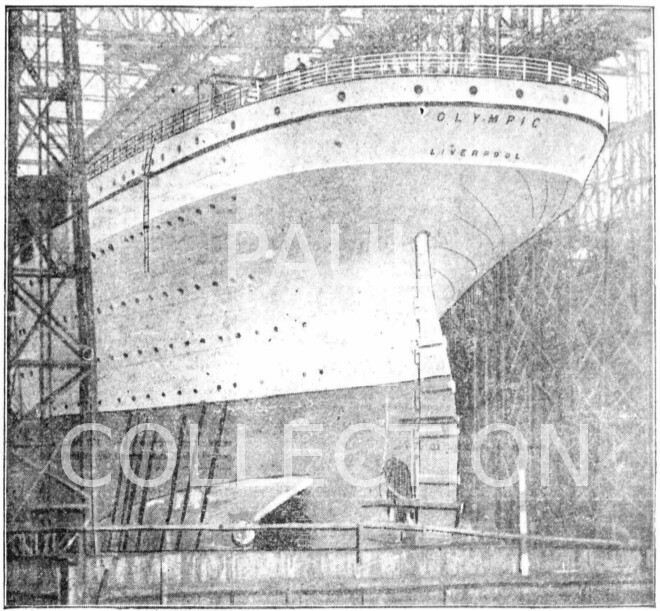 The Titanic on the stocks, some 7th months before launch. The Titanic in the gantry, being launched, and then successfully afloat. 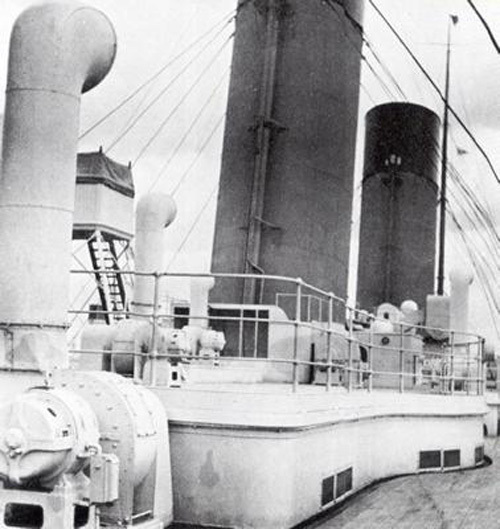 The near broadside view of the ship afloat seems to be different from similar views that are customarily printed, as it shows two tugs off the starboard bow. 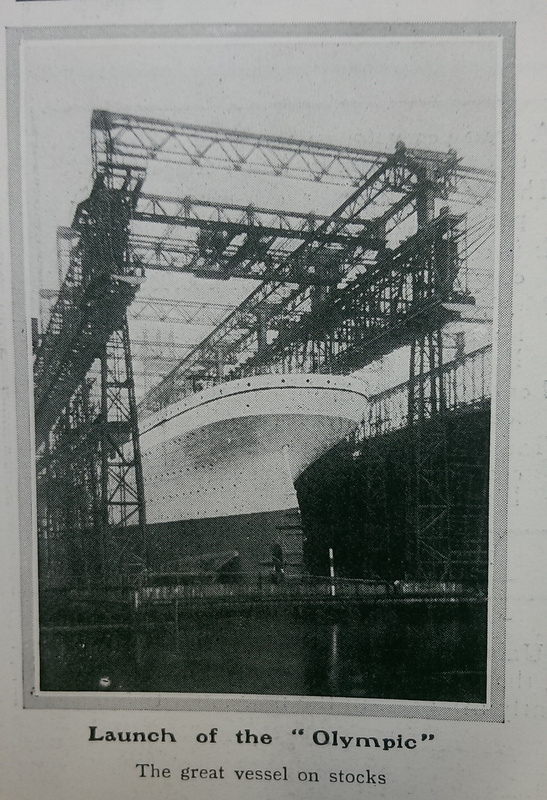 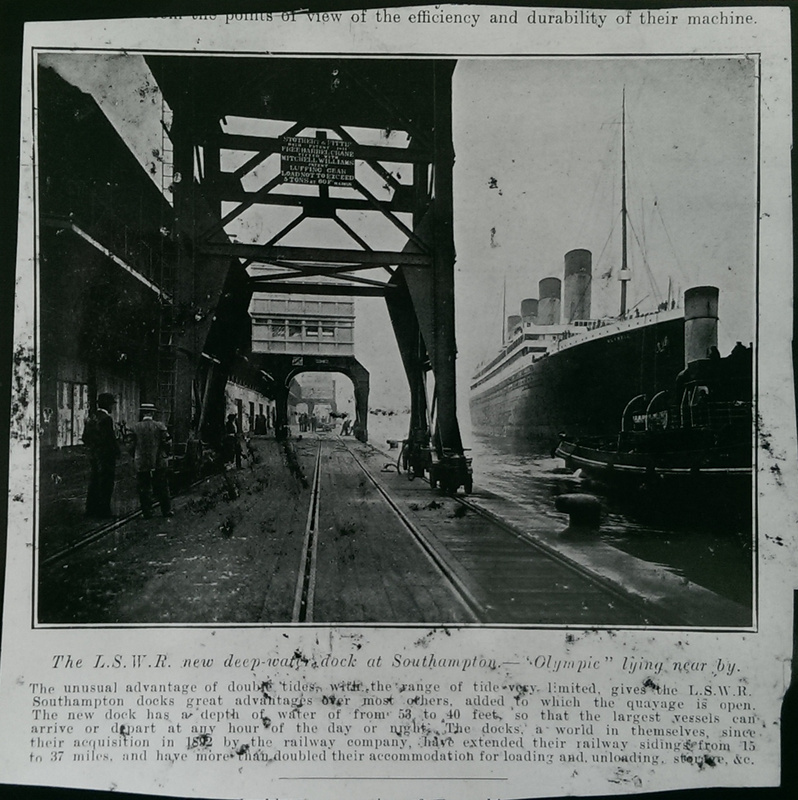 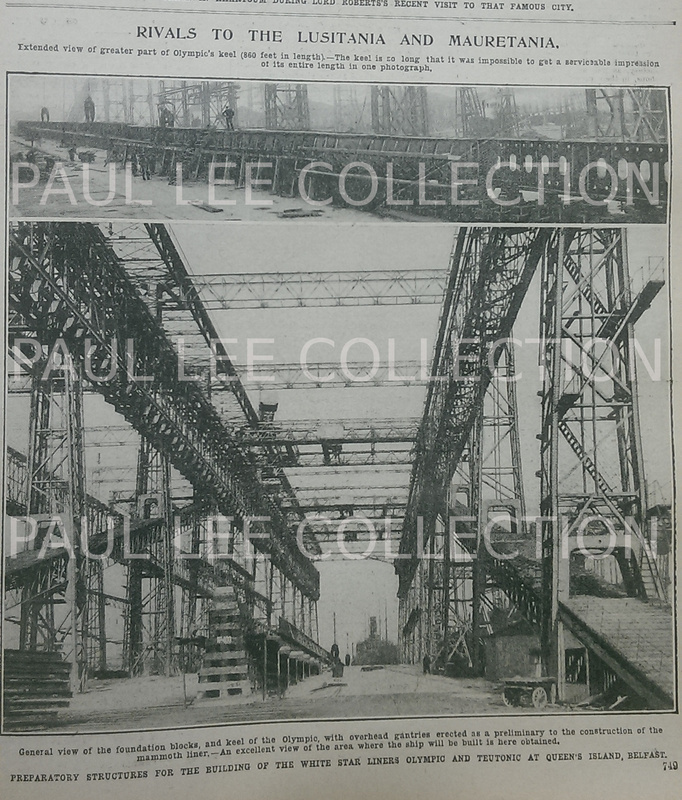 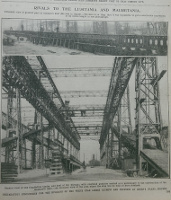 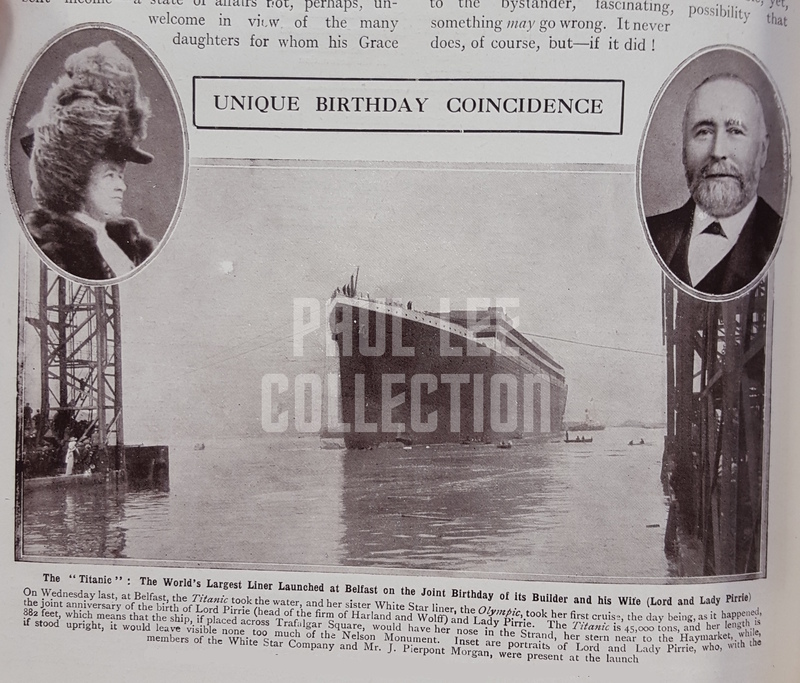 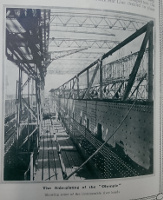 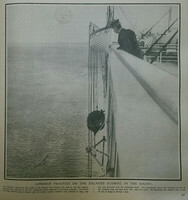 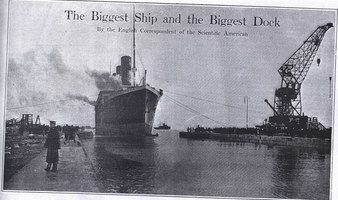 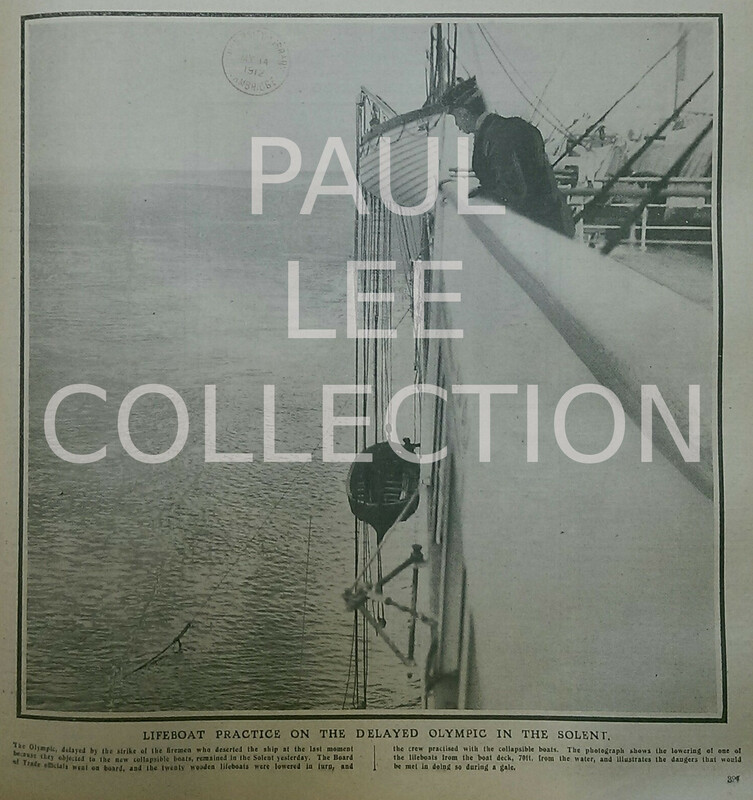 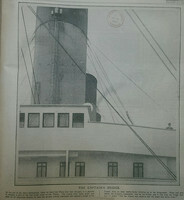 A later edition of the newspaper states that the photo of the ship on the gantry is credited to "Lord, Freshwater." 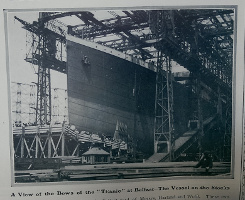 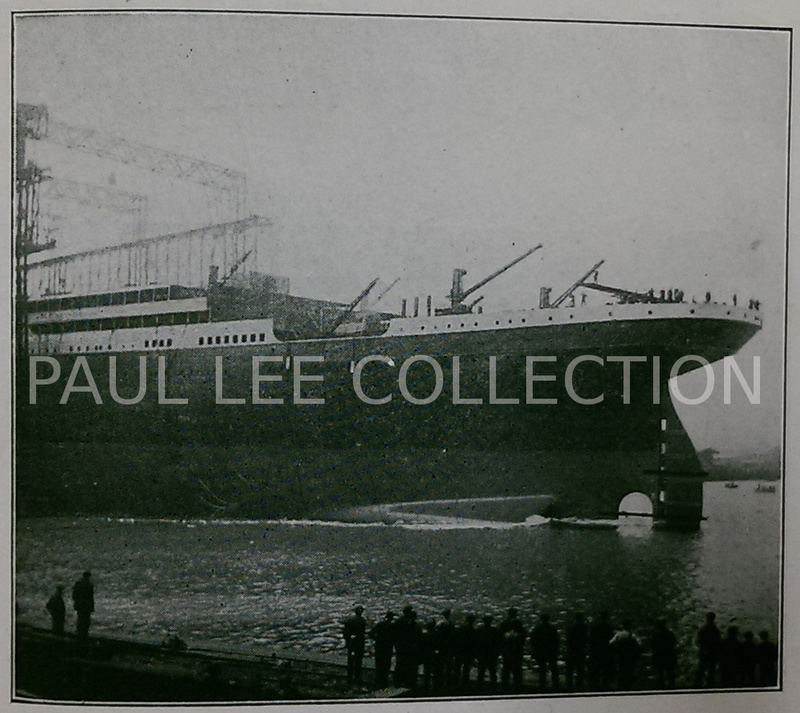 A rare starboard side view of the Titanic under the Arrol Gantry not long before launch. 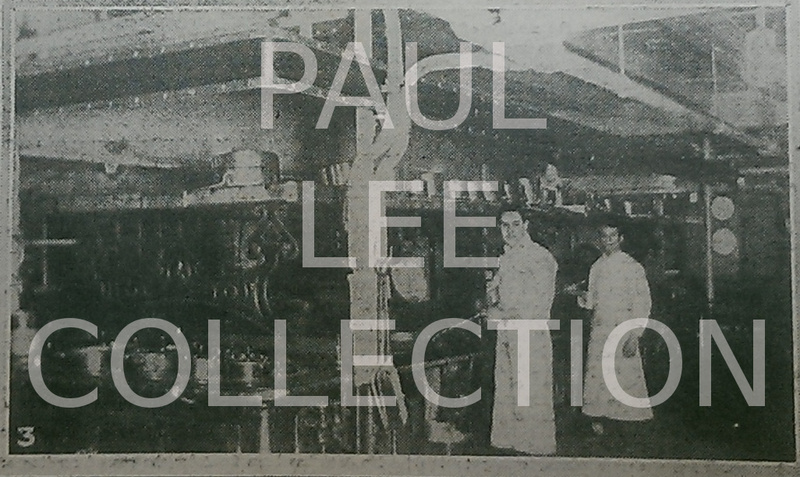 An unfortunately murky image from microfilm. 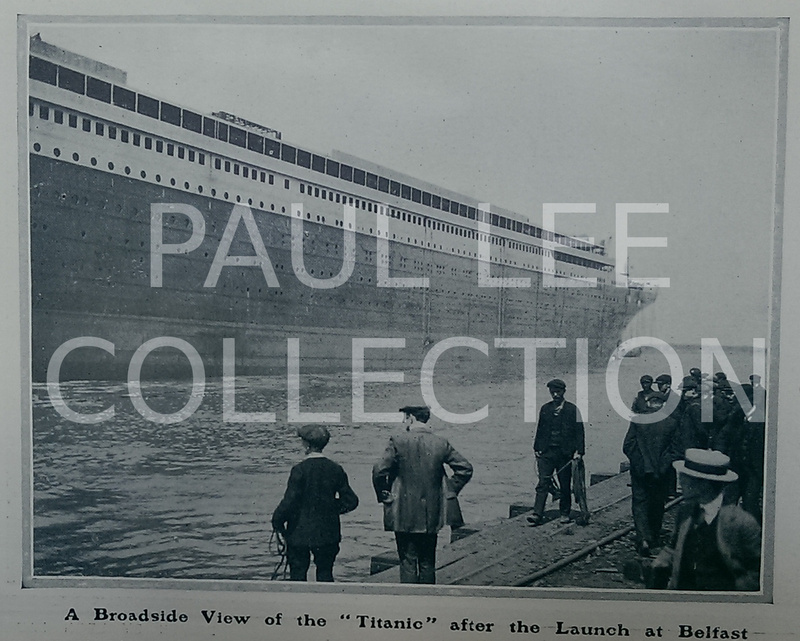 Broadside view soon after launch. 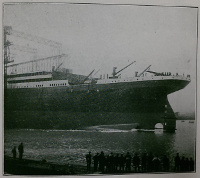 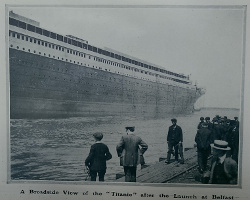 The Titanic launched and afloat. 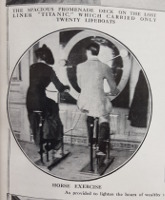 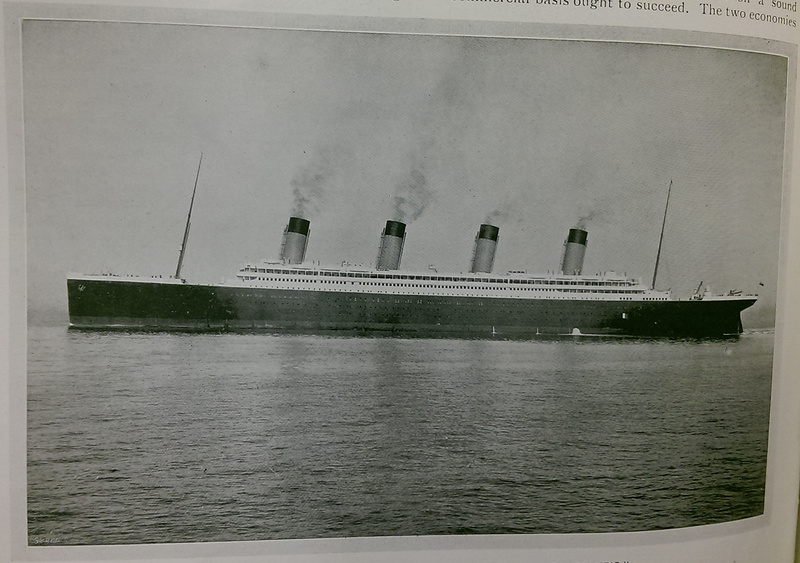 Although similar to the photo at the top of "Titanic in Photographs" page 46, this was probably taken seconds beforehand. 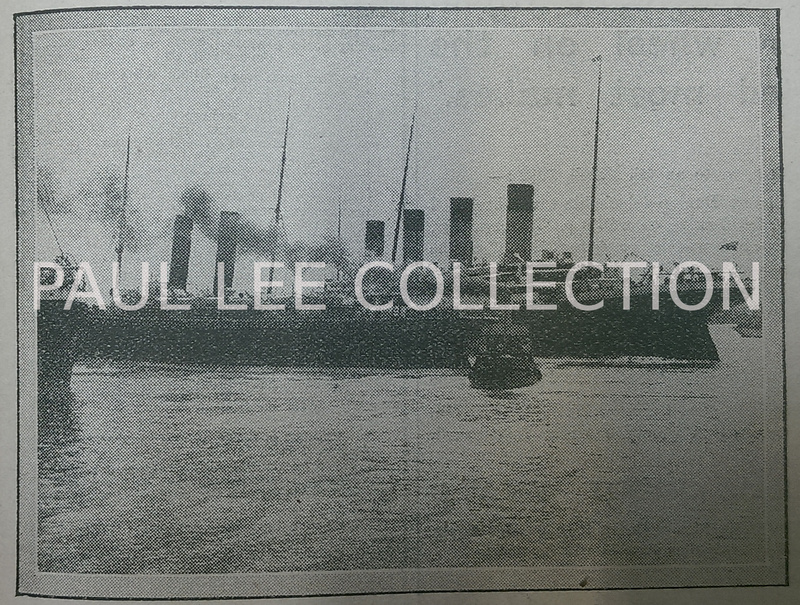 This is from microfilm and is unfortunately murky; hopefully a printed version will be clearer. 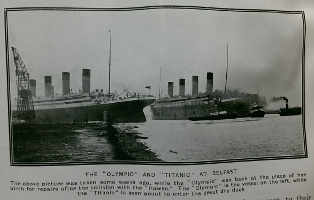 This heavily retouched photo shows the Titanic's workforce leaving the ship at Belfast. 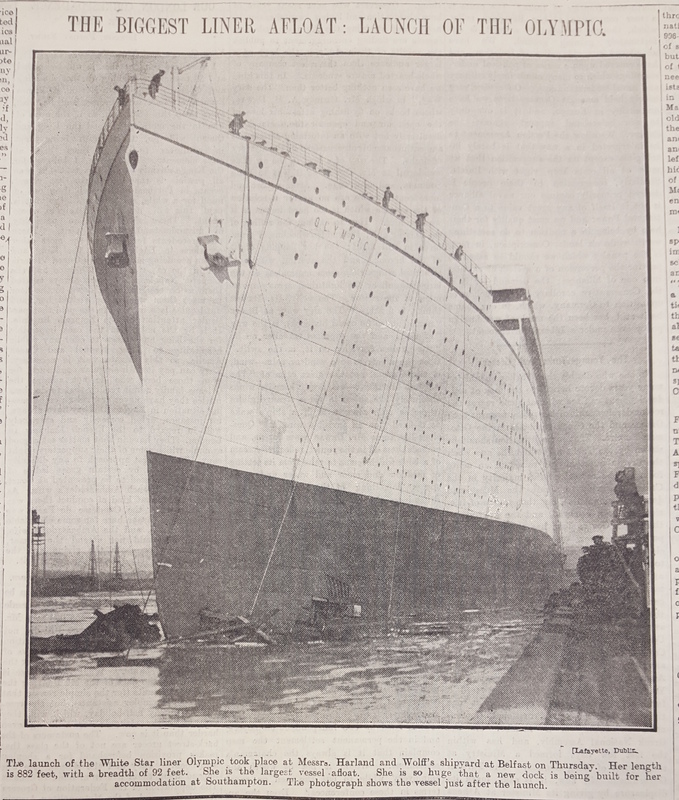 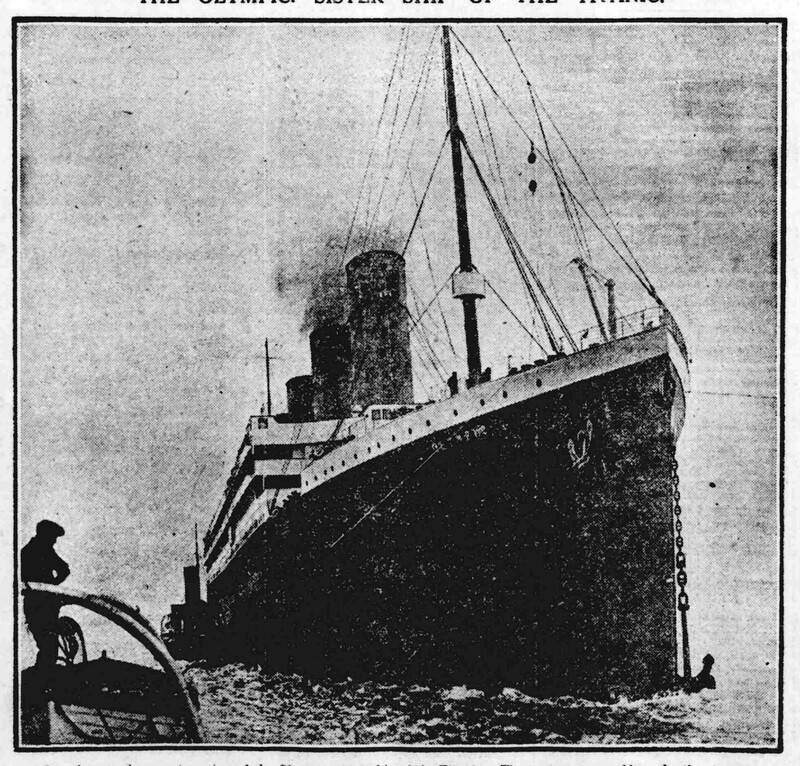 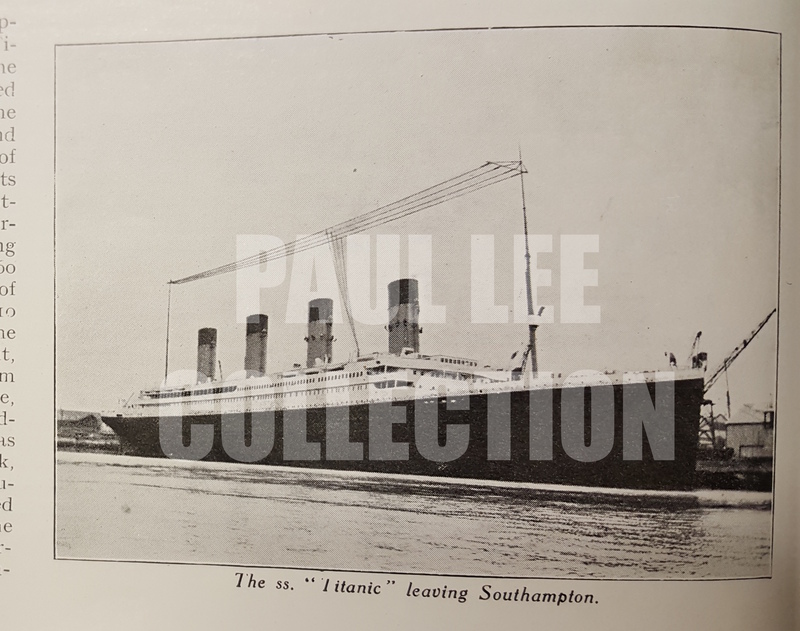 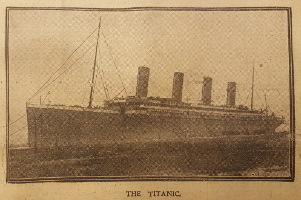 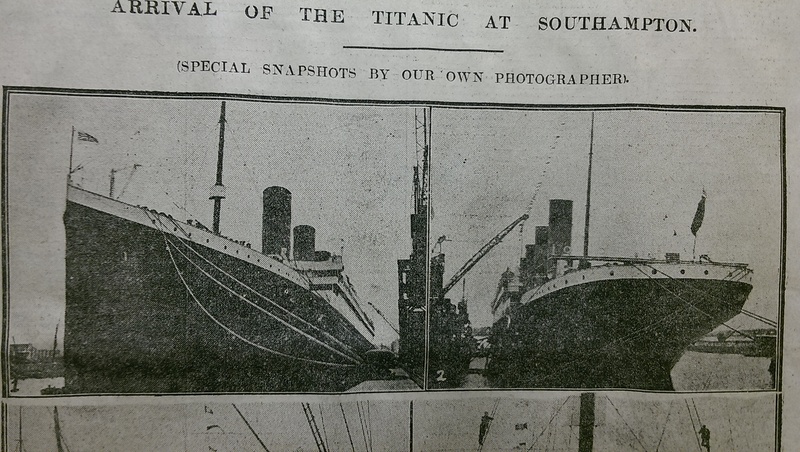 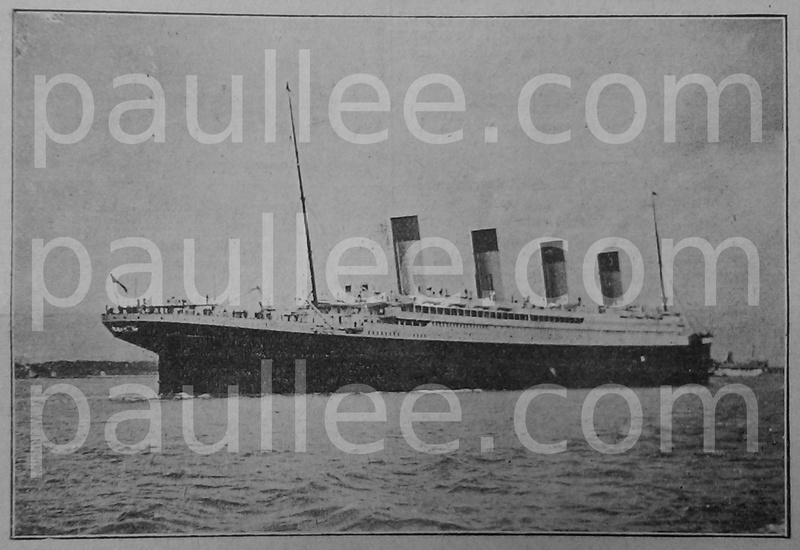 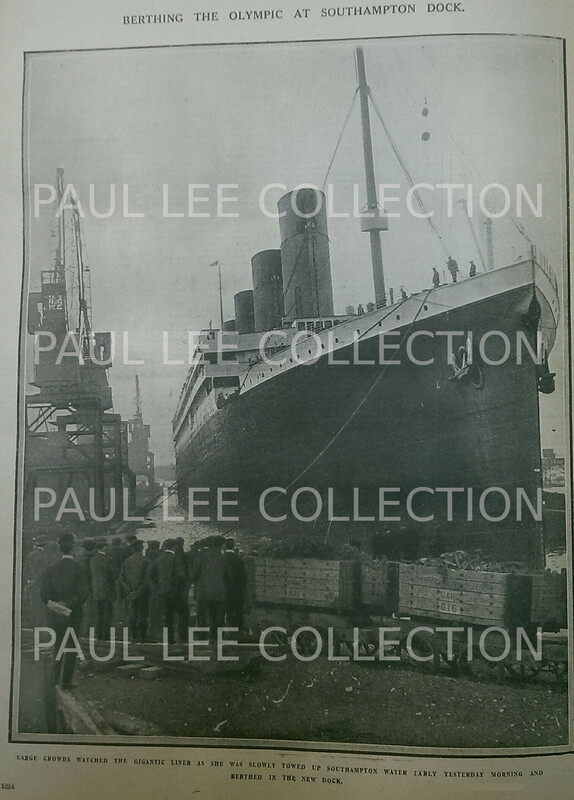 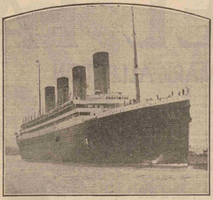 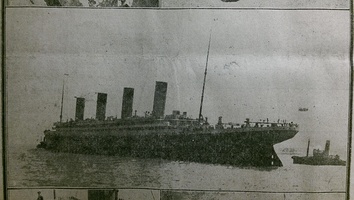 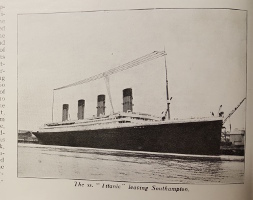 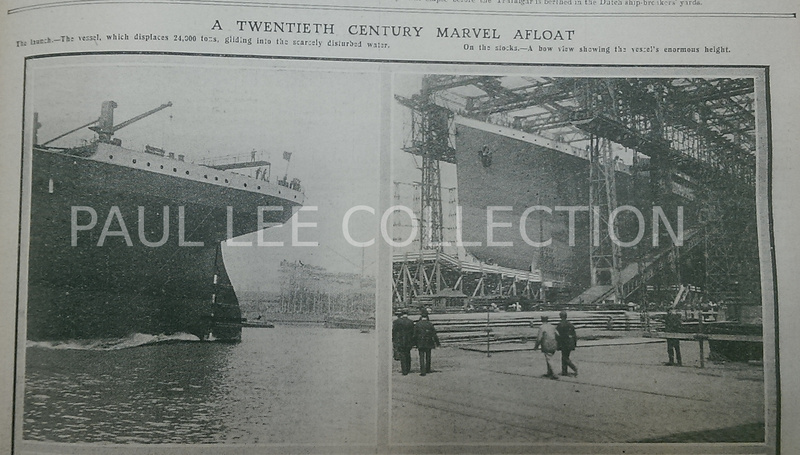 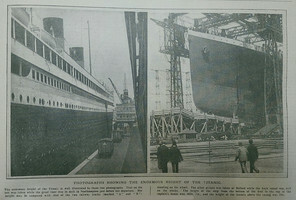 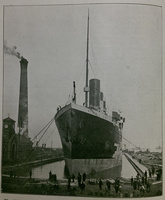 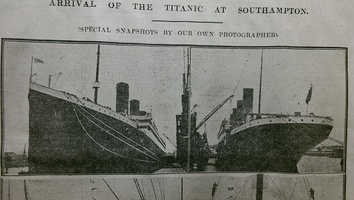 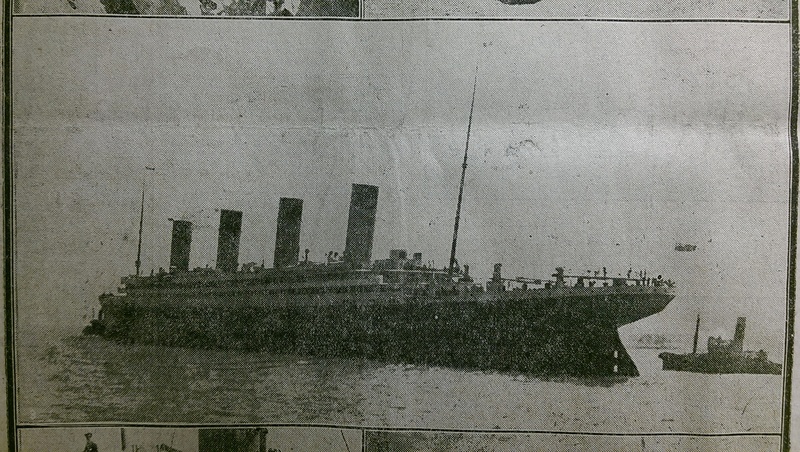 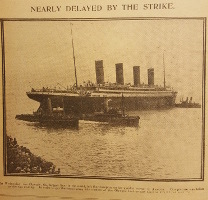 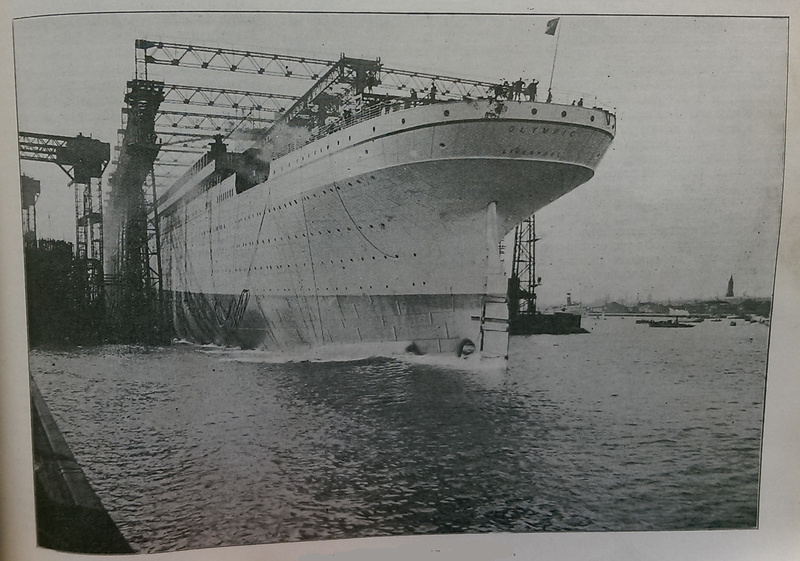 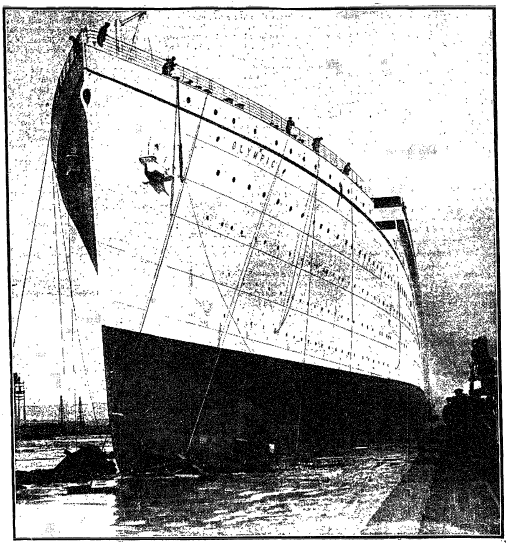 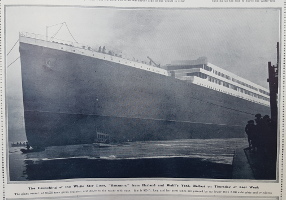 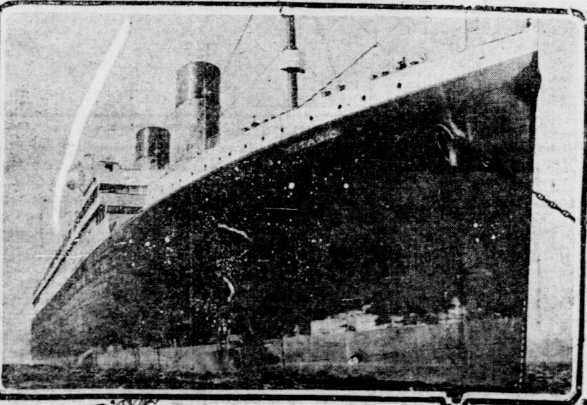 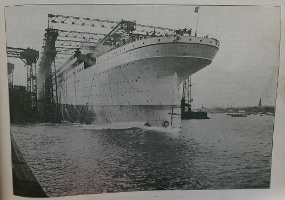 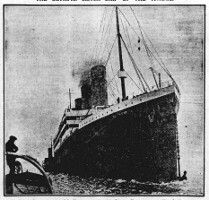 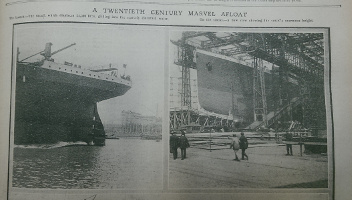 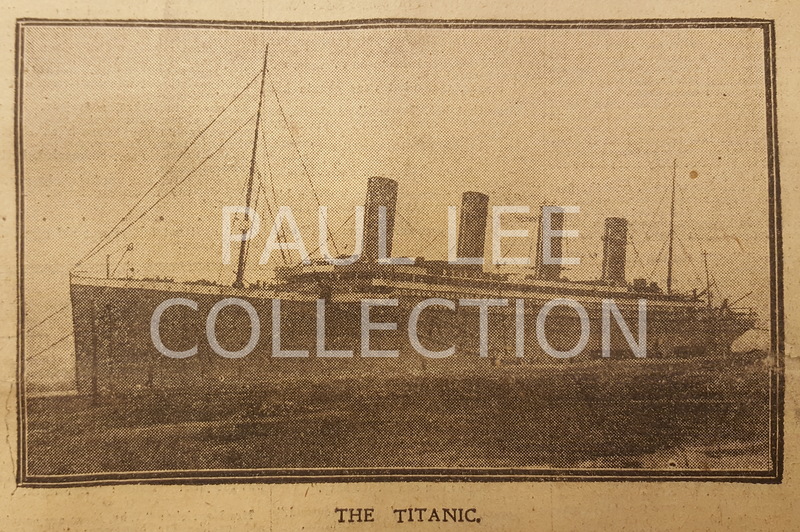 The Titanic in Southampton, from The Hampshire Advertiser County Newspaper, 6th April 1912. 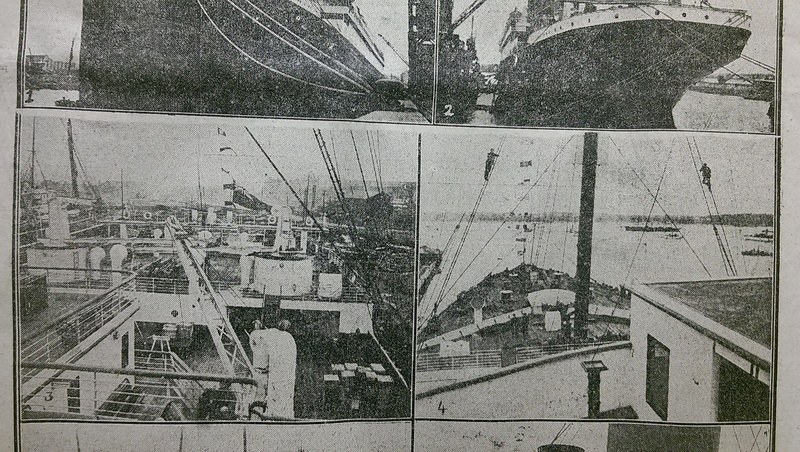 To ensure the best possible quality, I have taken individual pictures of each row of photos, so there is necessarily some overlap. 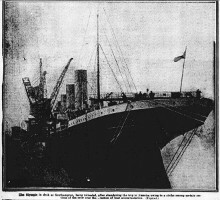 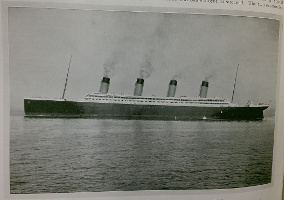 This retouched photo (with the Marconi antenna being shown taut) was taken while the Titanic was being prepared for her only voyage; note the men touching up the funnels. 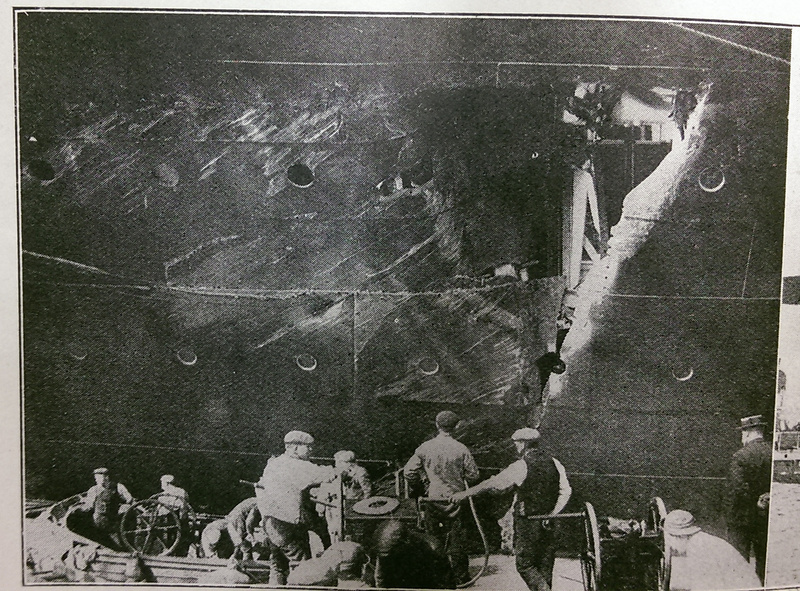 Another view of the near collision. 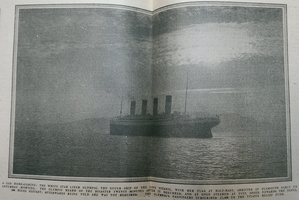 This view is slightly different from the one presented in "Titanic In Photographs" etc. 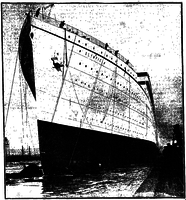 ; the stern of the New York is closer to the Titanic, obscuring the open port side hatch. 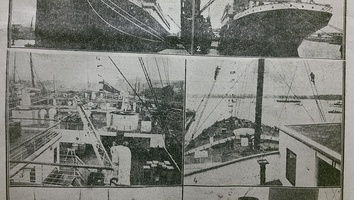 A larger version is shown to the right, showing more to the right and left. 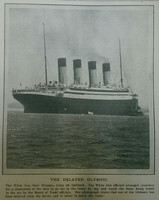 From "The Sphere" of April 20th. 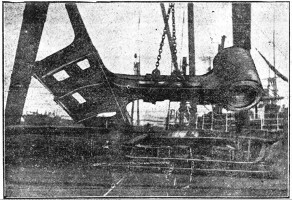 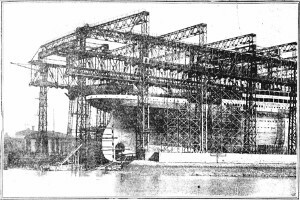 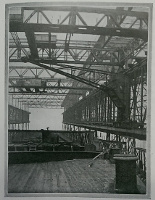 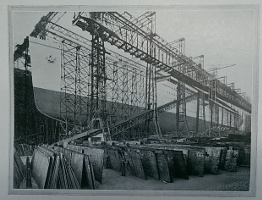 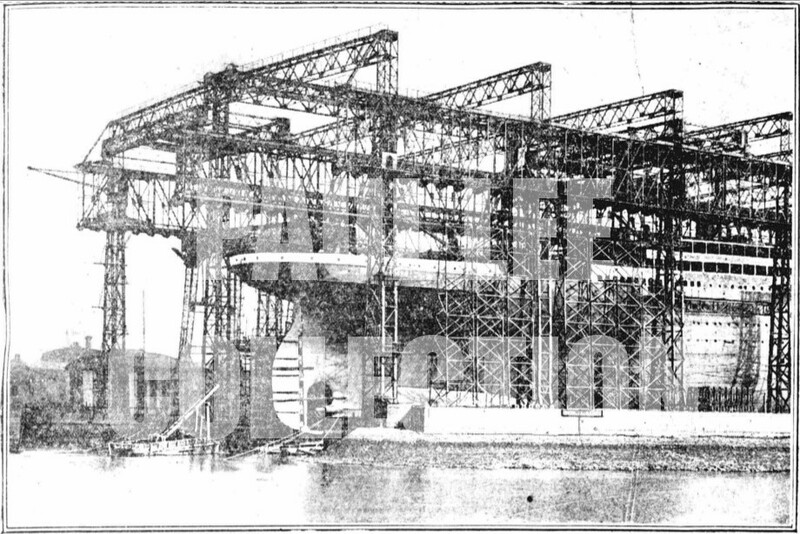 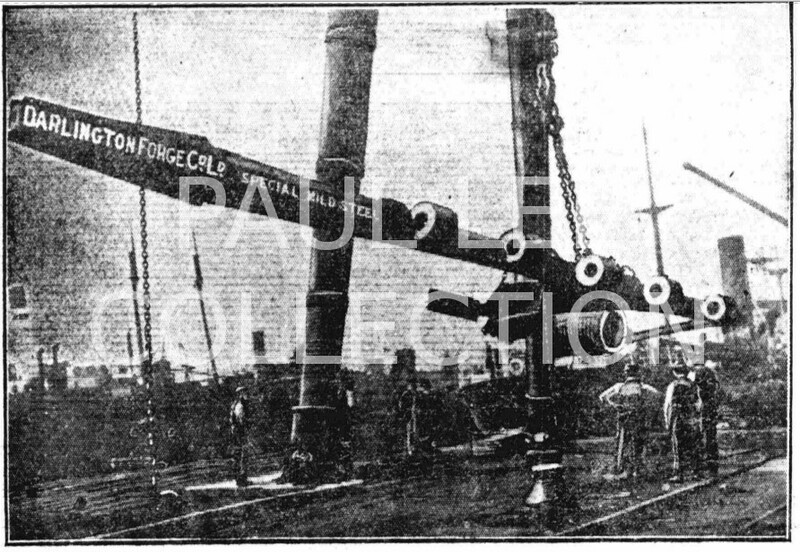 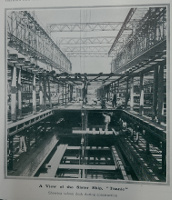 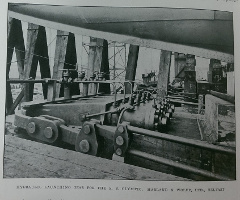 The stern frame and rudder post for the "Gigantic" made by the Darlington Forge Company; from "The Illustrated Western Weekly News" of April 27th, 1912. 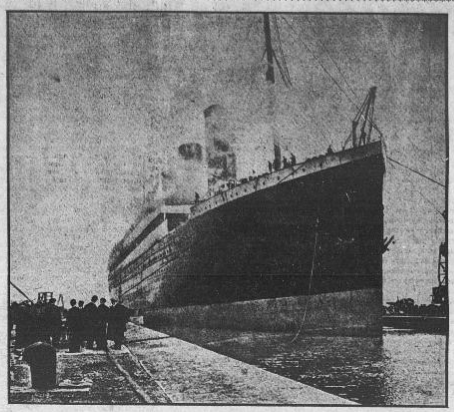 Note the man for scale. 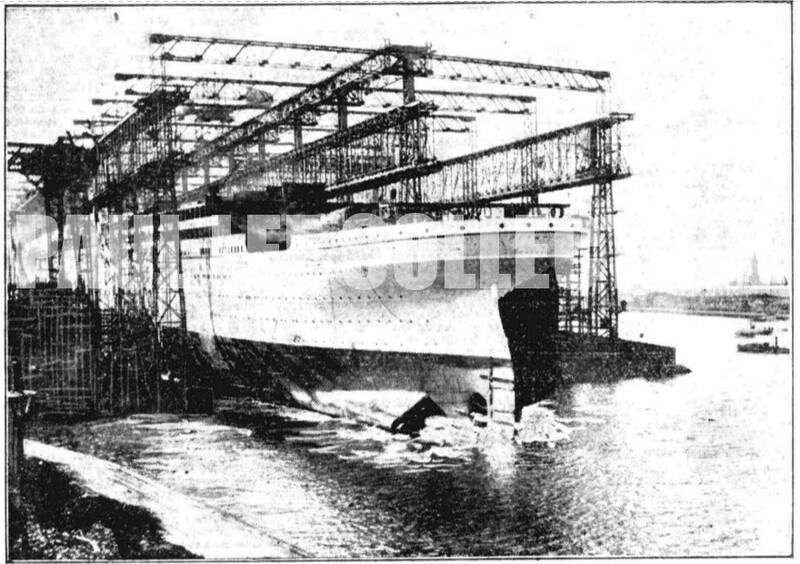 The stern frame of the Britannic heads out from the Darlington Forge. 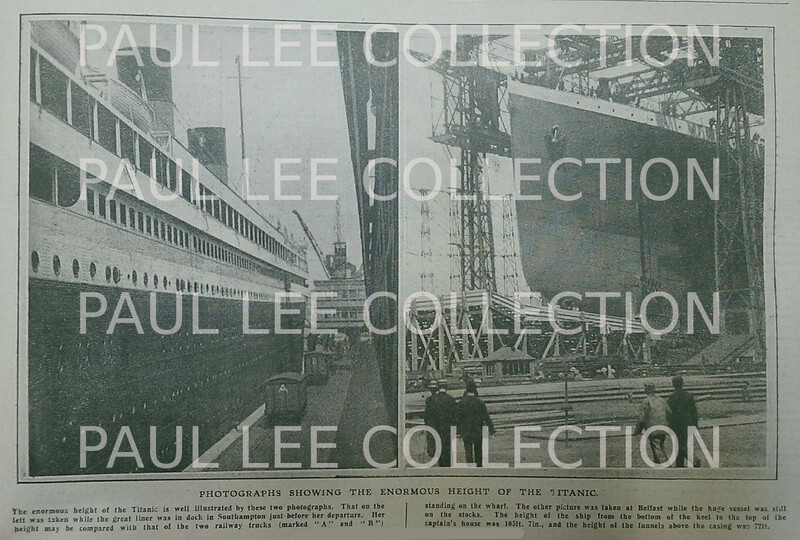 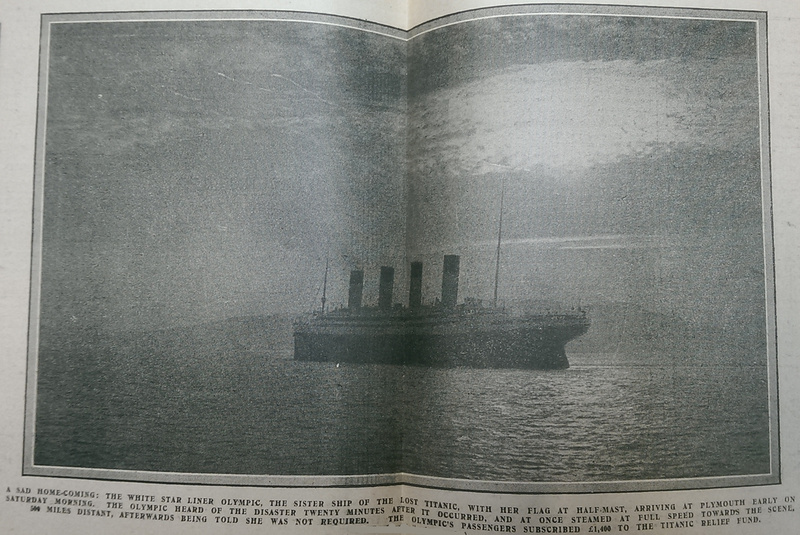 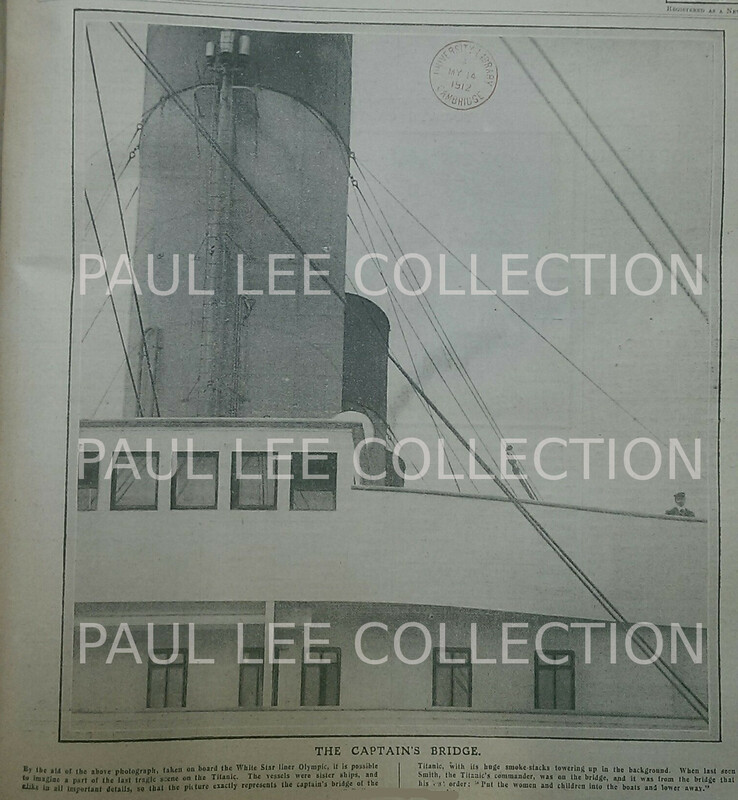 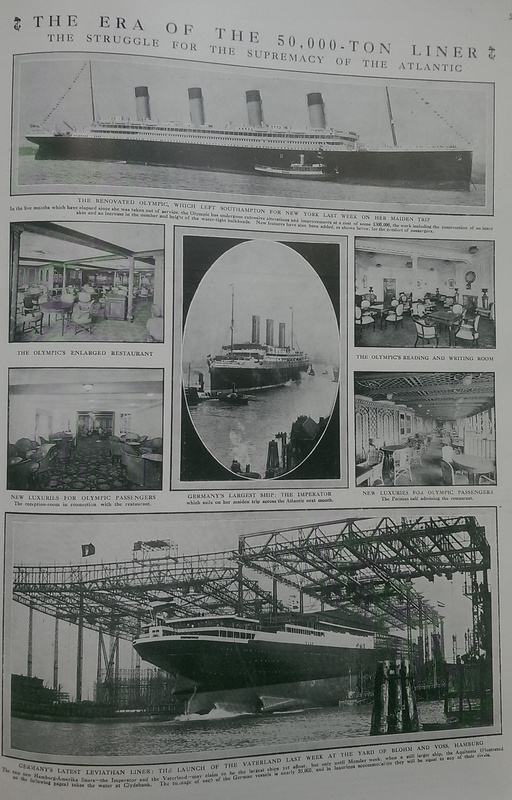 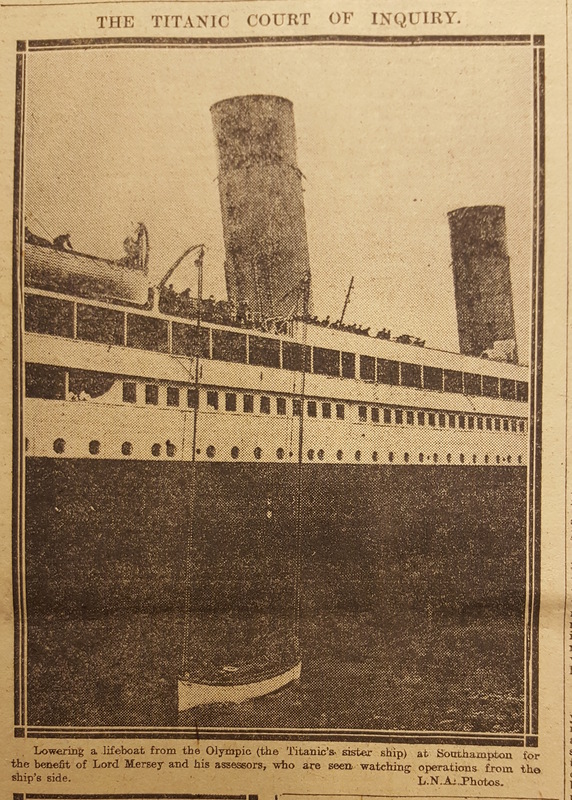 The Daily Mirror of February 28th, 1914 shows the Britannic soon after launch. 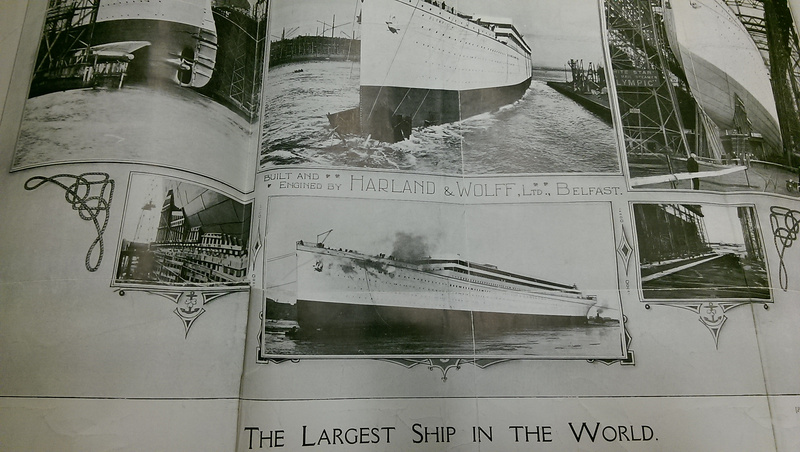 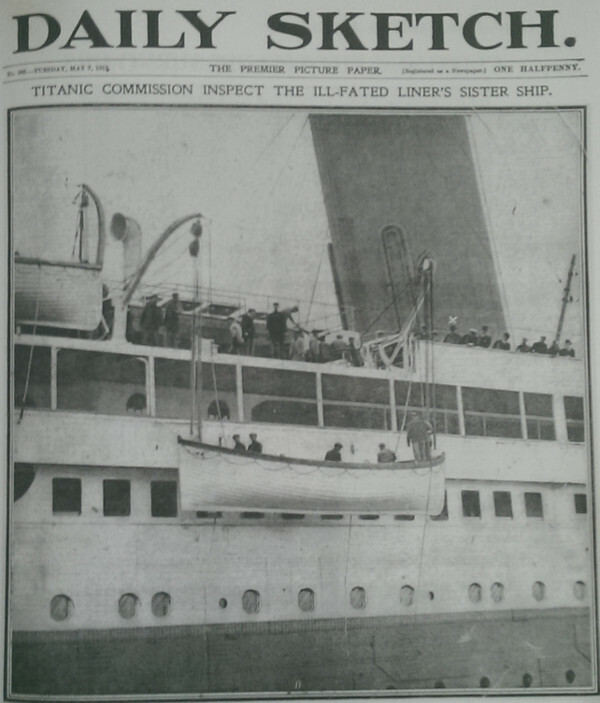 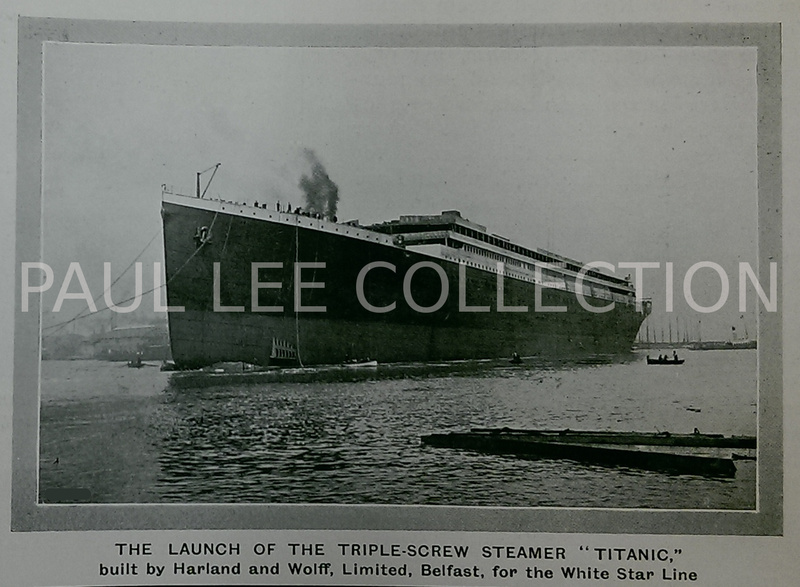 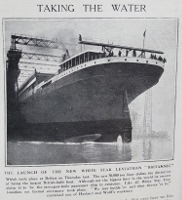 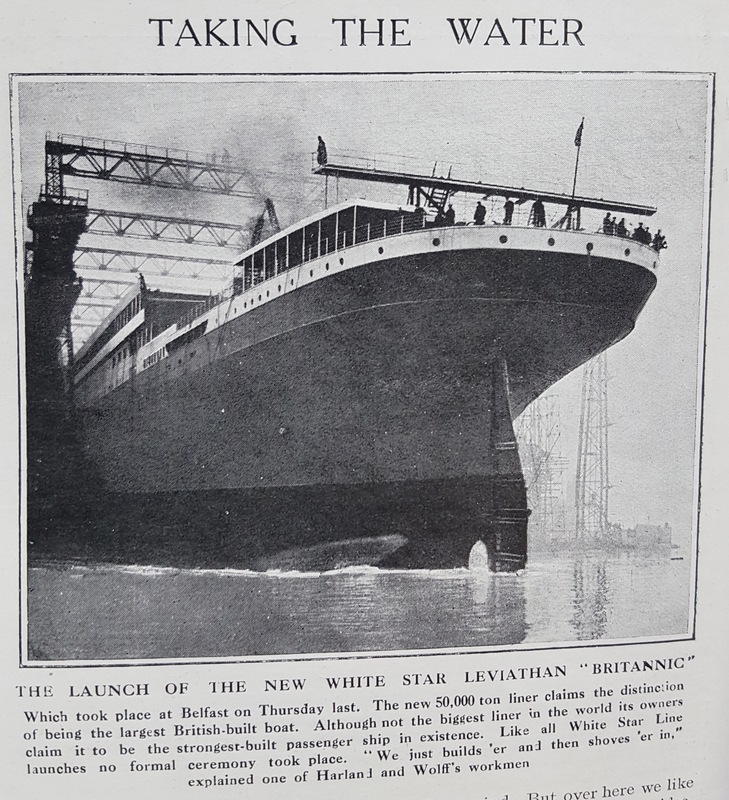 The Britannic is launched; note the comment by a Harland and Wolff worker; "We just builds 'er and then shoves 'er in." 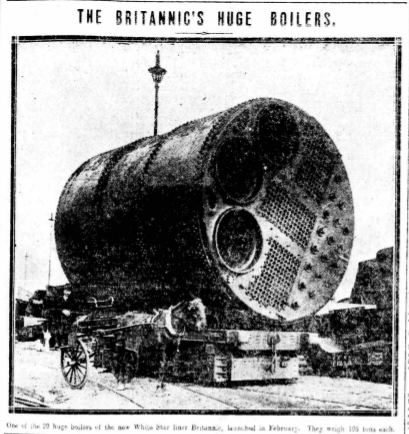 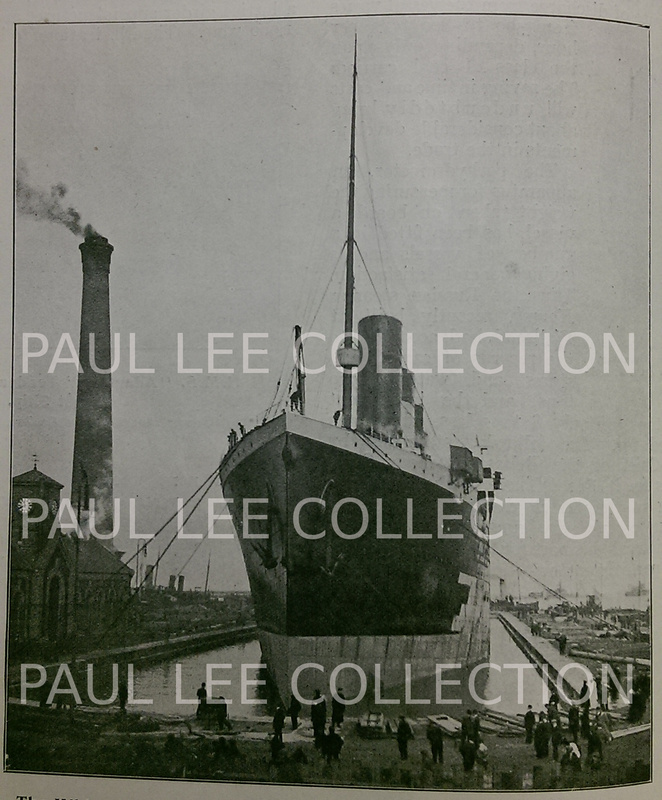 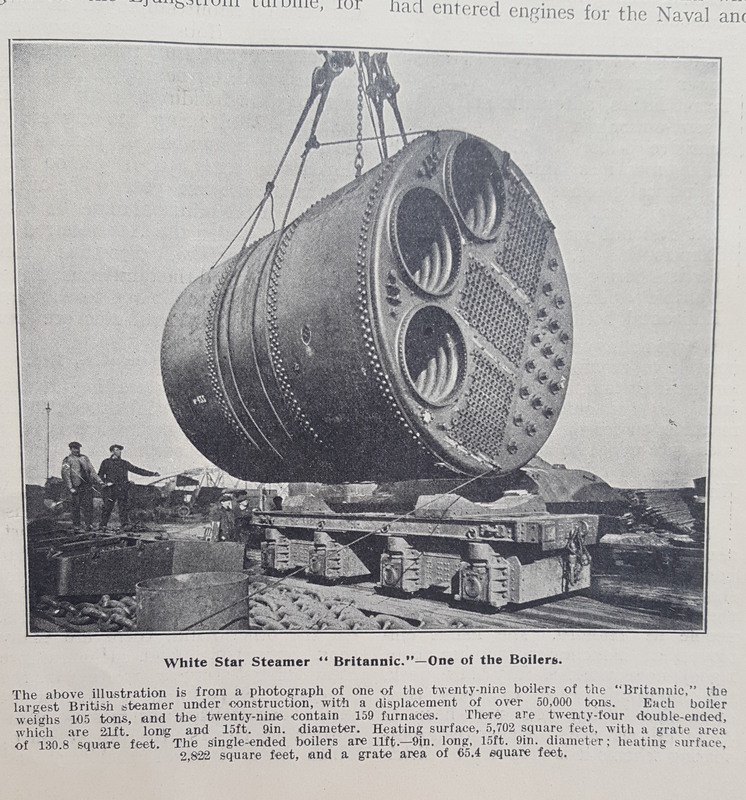 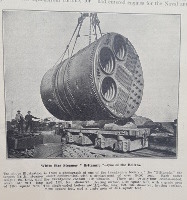 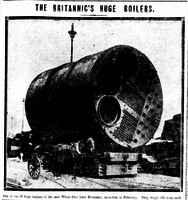 The Liverpool Express of April 25th, 1914; one of the Britannic's massive boilers.